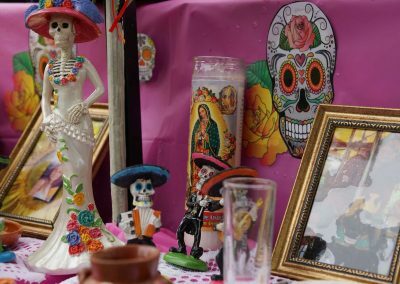 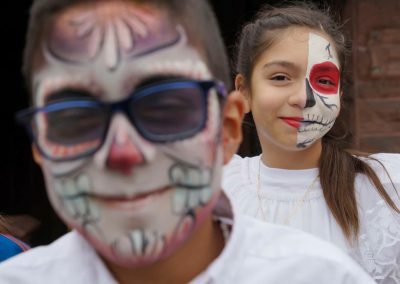 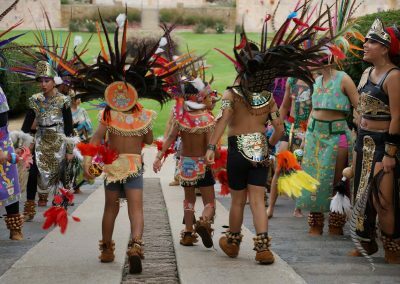 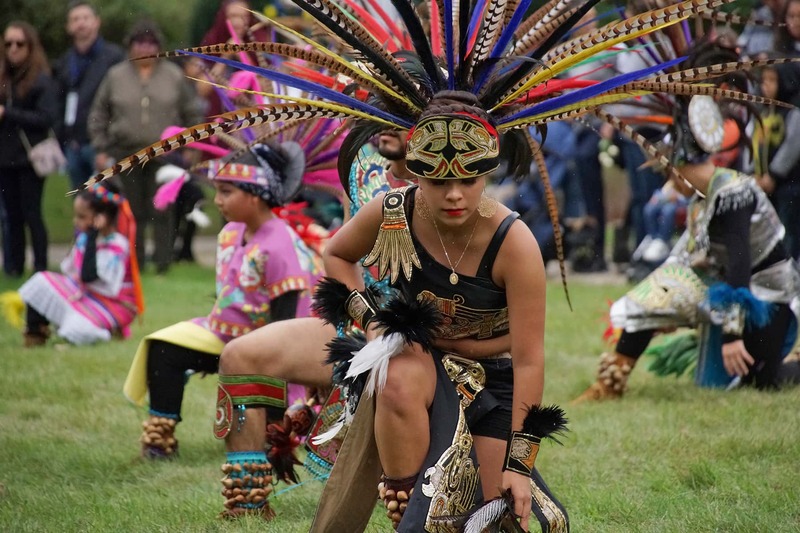 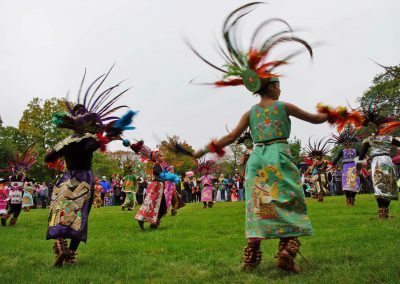 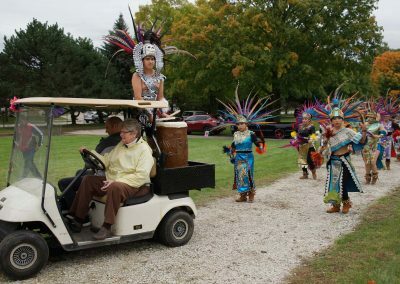 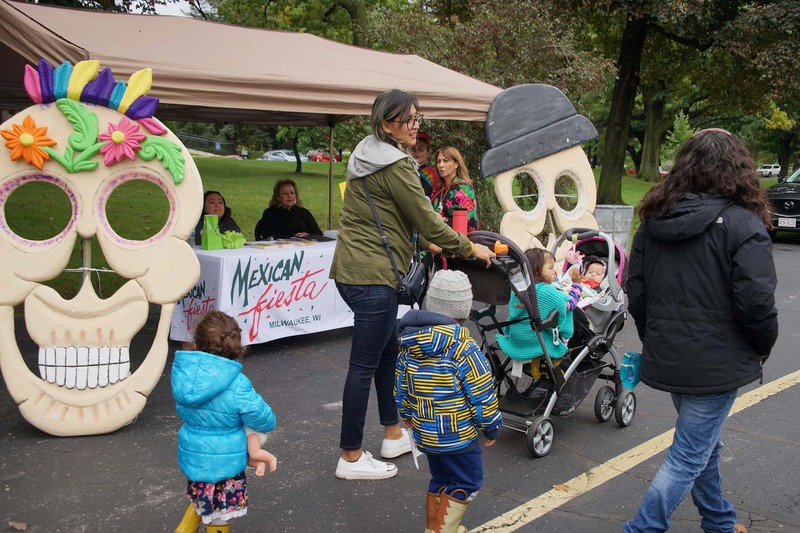 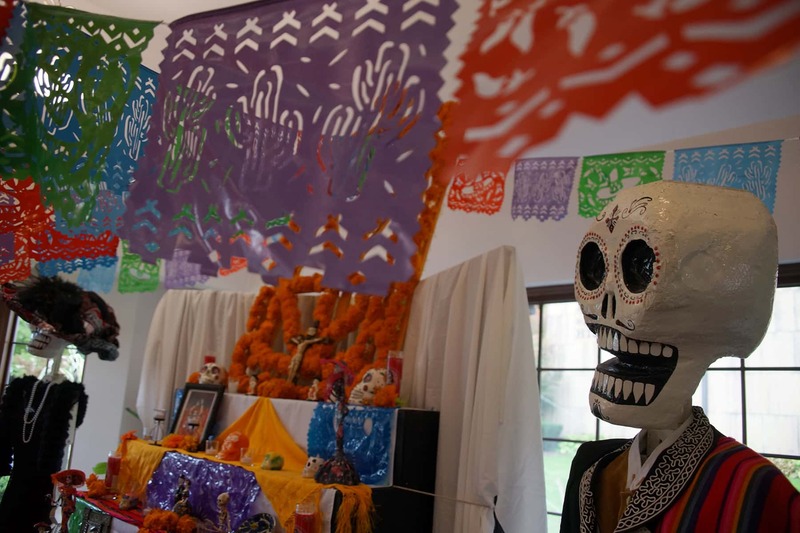 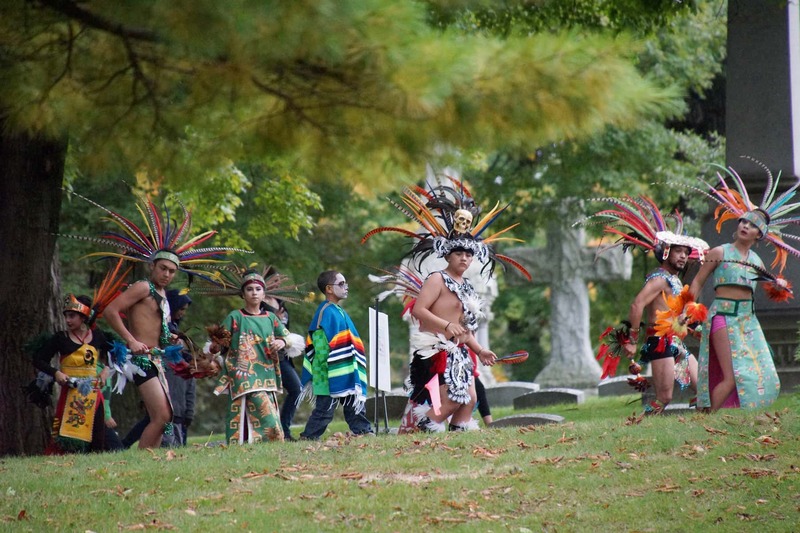 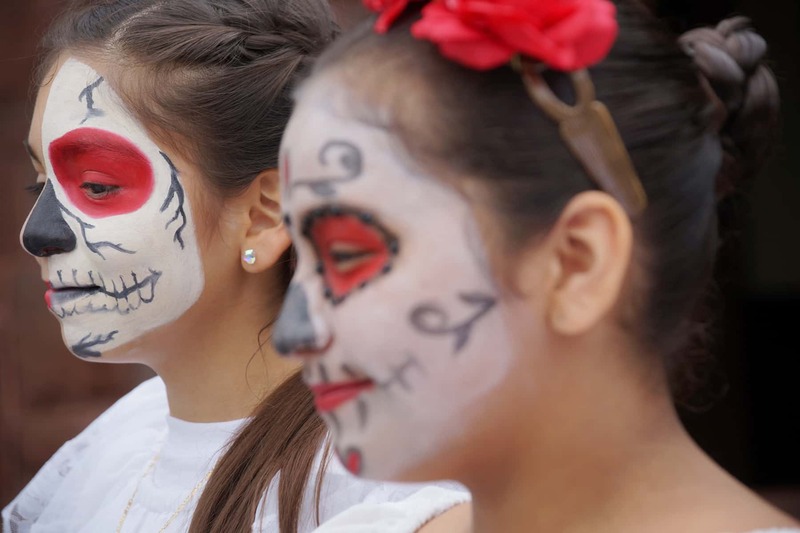 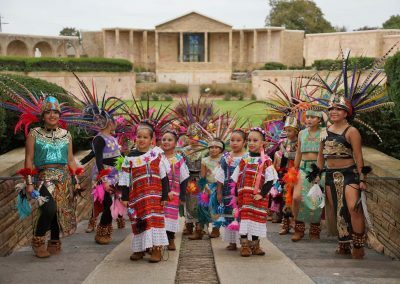 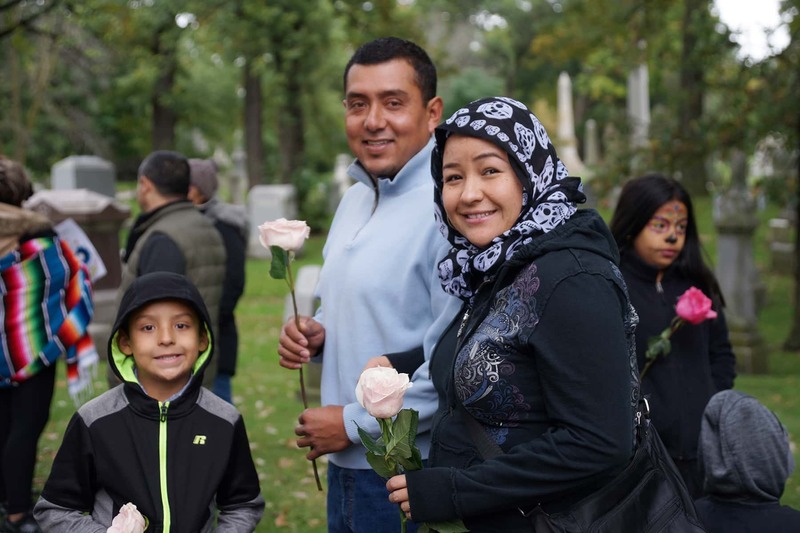 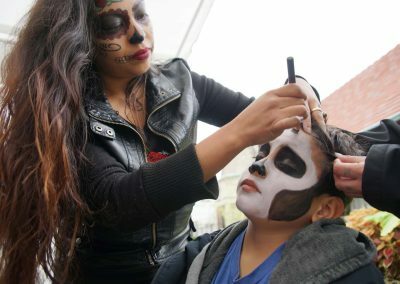 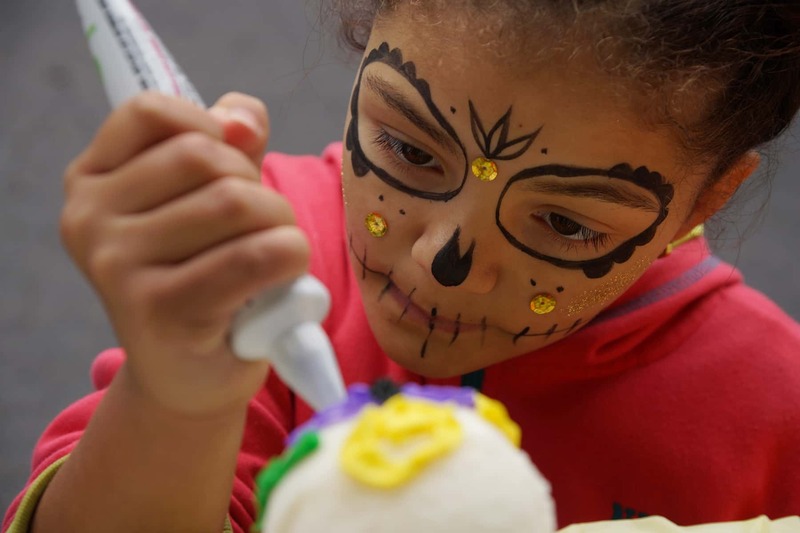 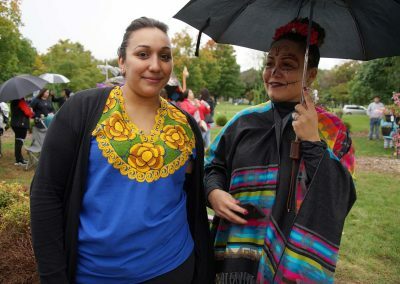 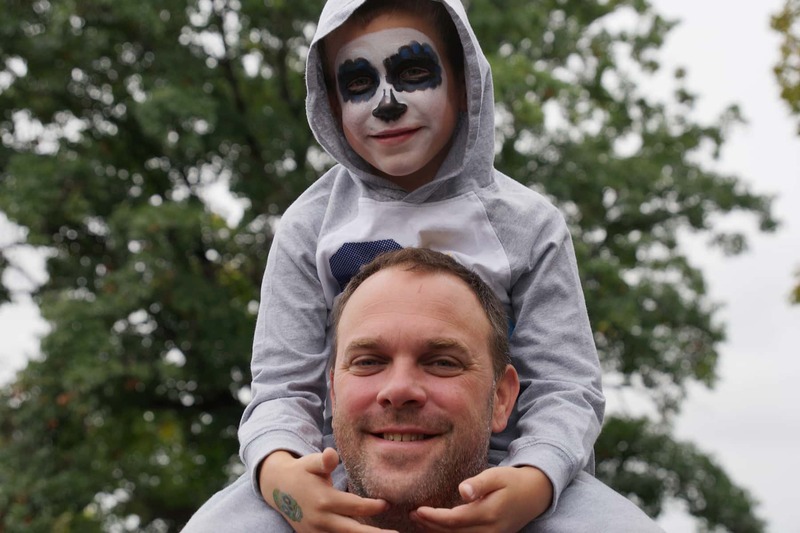 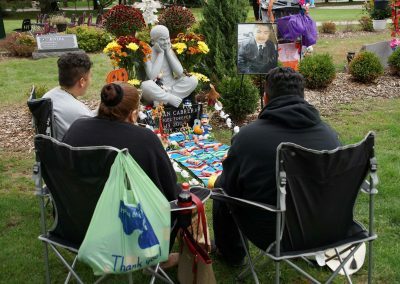 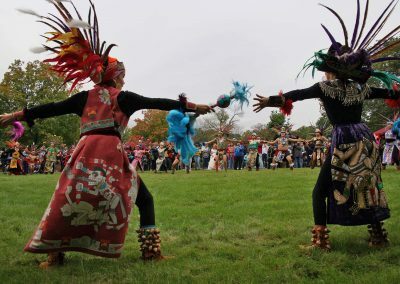 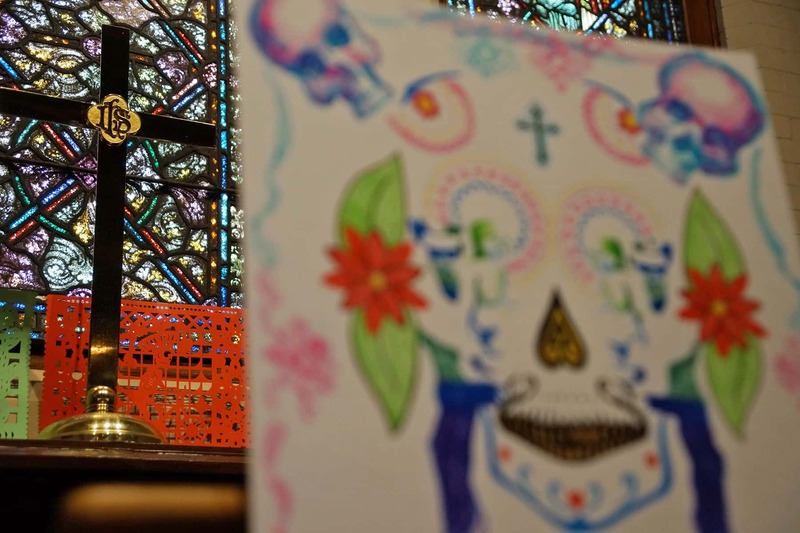 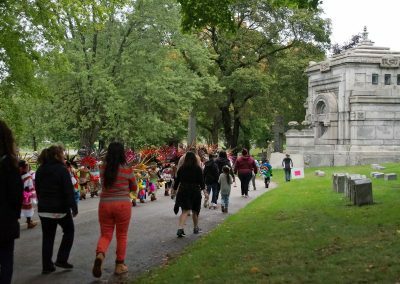 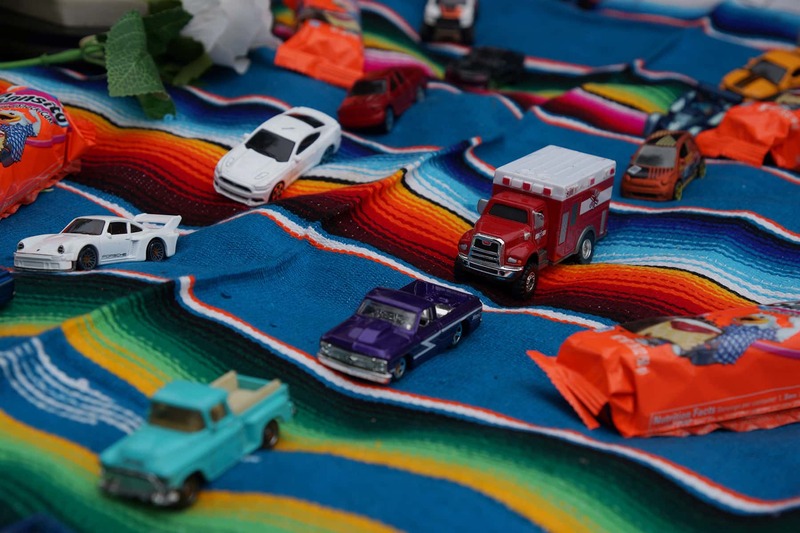 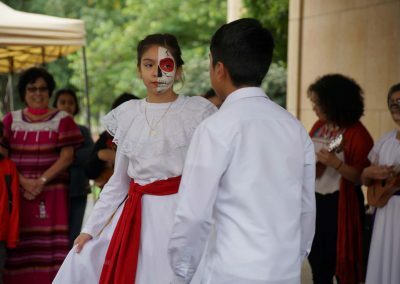 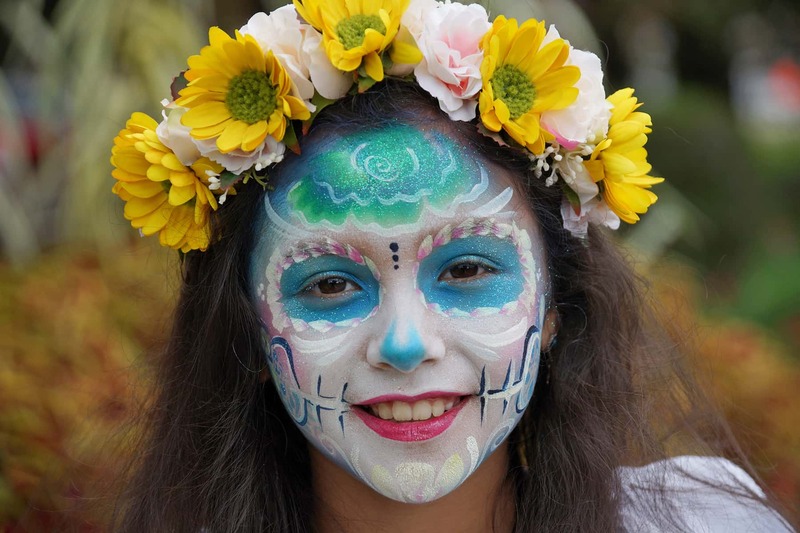 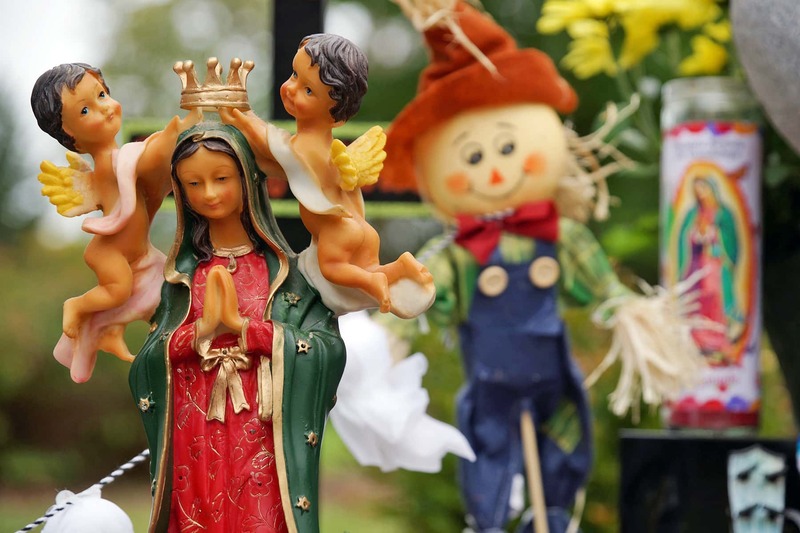 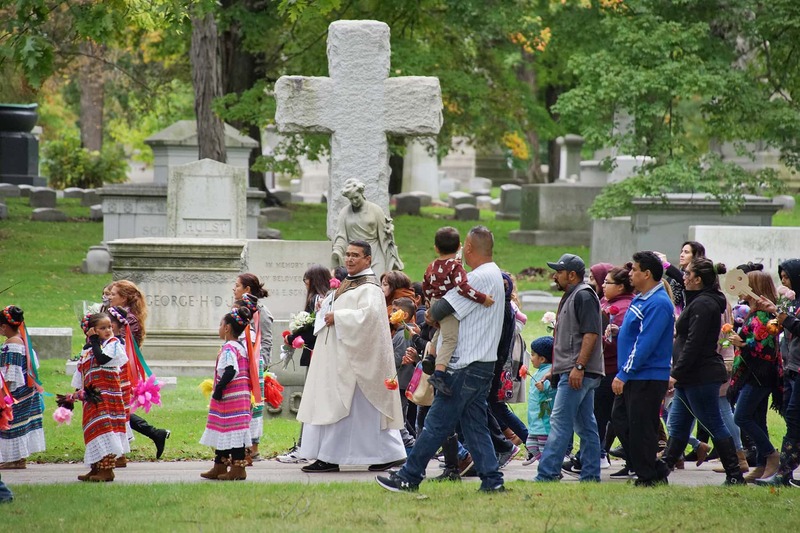 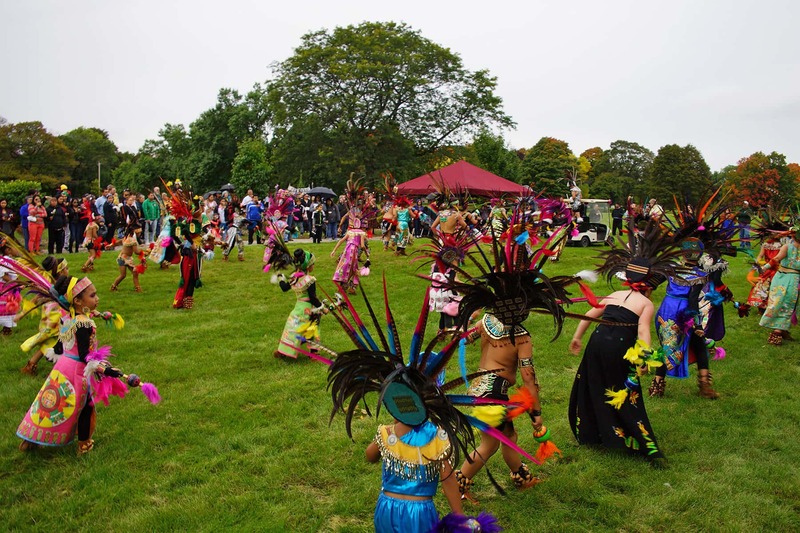 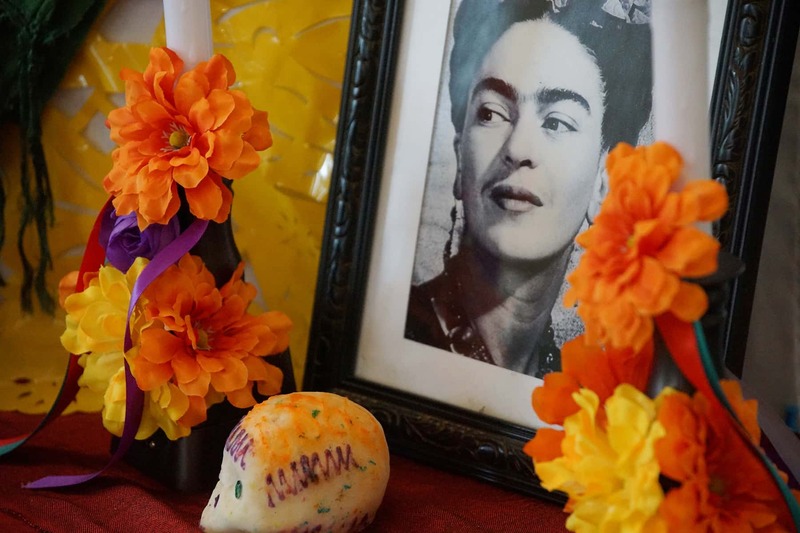 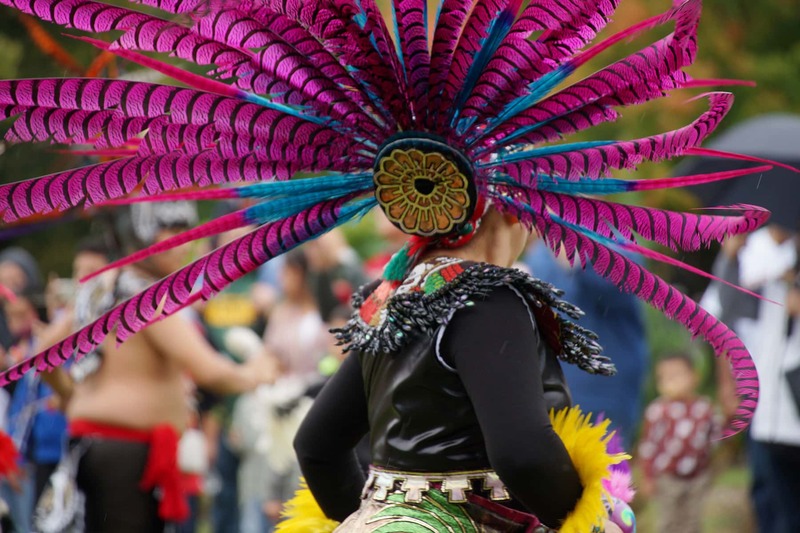 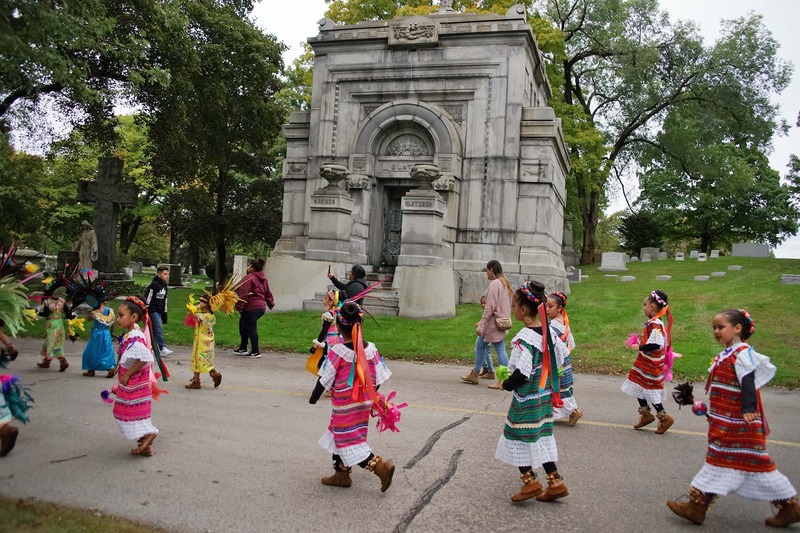 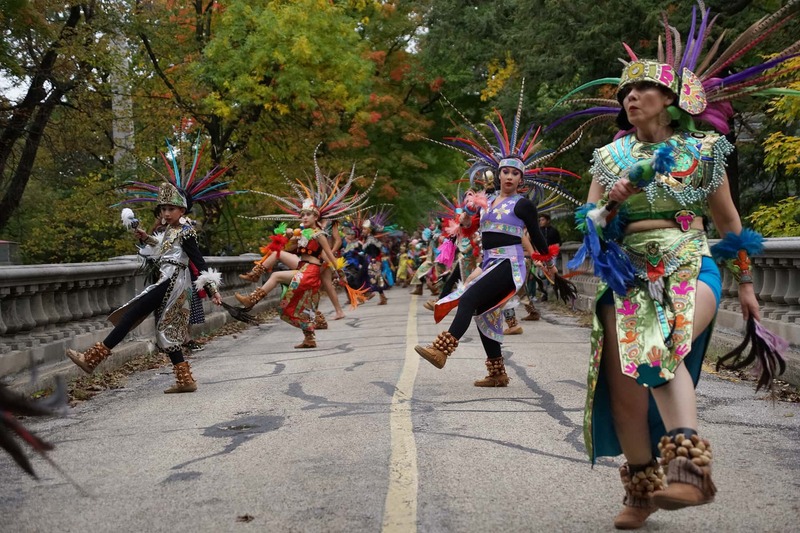 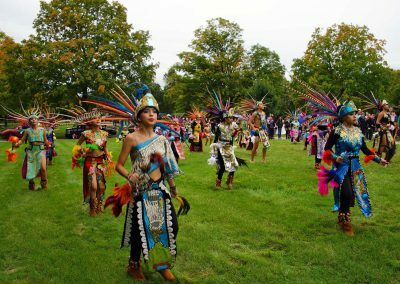 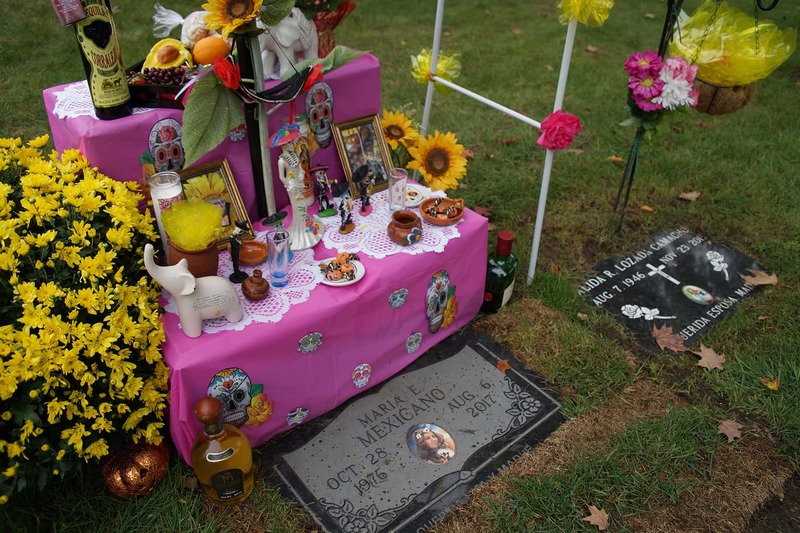 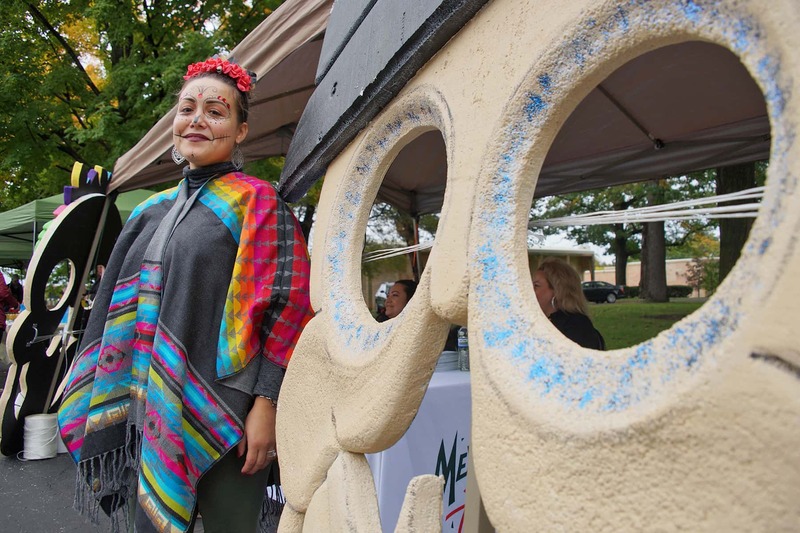 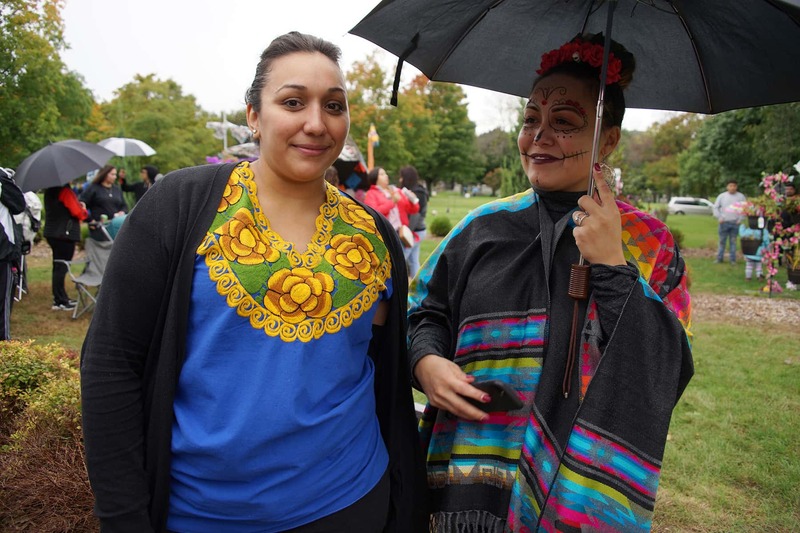 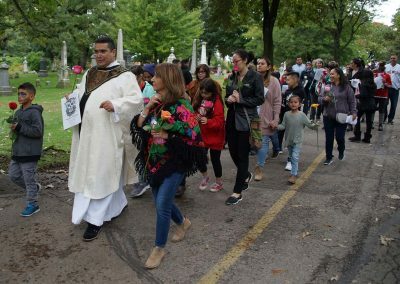 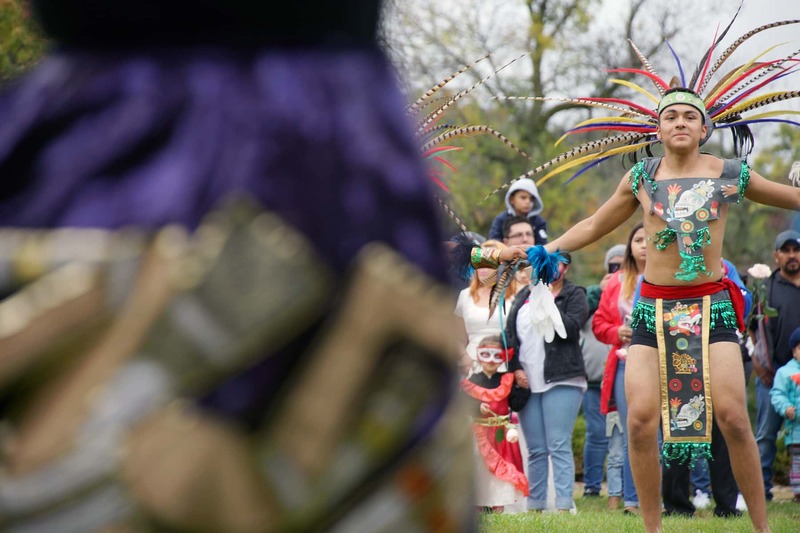 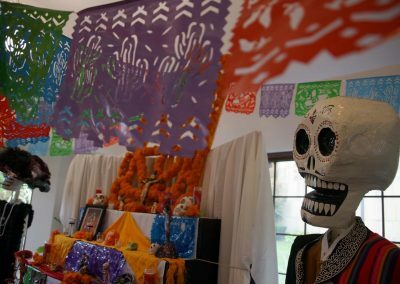 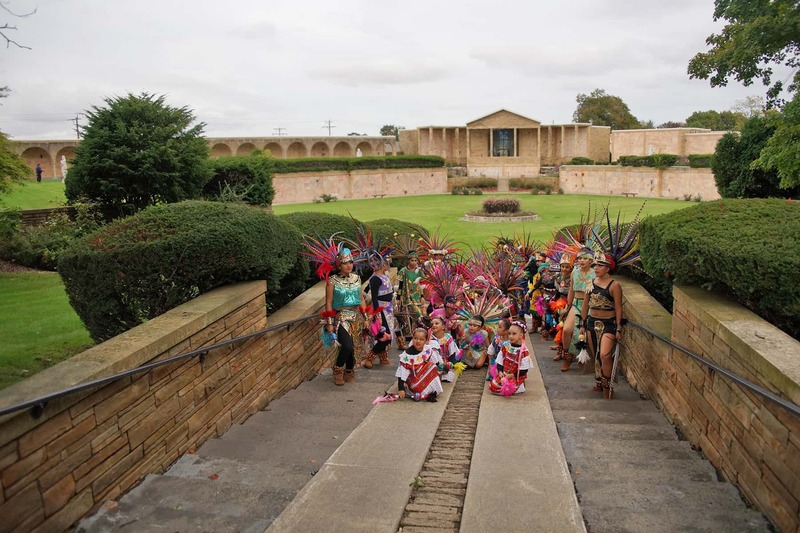 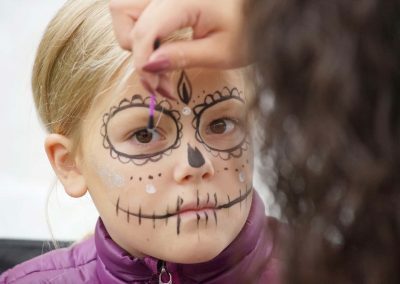 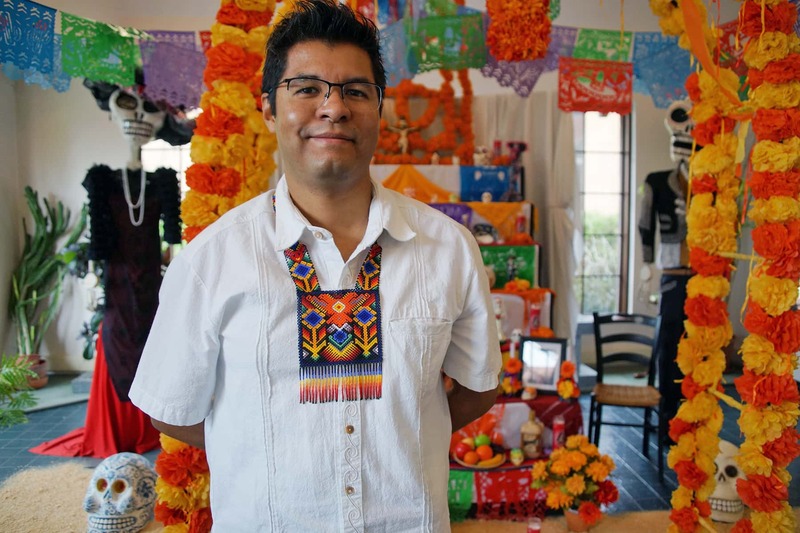 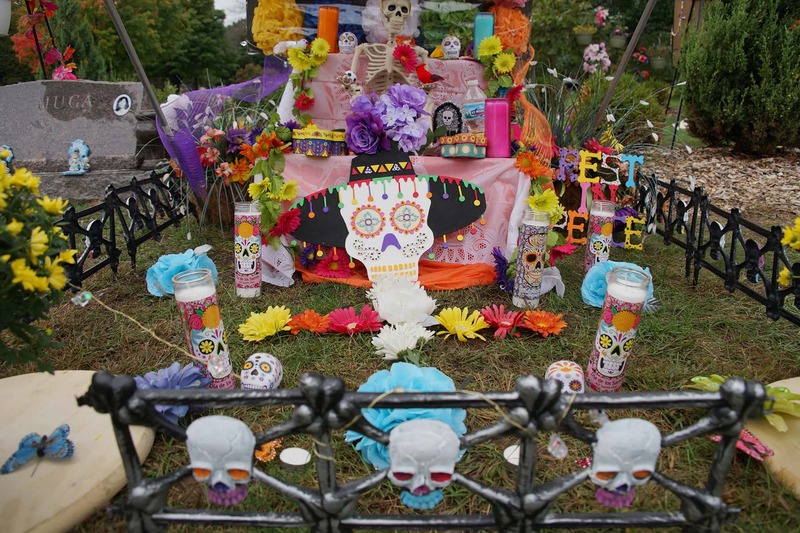 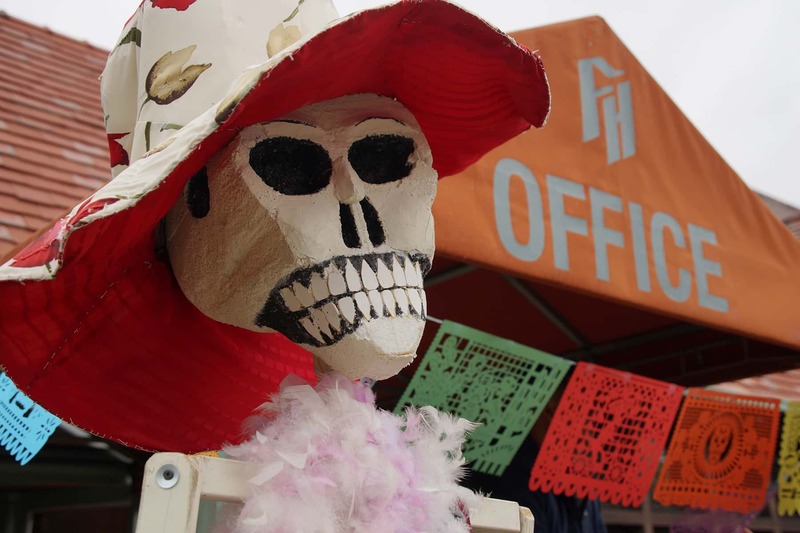 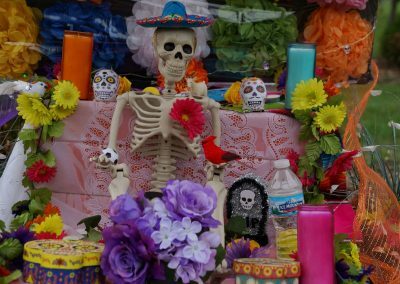 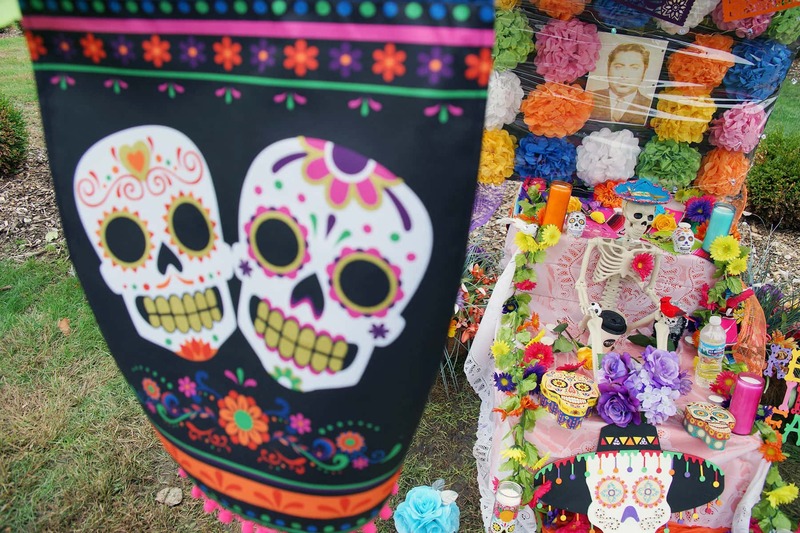 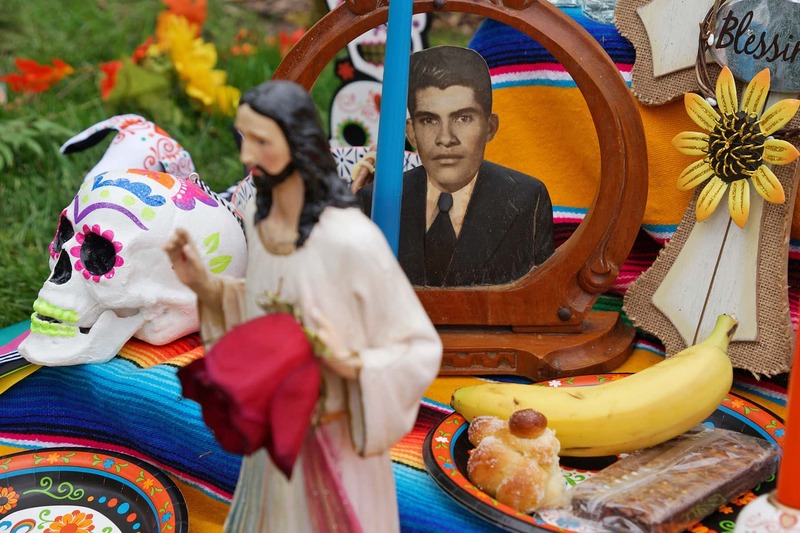 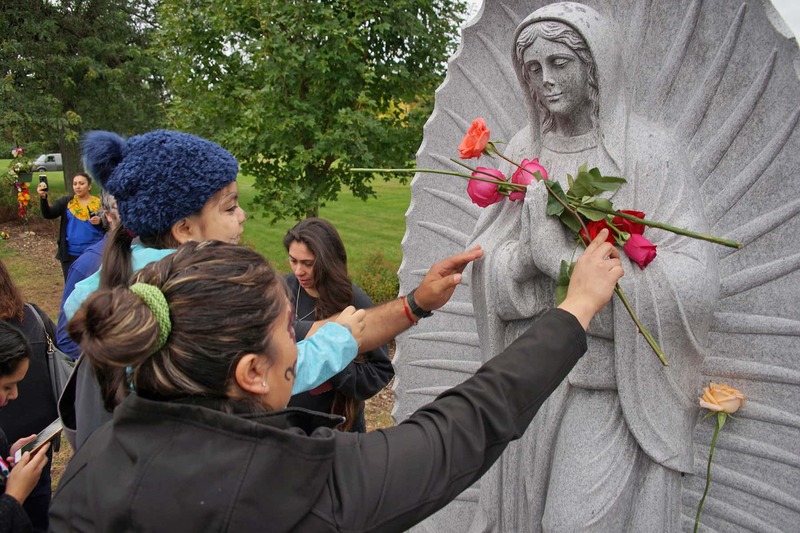 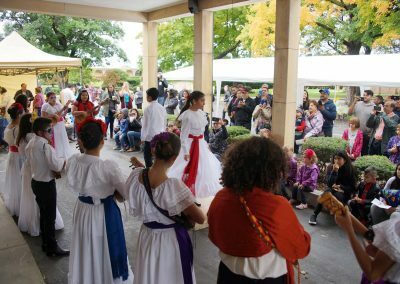 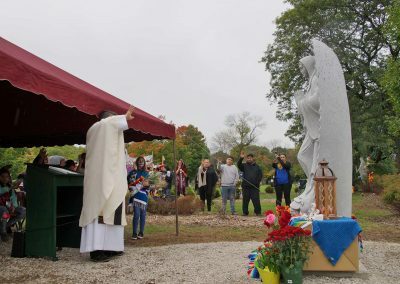 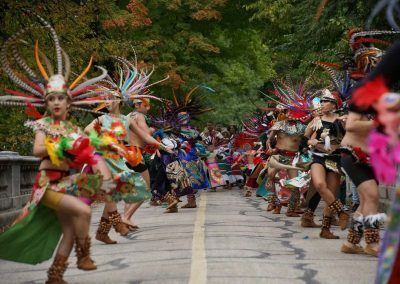 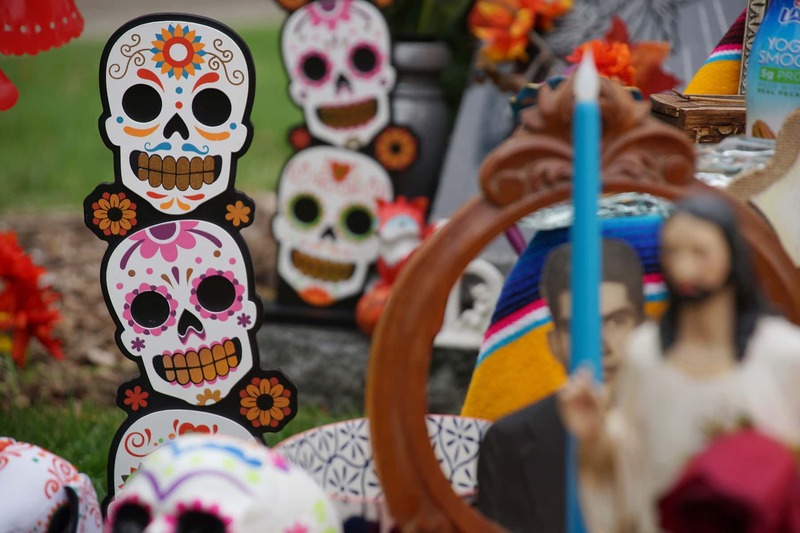 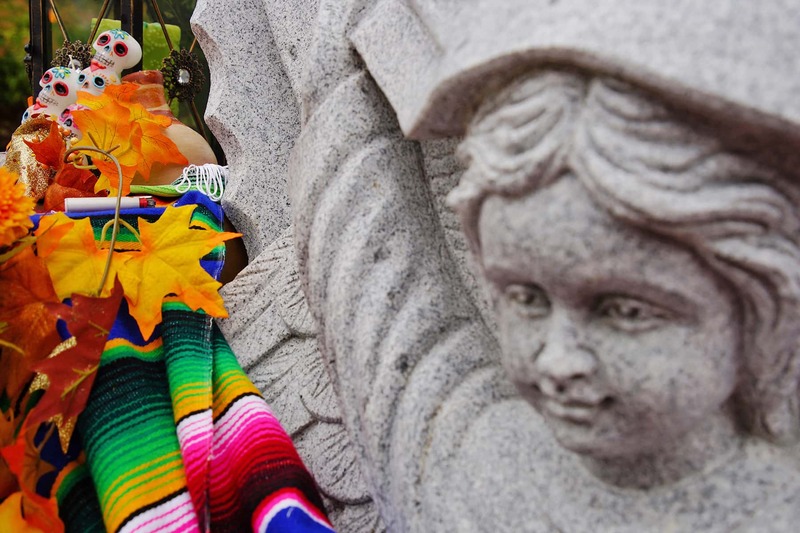 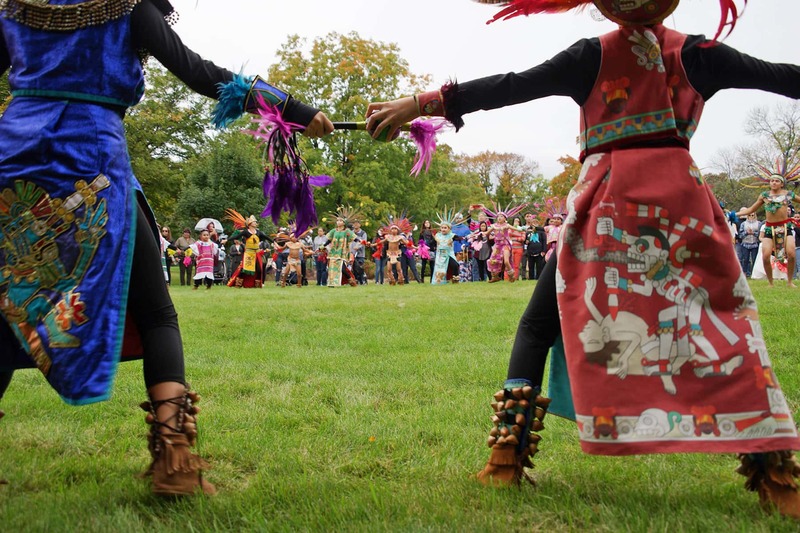 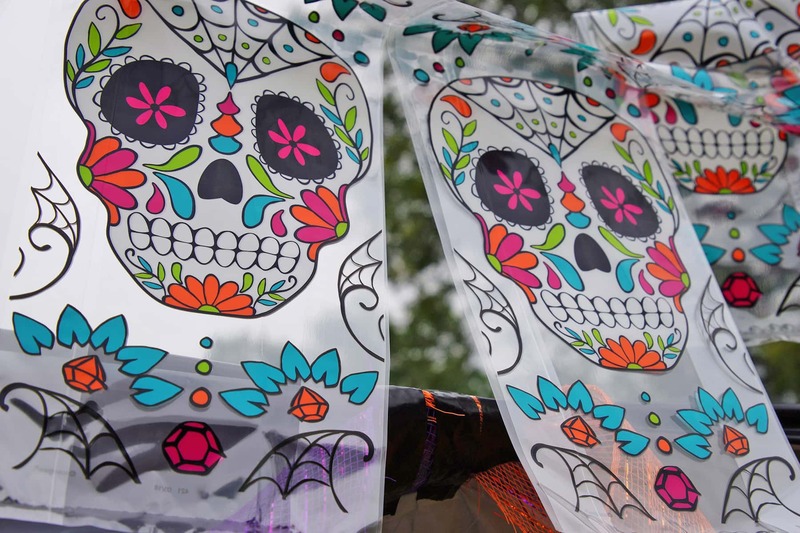 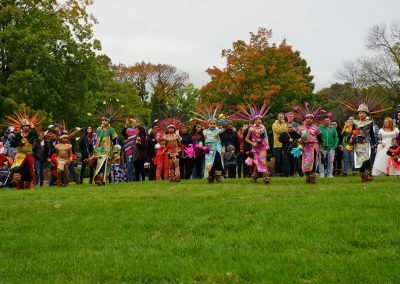 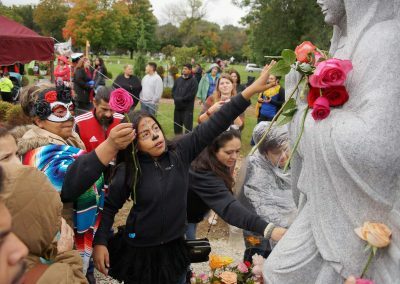 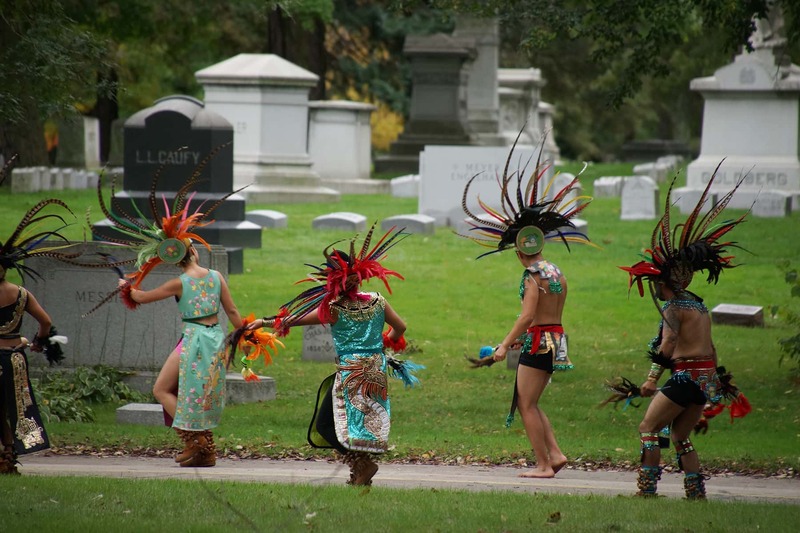 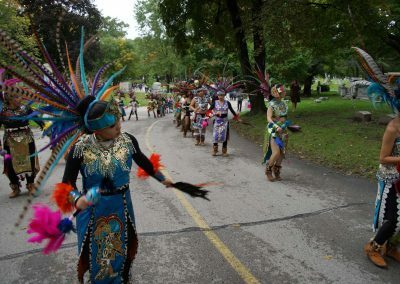 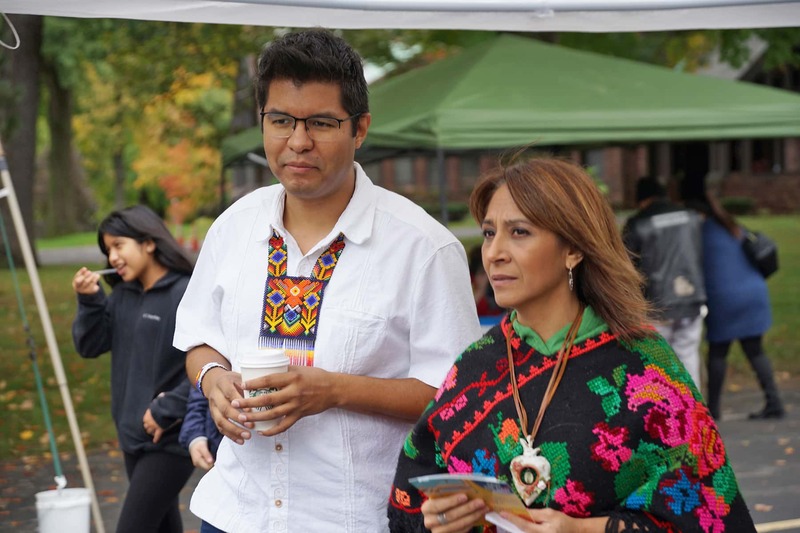 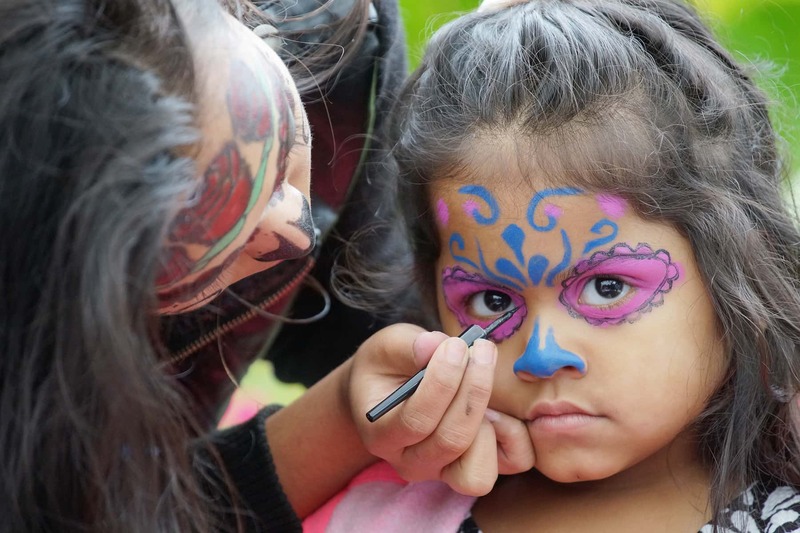 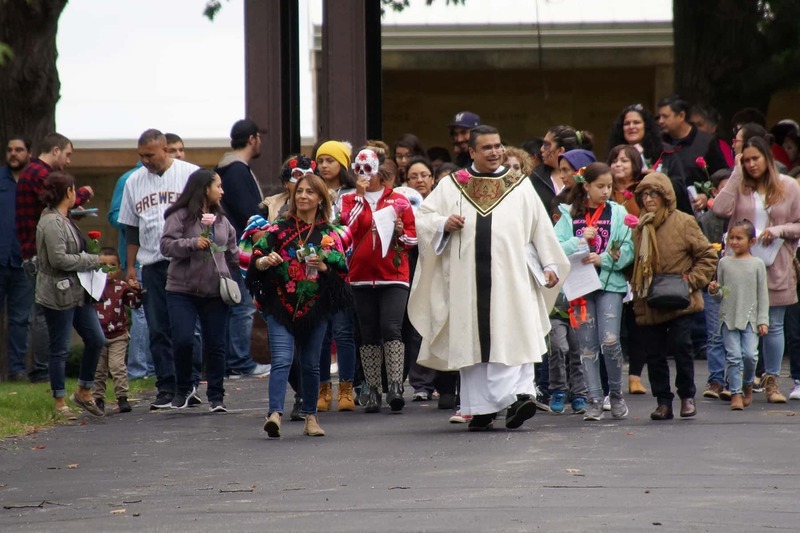 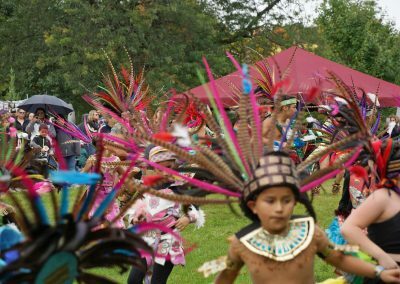 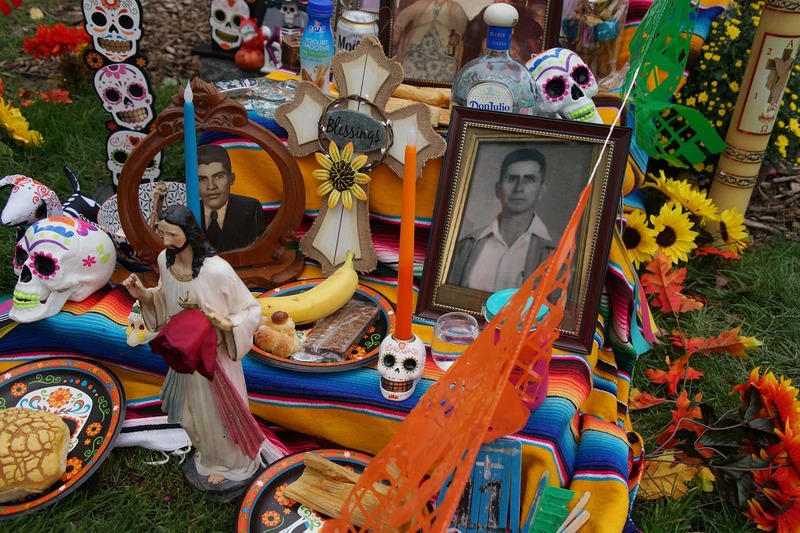 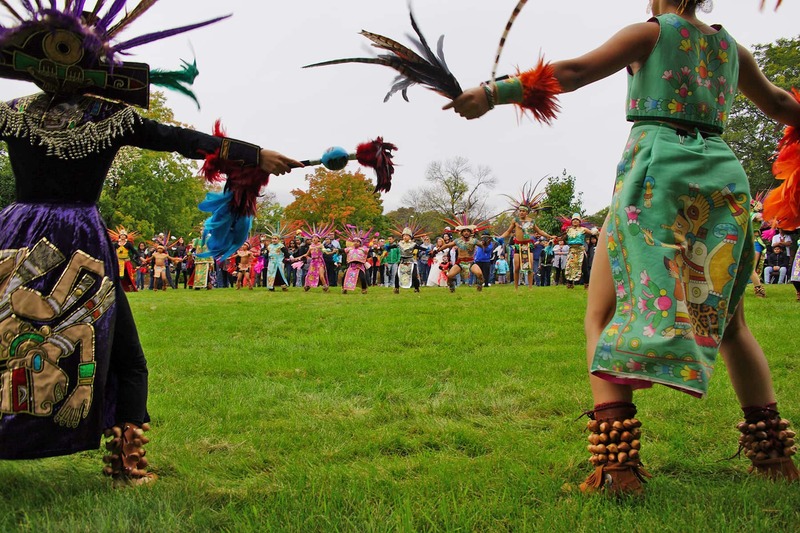 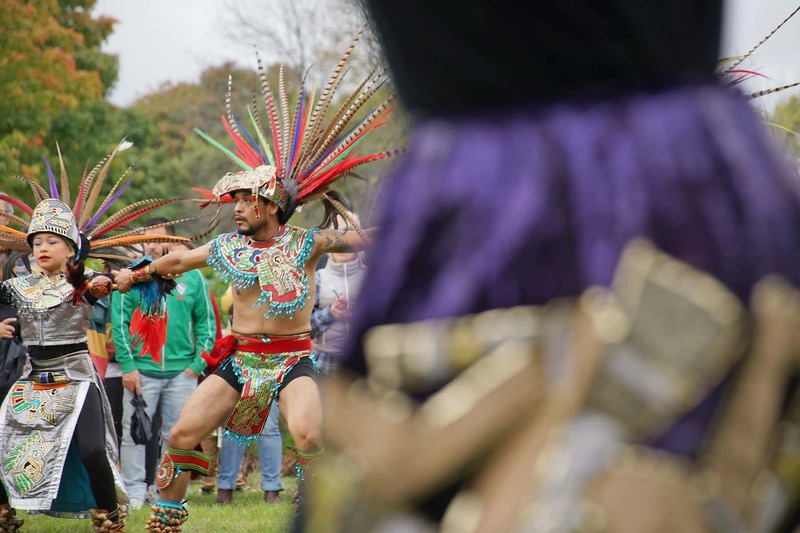 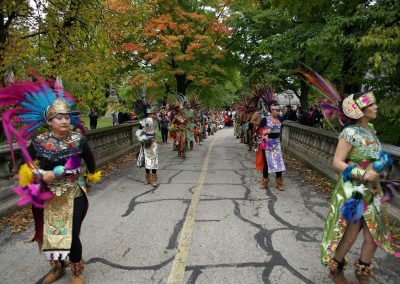 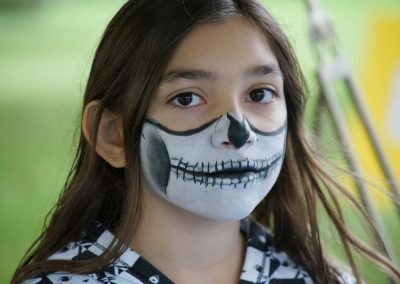 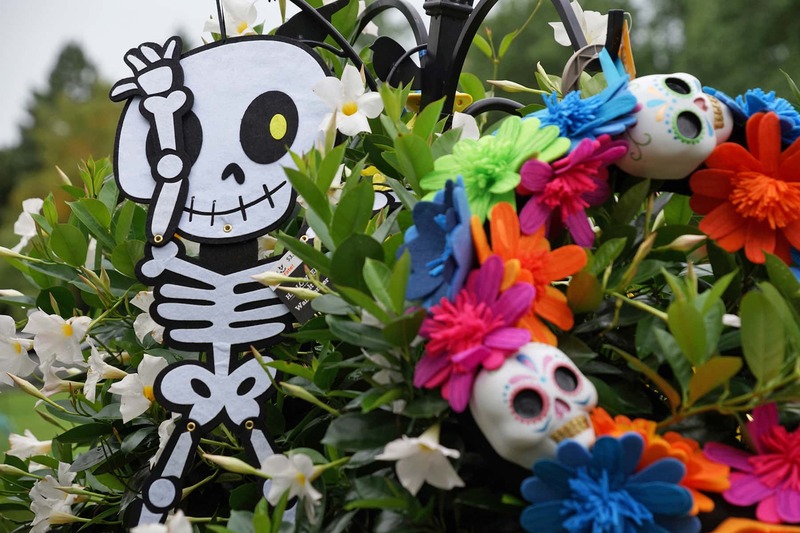 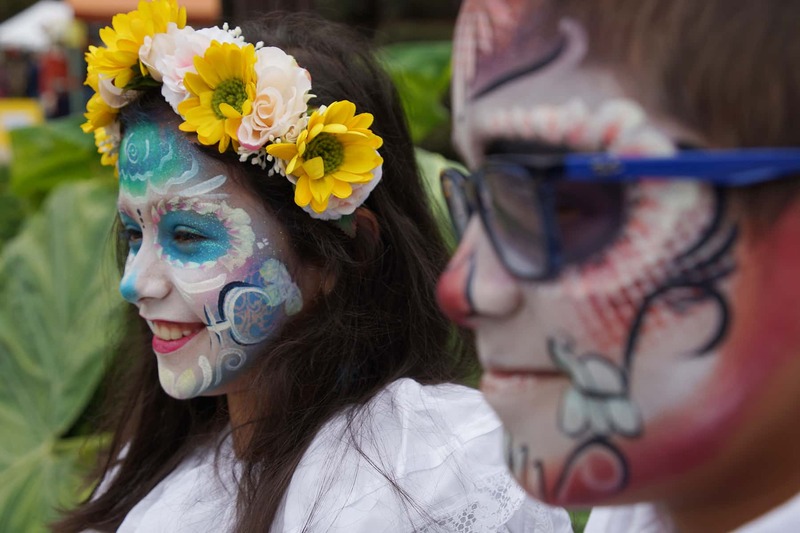 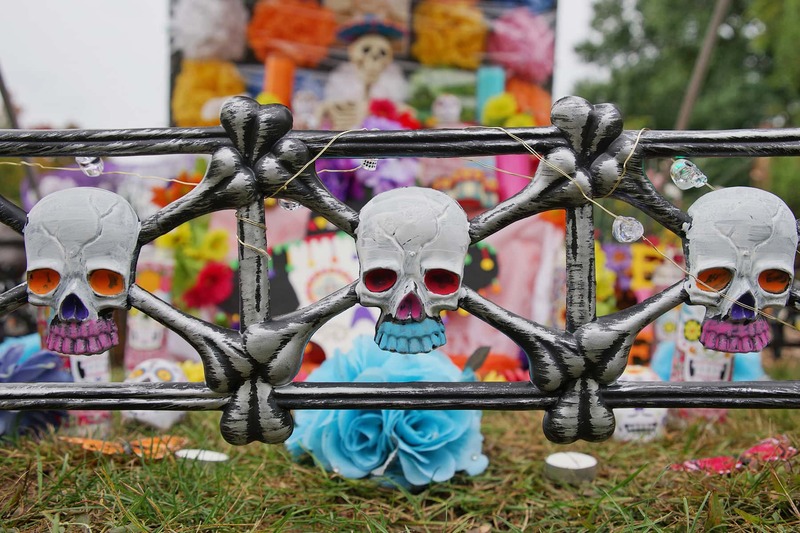 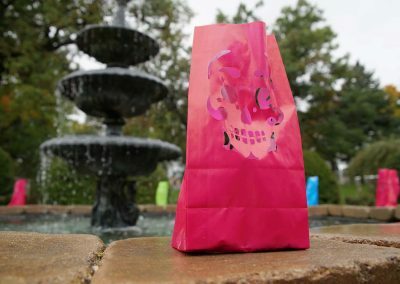 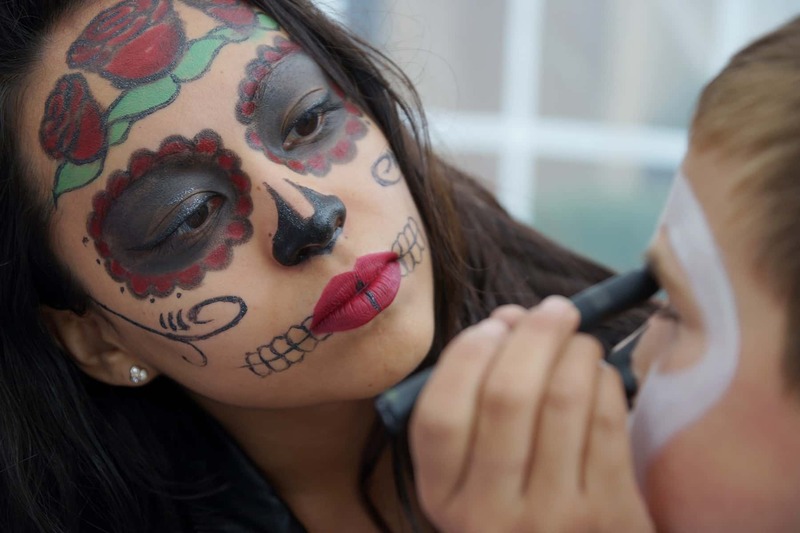 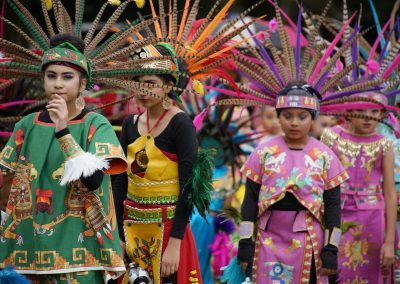 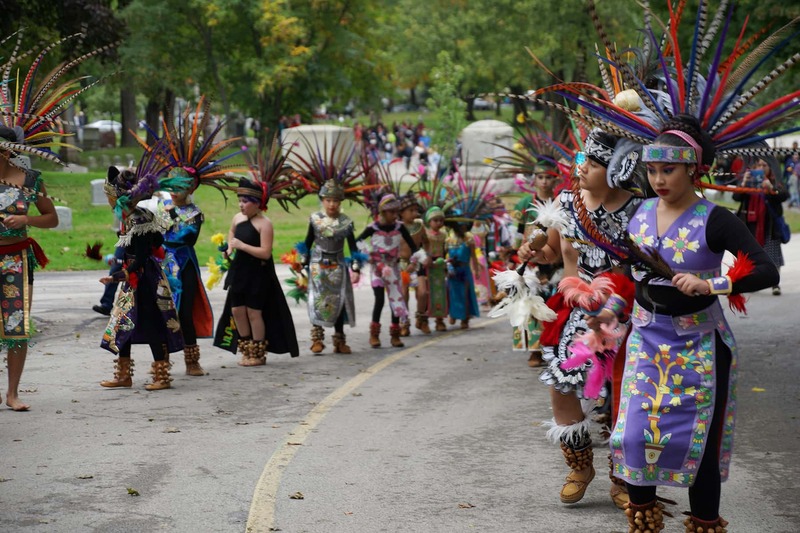 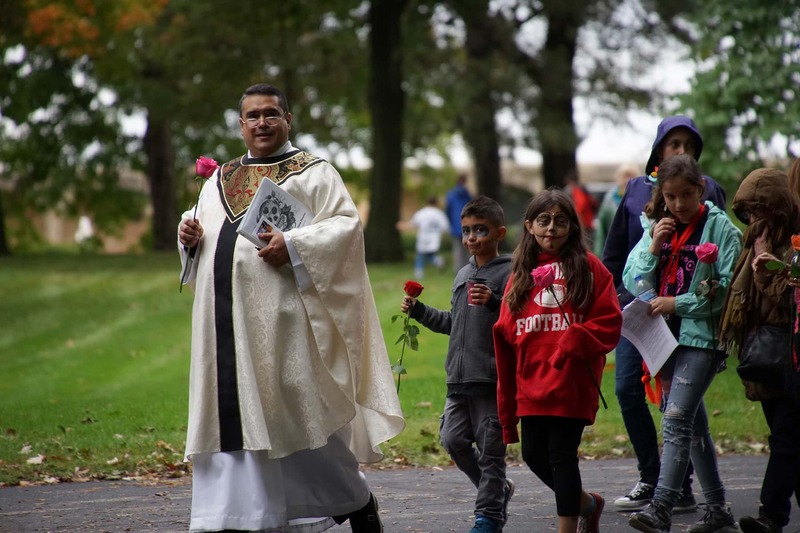 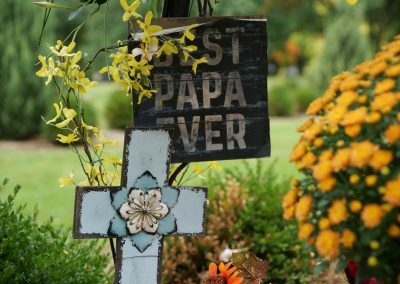 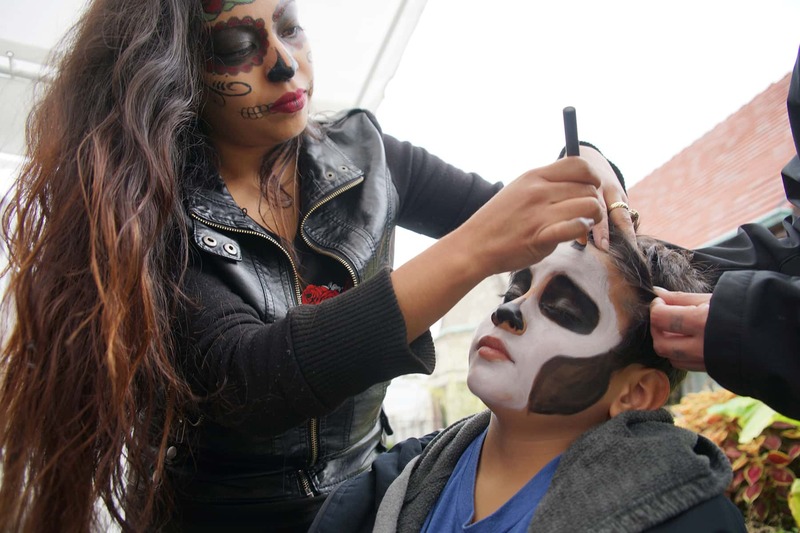 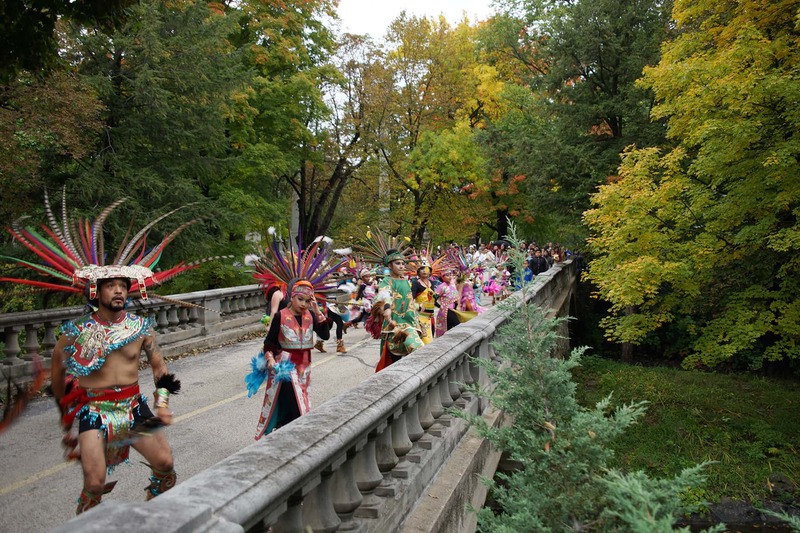 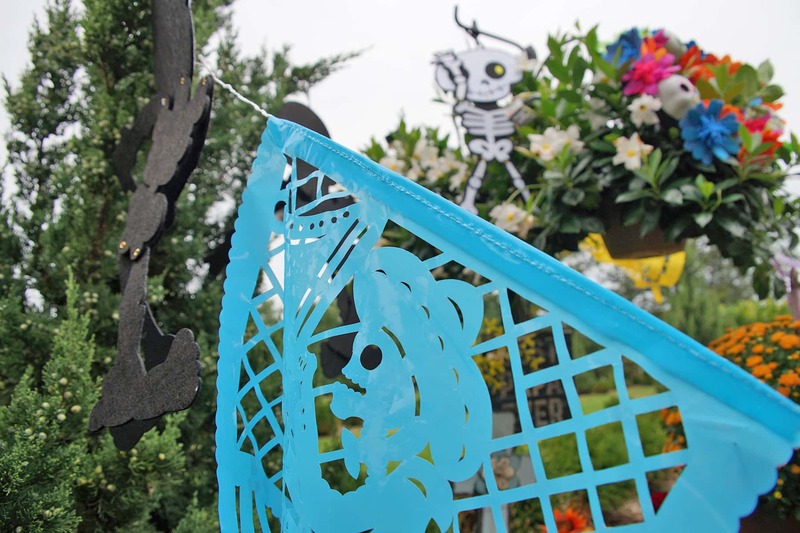 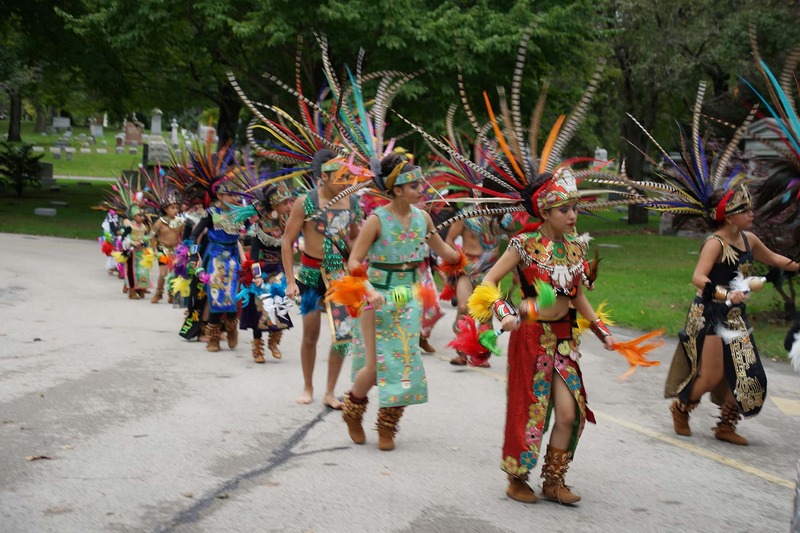 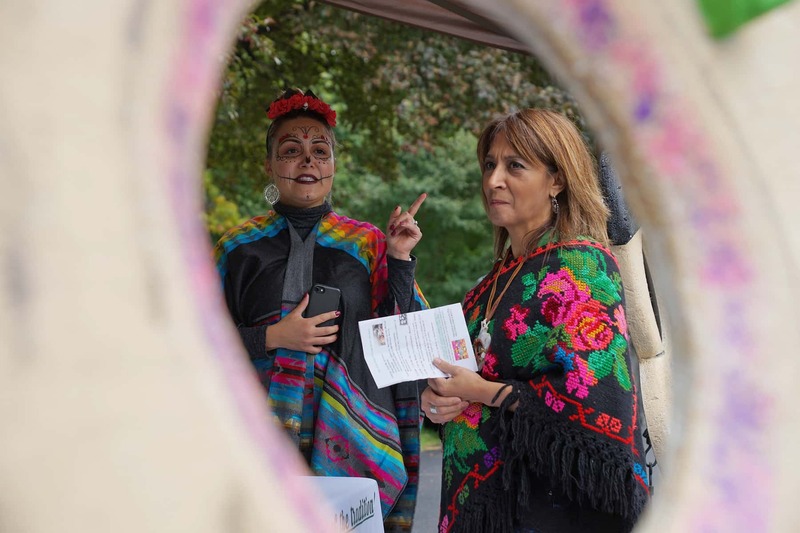 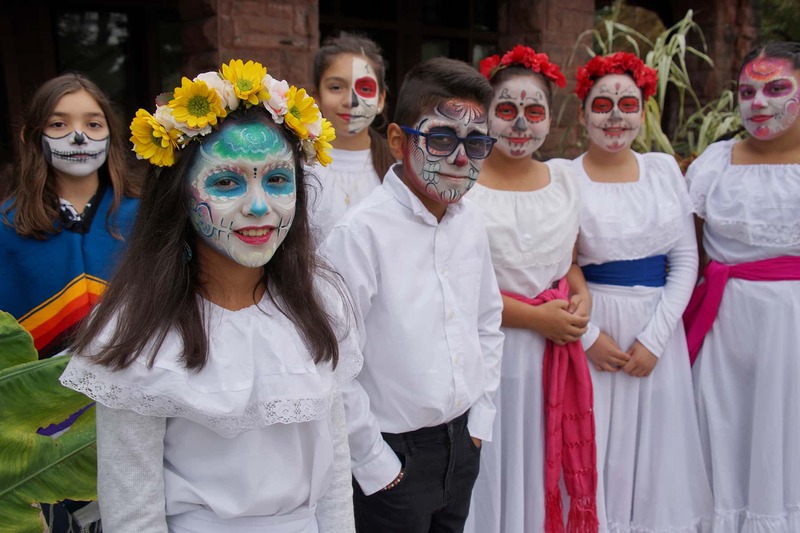 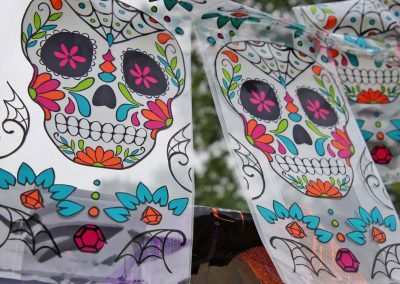 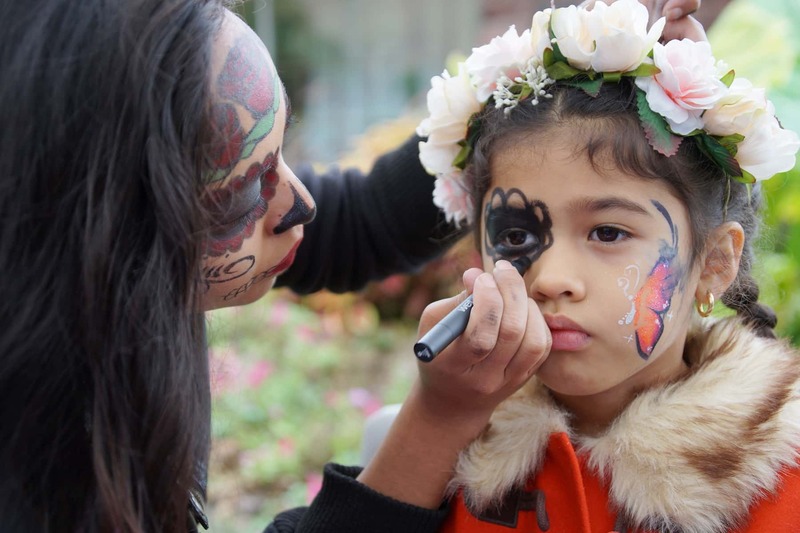 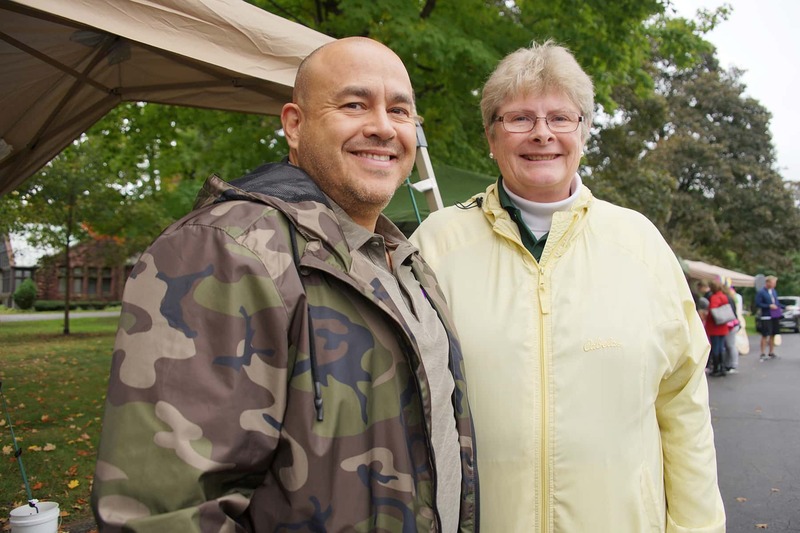 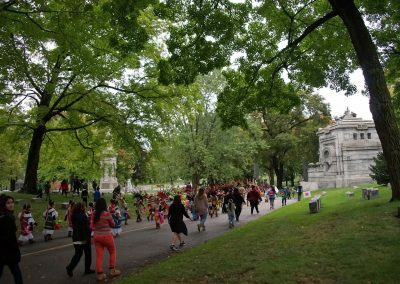 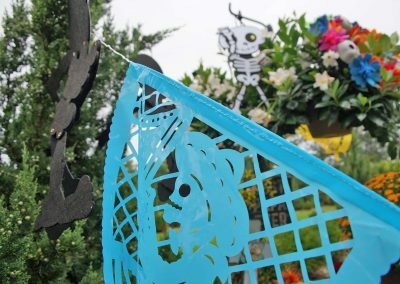 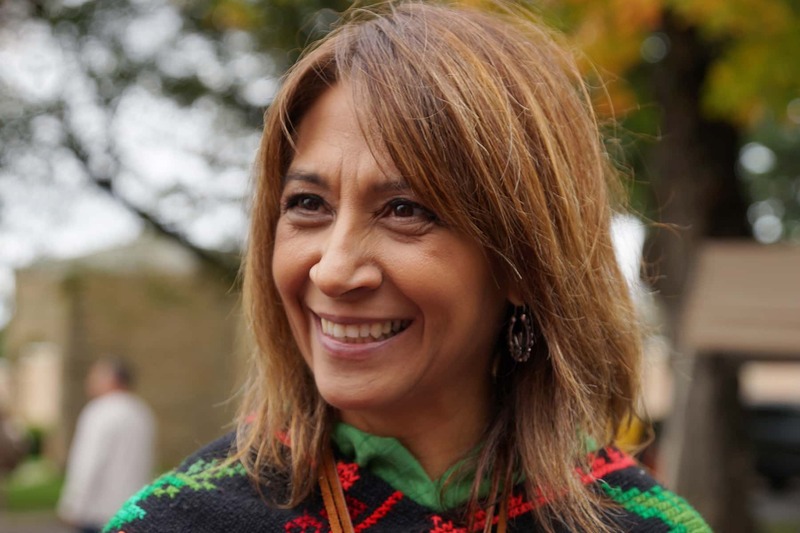 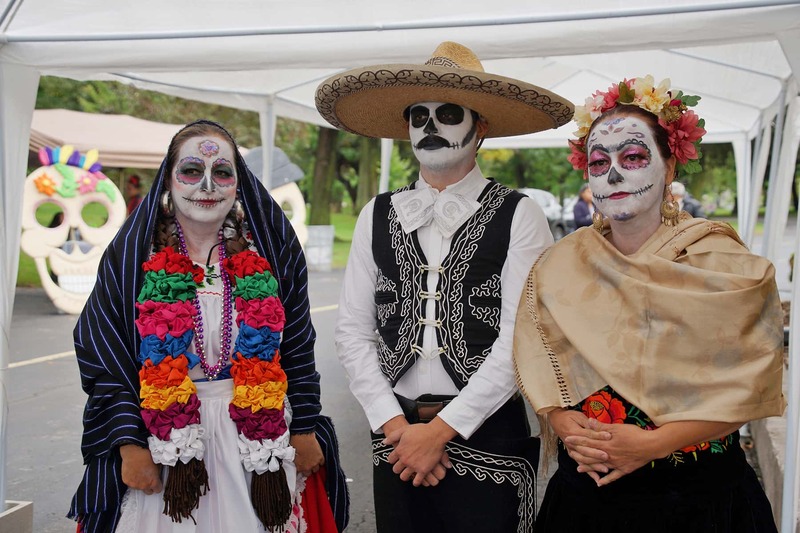 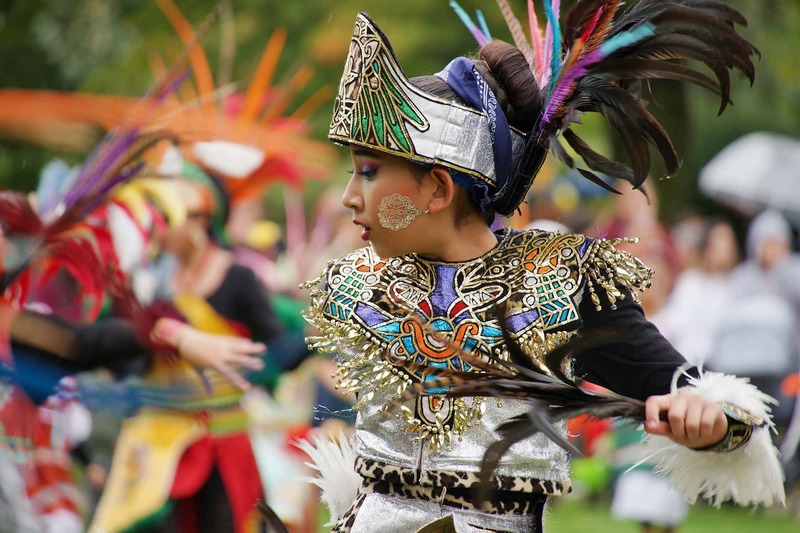 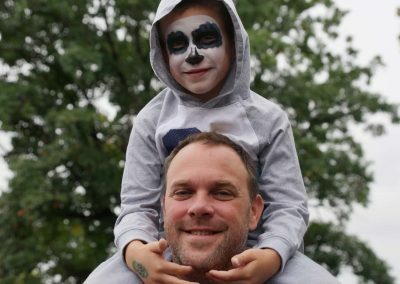 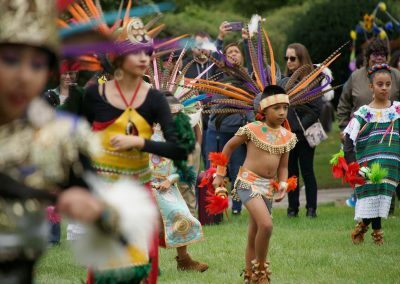 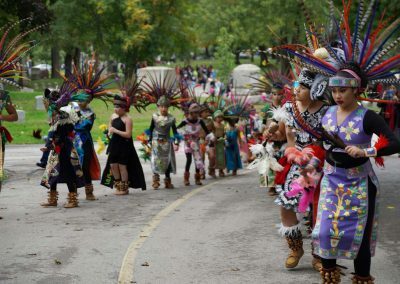 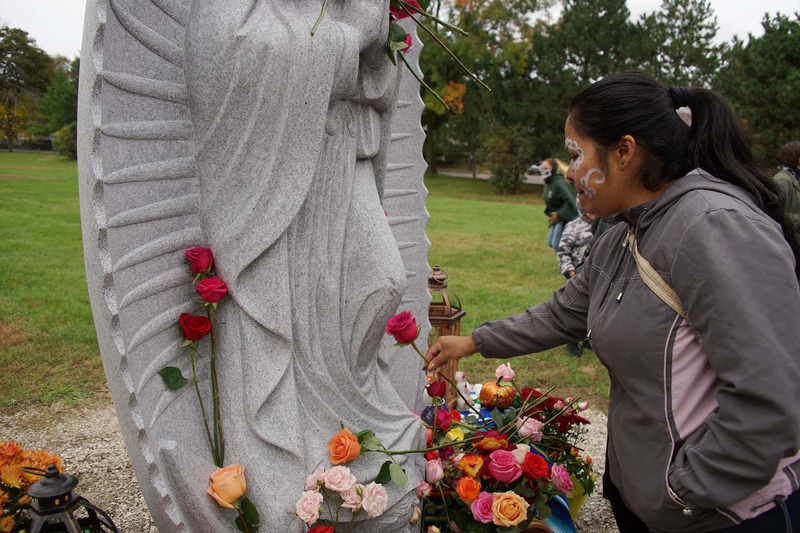 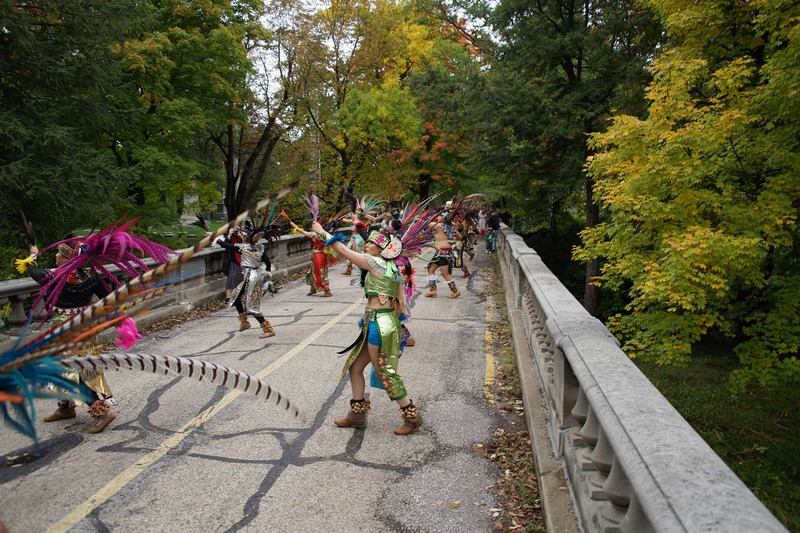 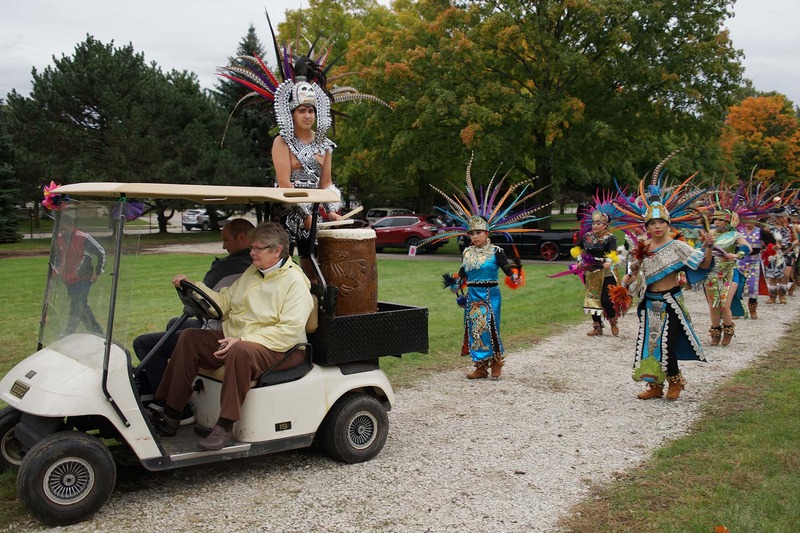 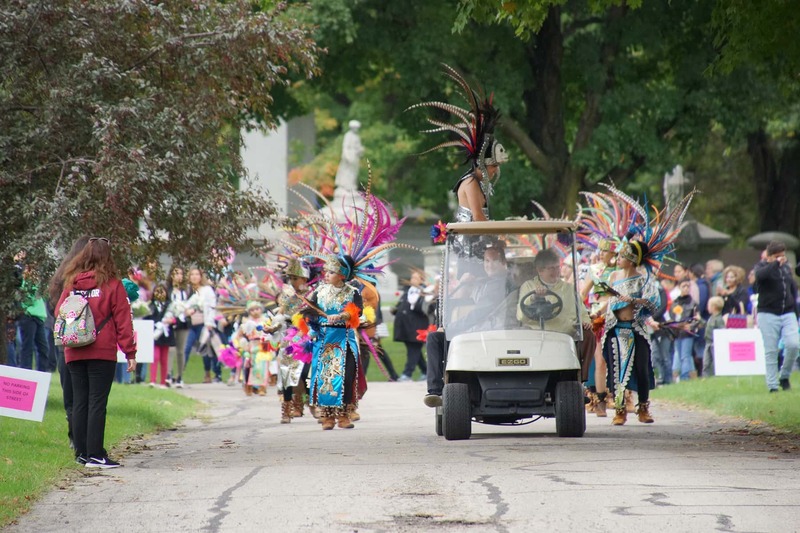 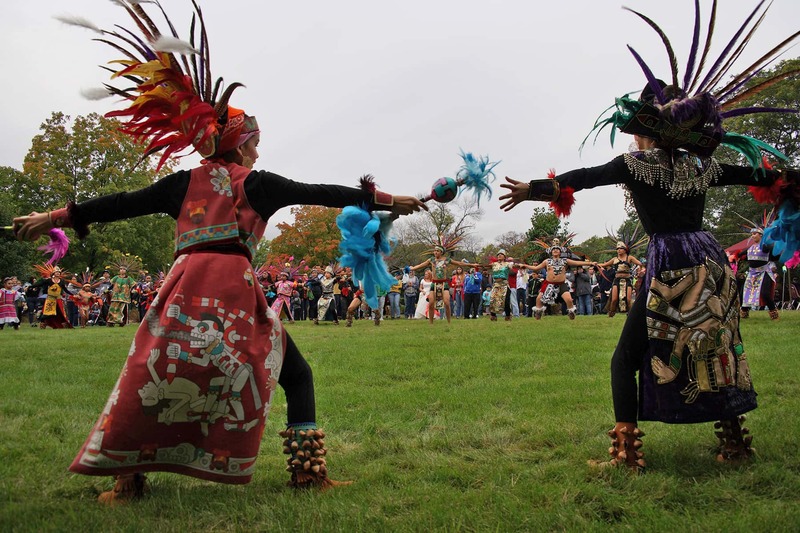 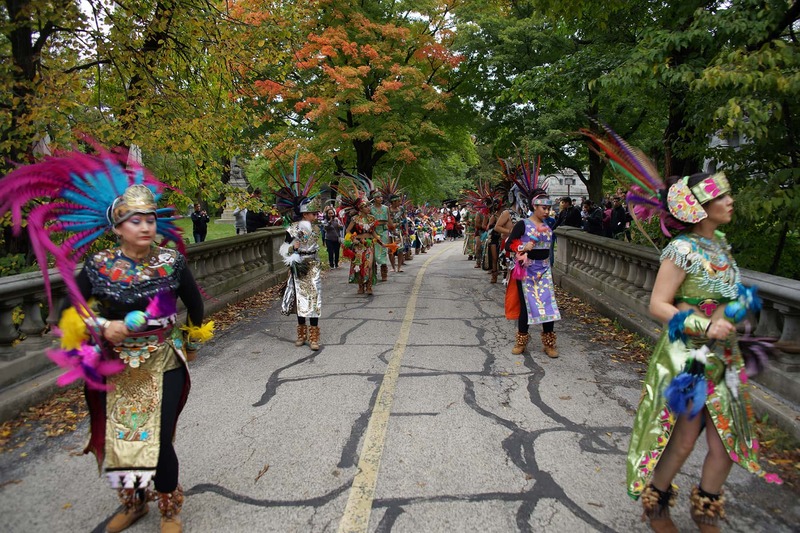 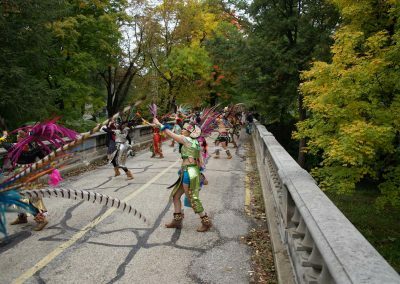 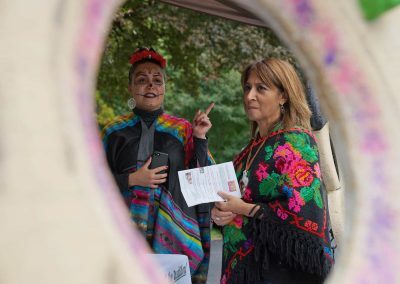 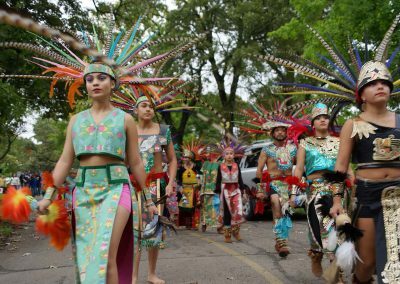 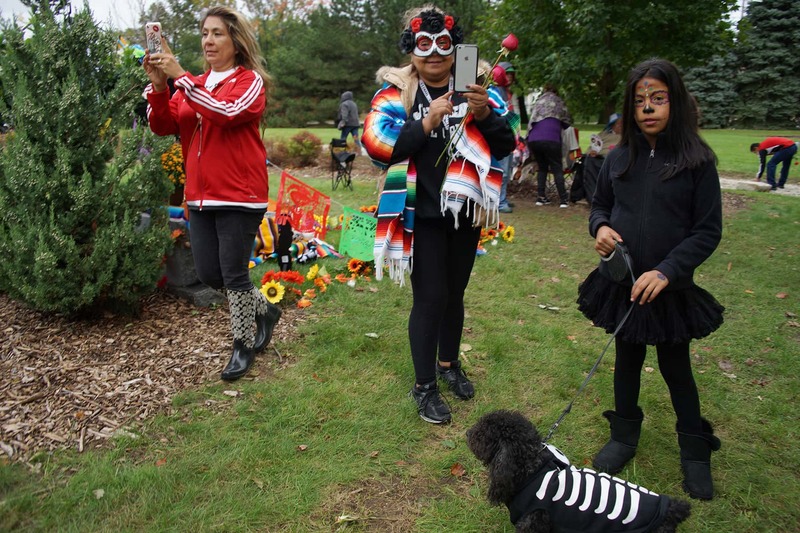 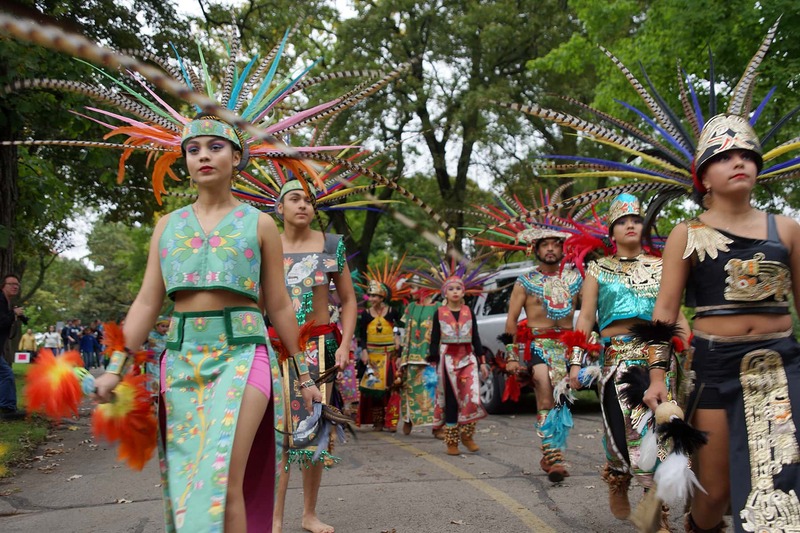 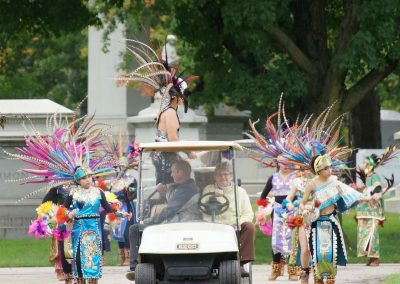 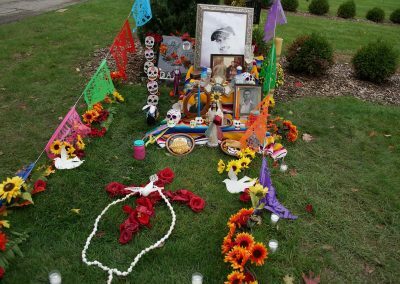 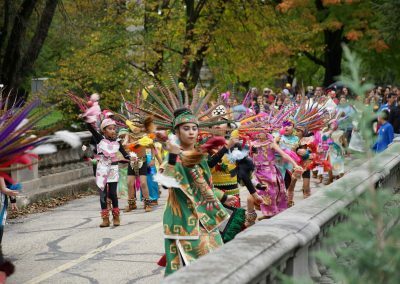 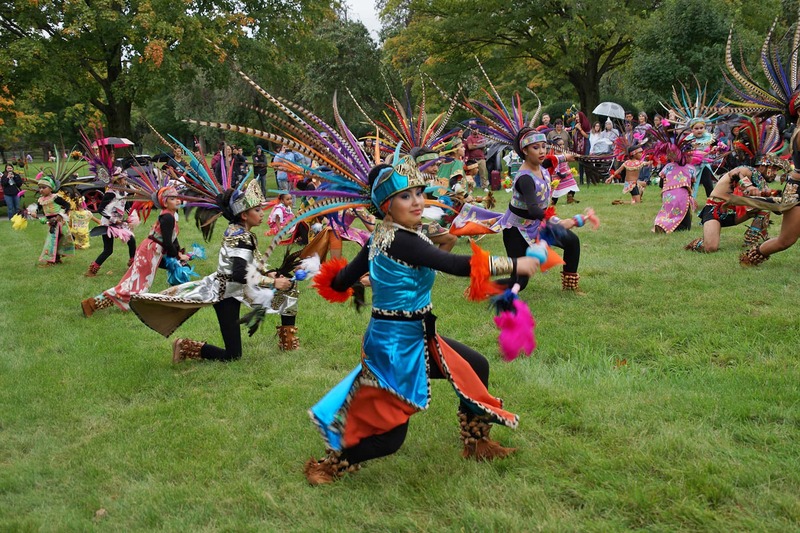 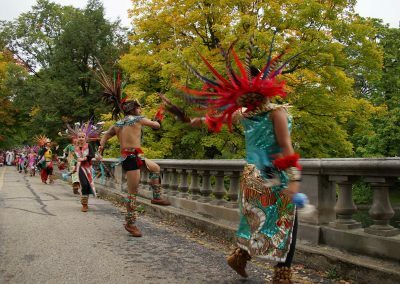 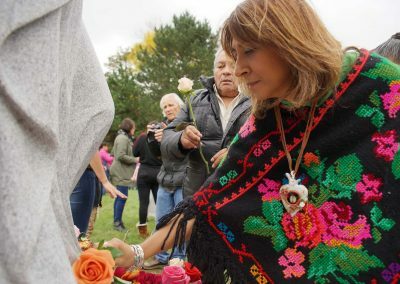 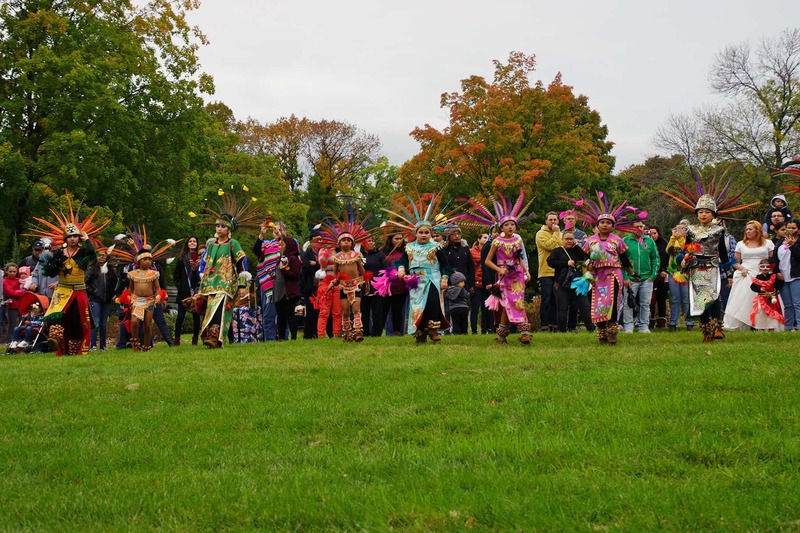 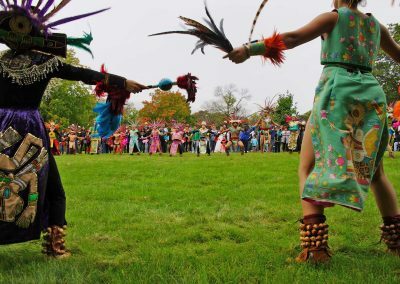 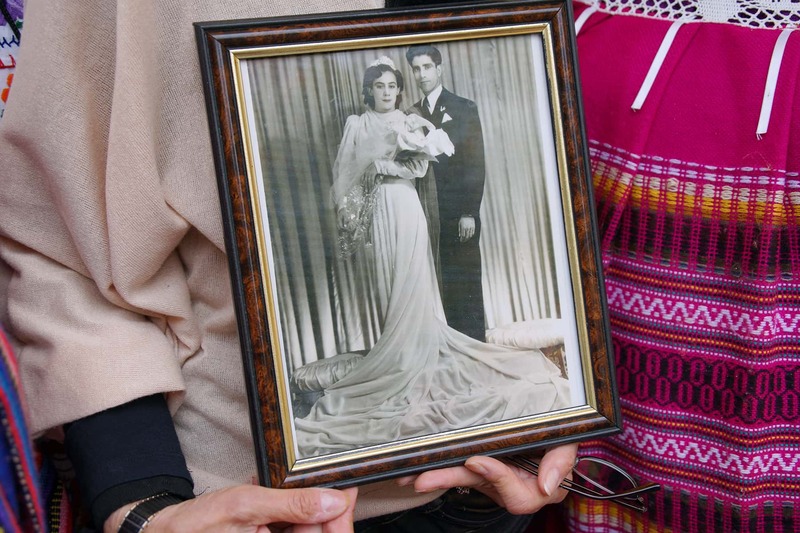 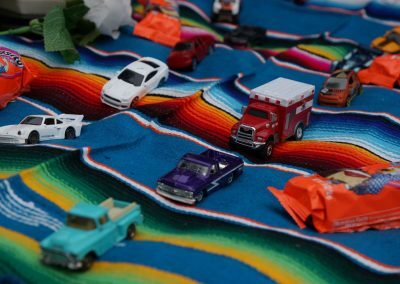 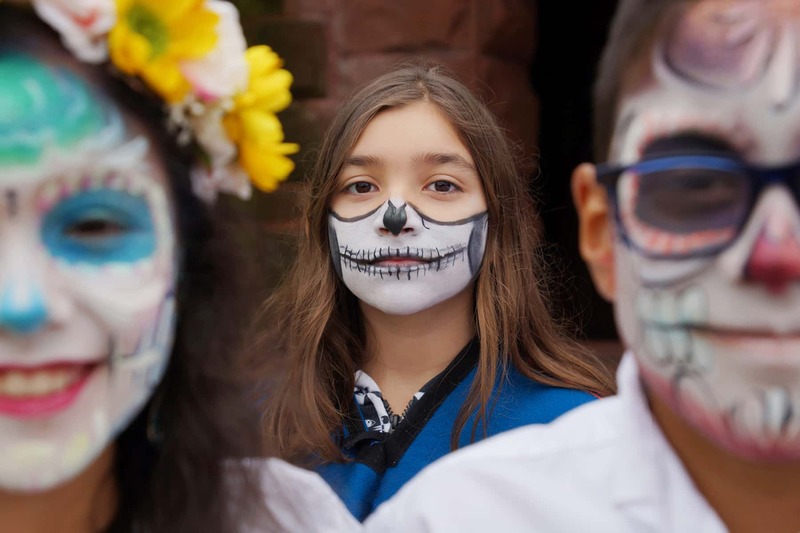 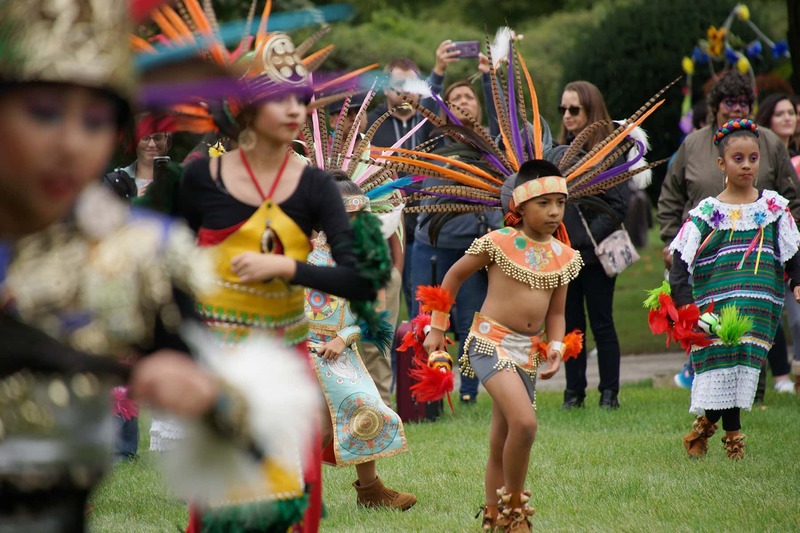 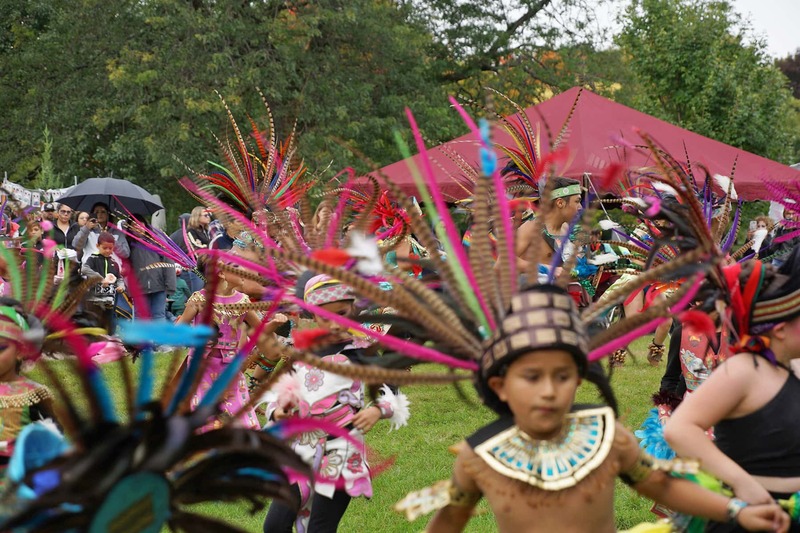 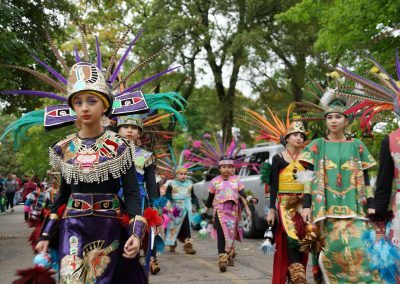 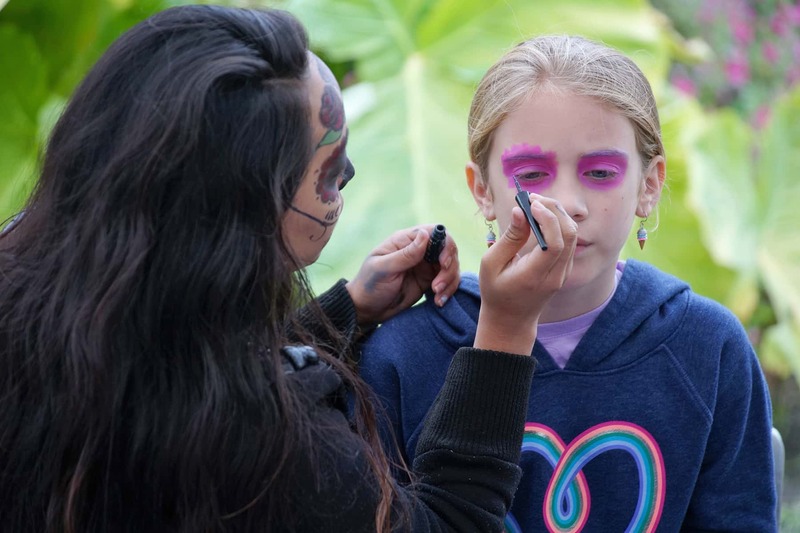 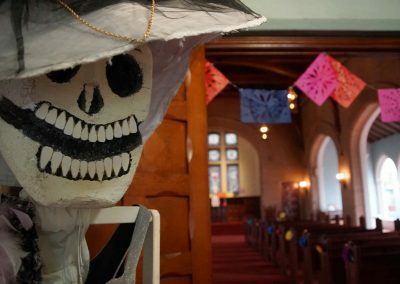 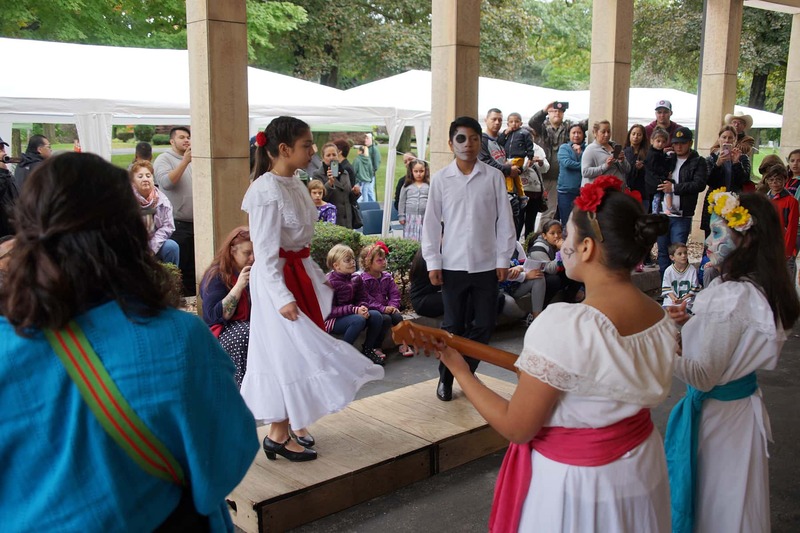 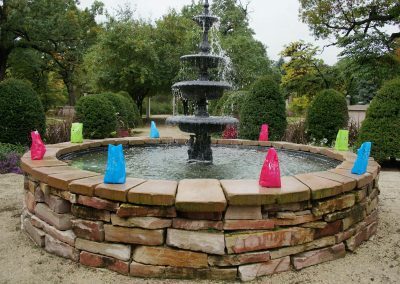 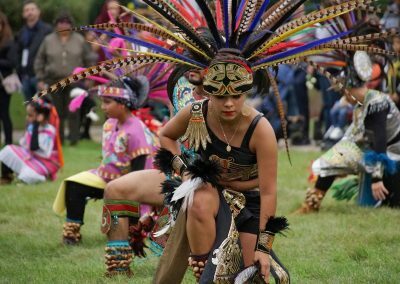 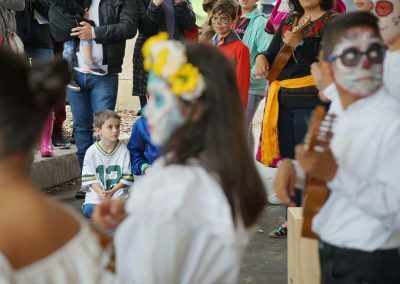 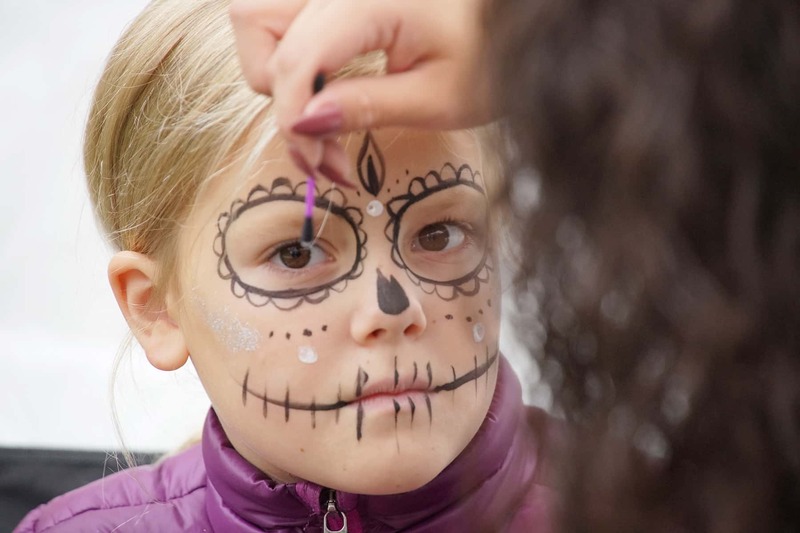 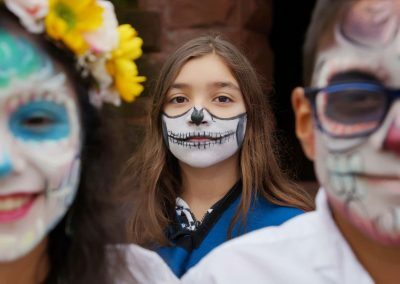 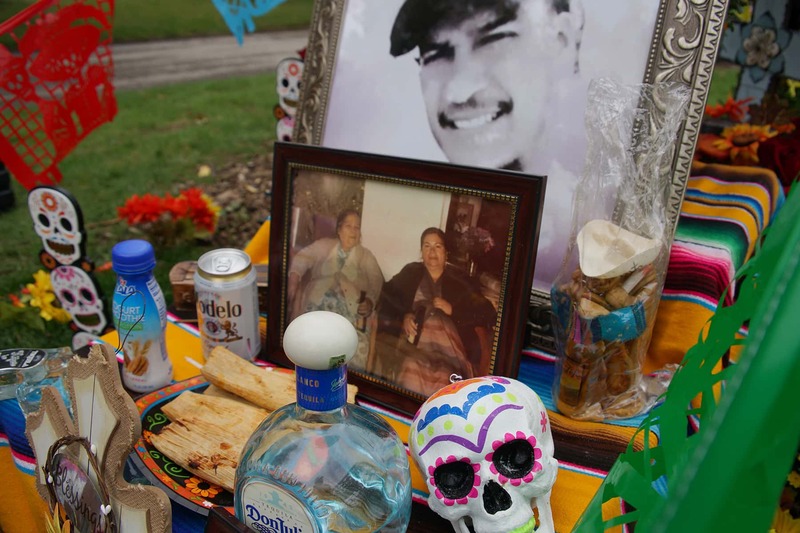 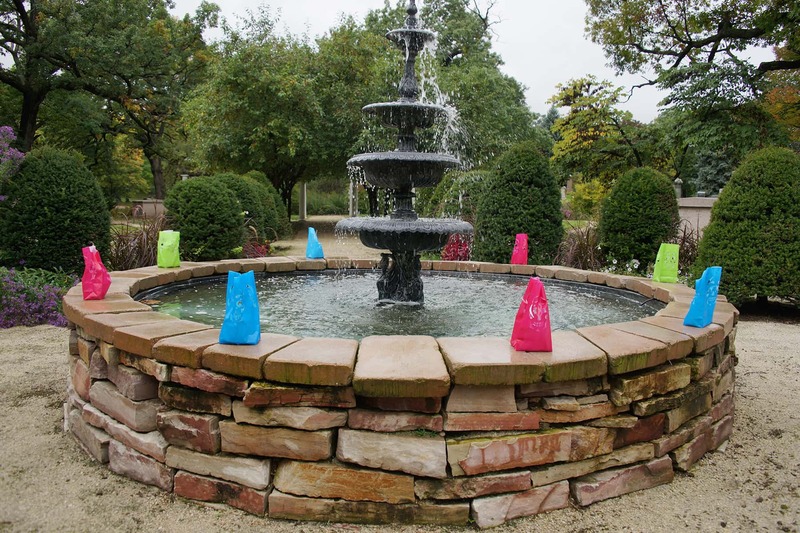 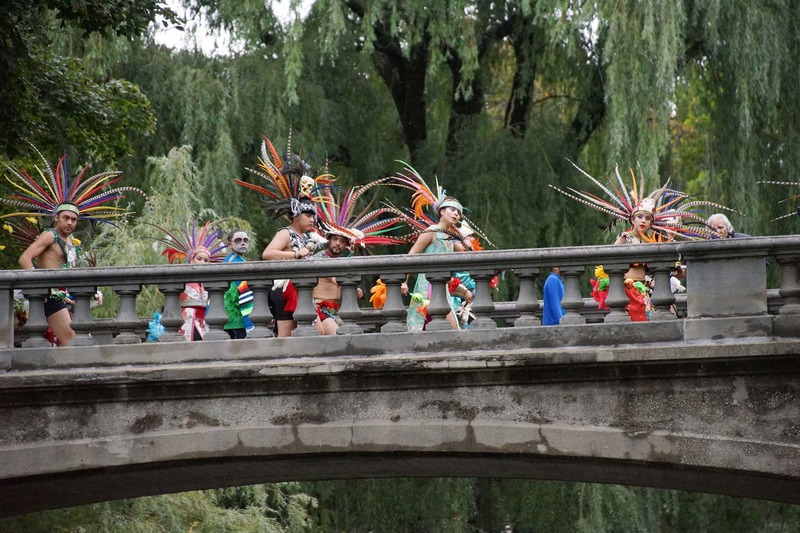 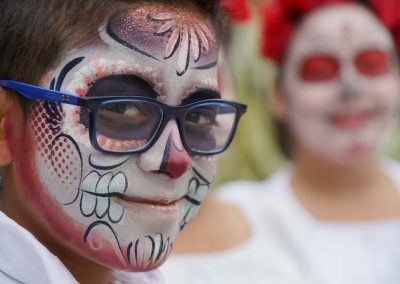 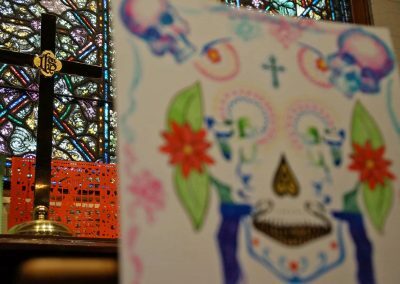 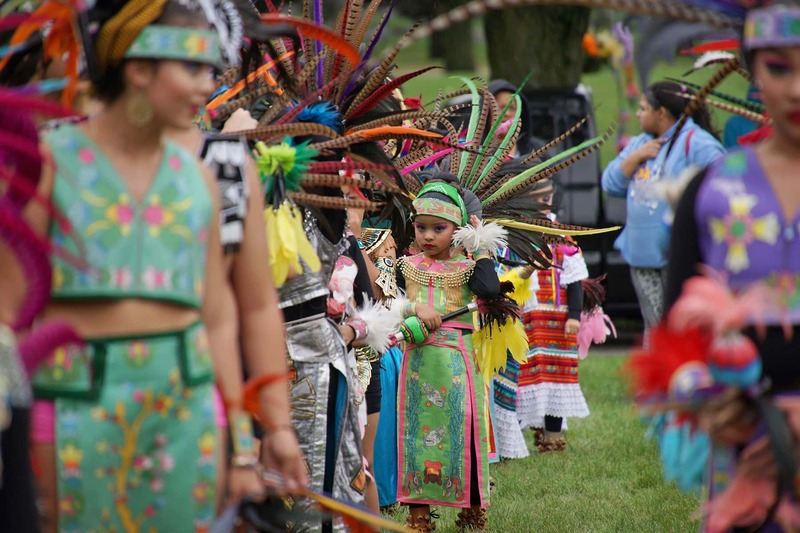 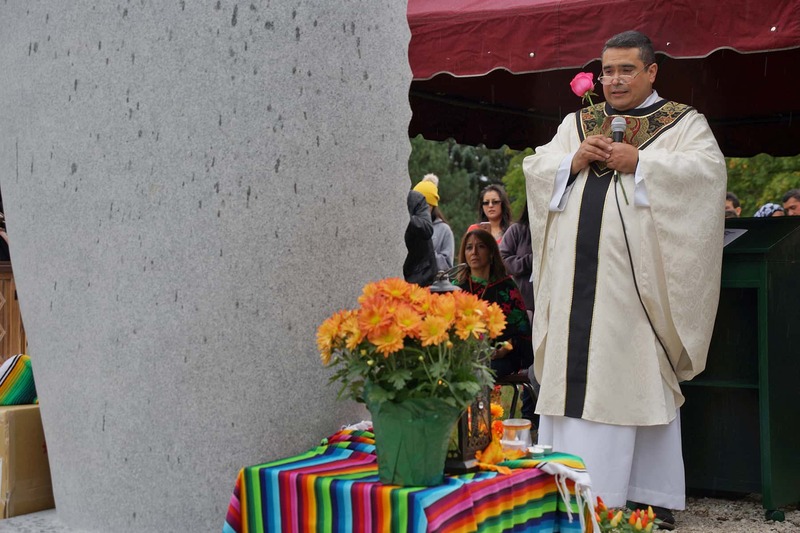 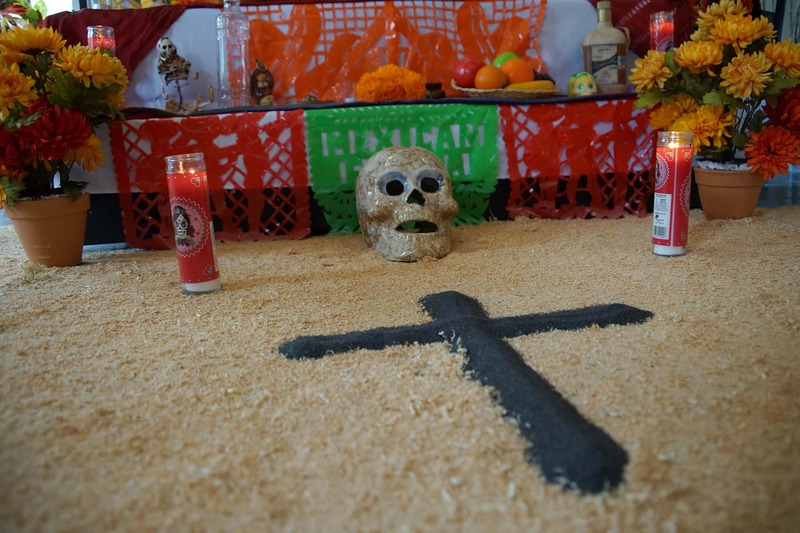 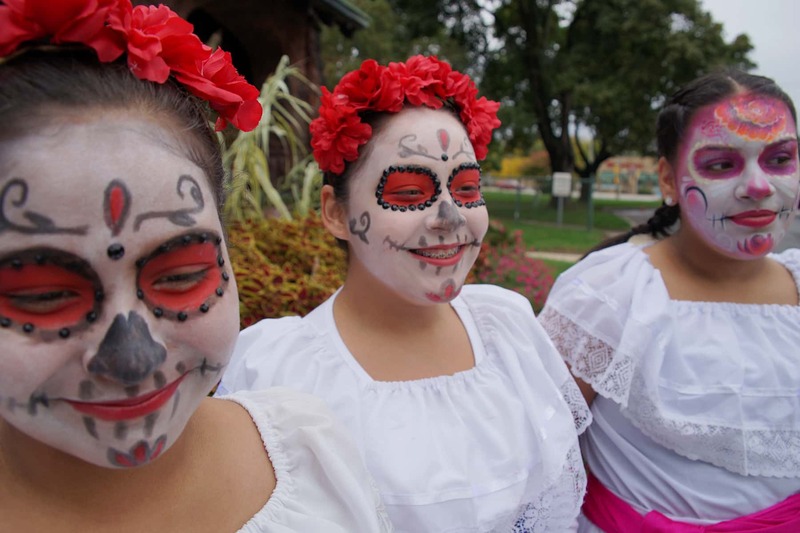 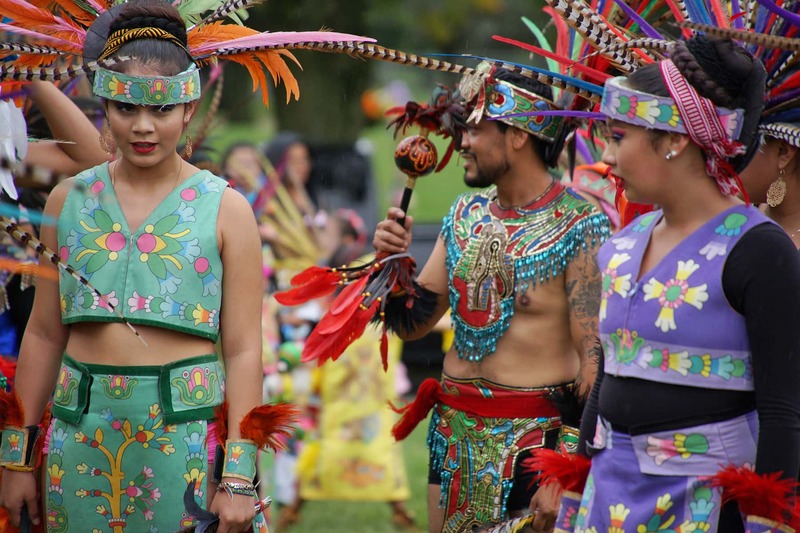 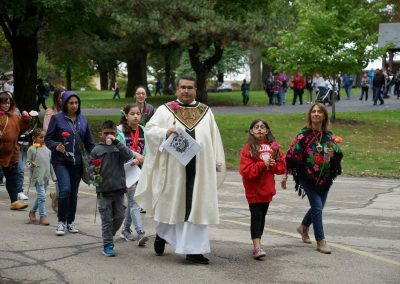 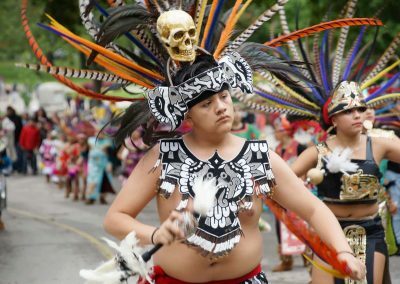 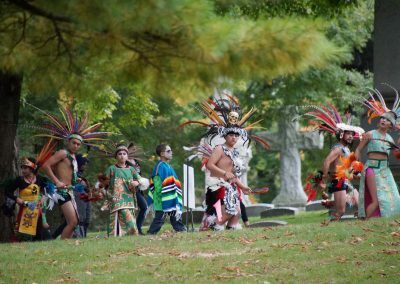 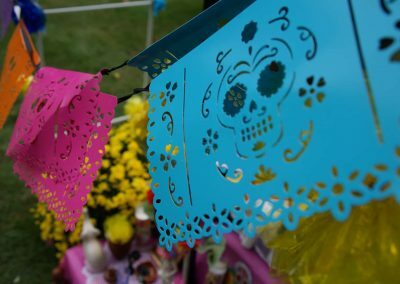 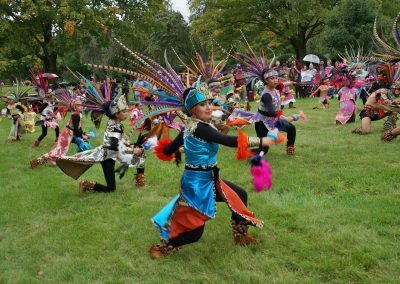 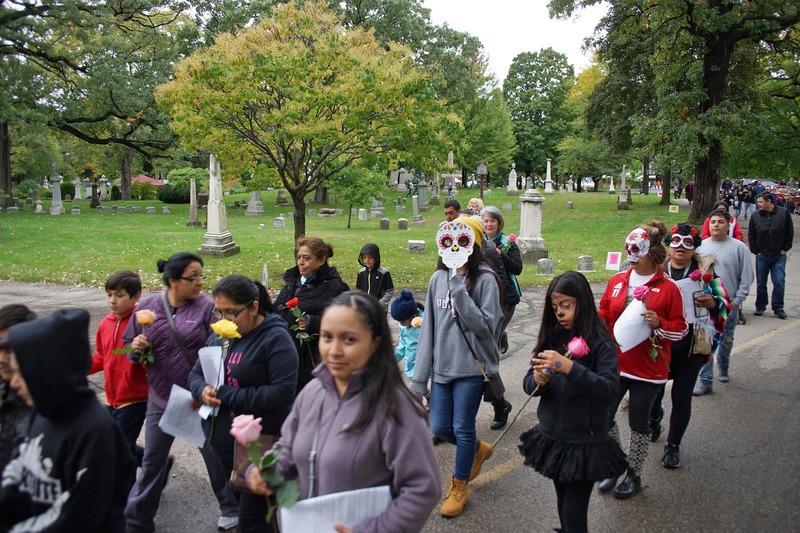 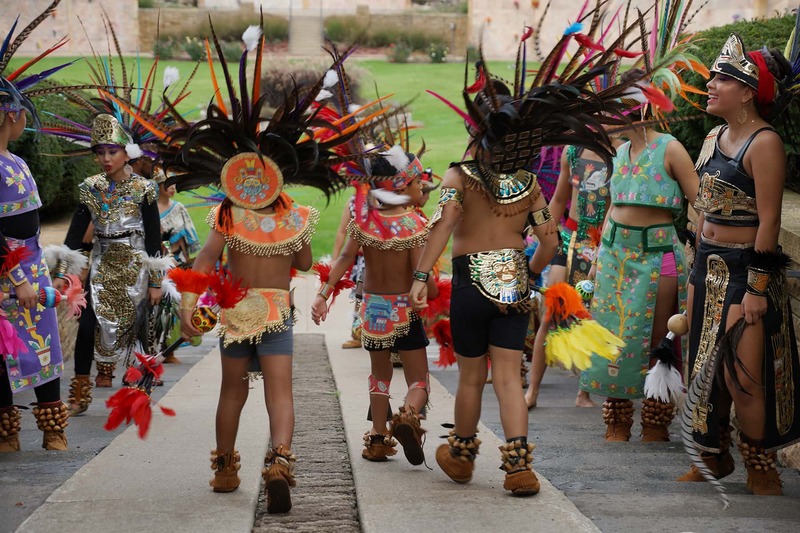 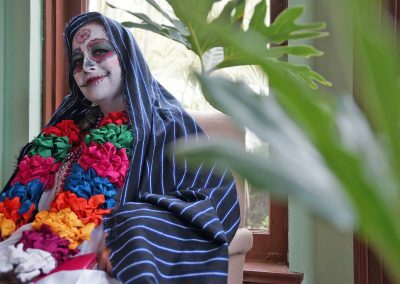 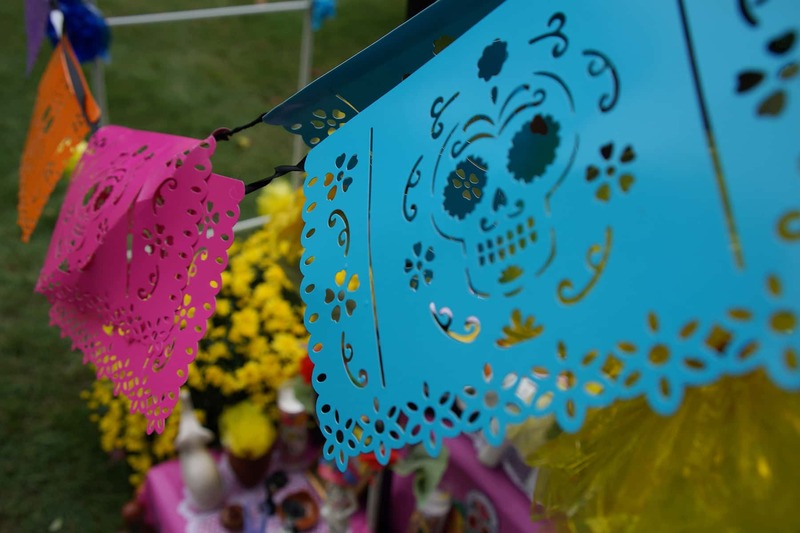 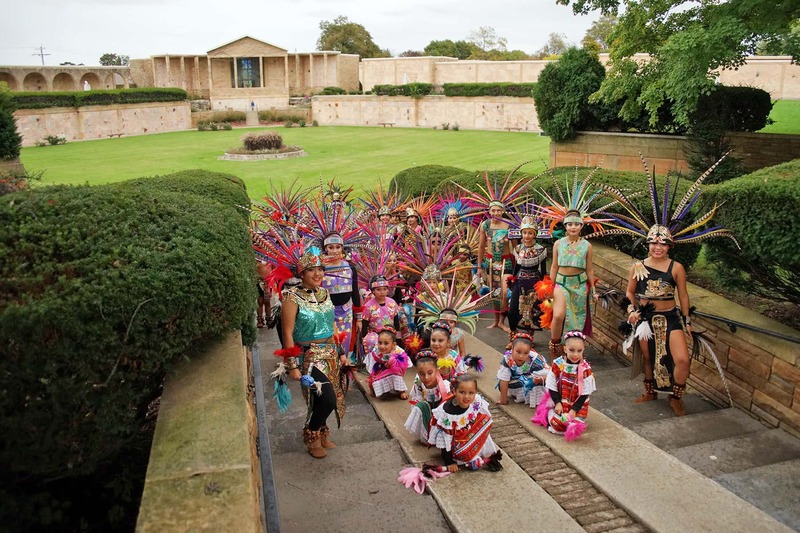 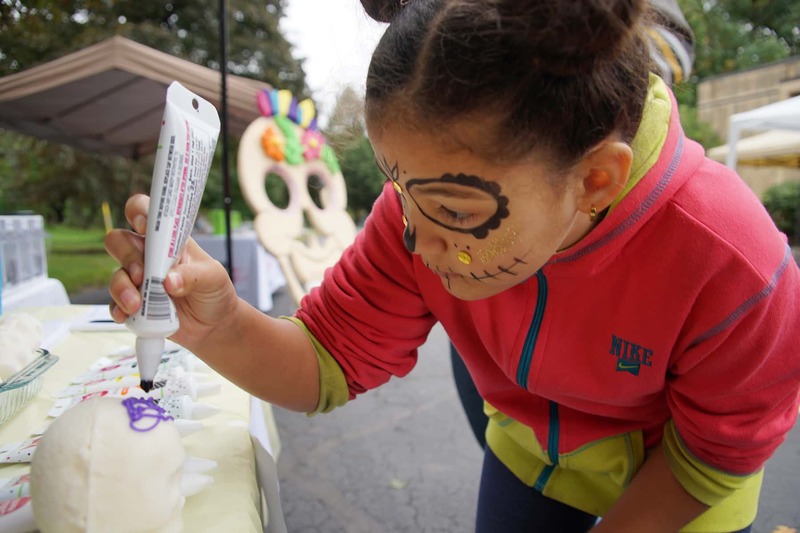 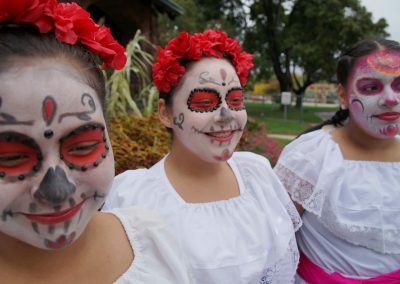 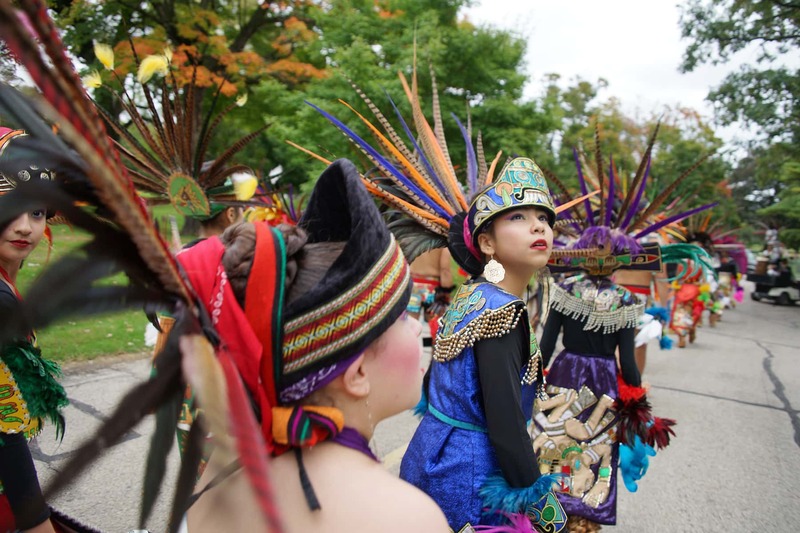 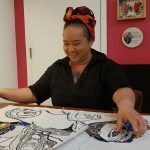 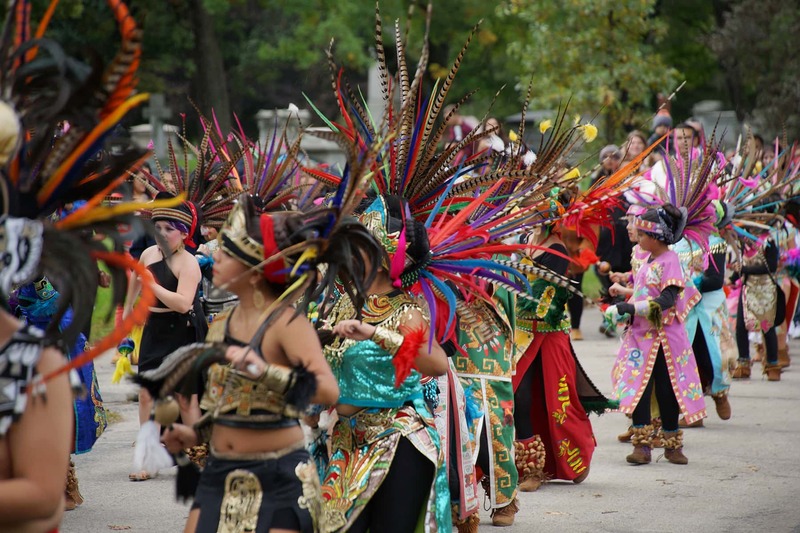 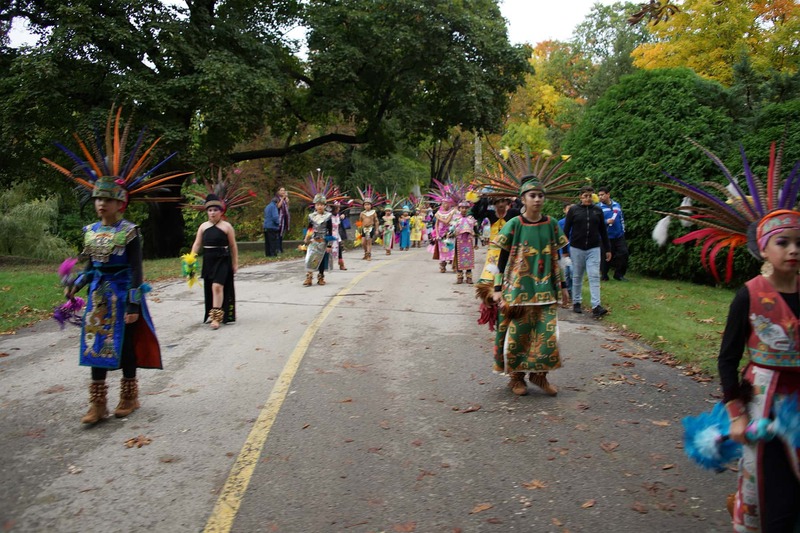 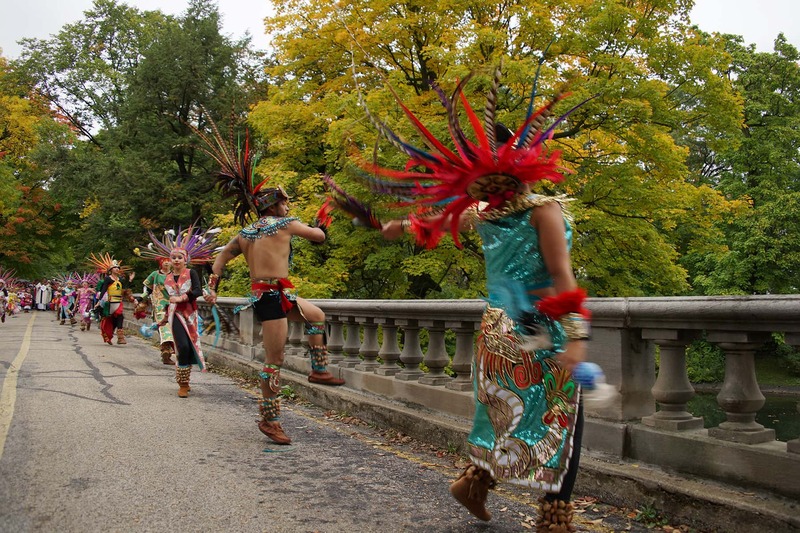 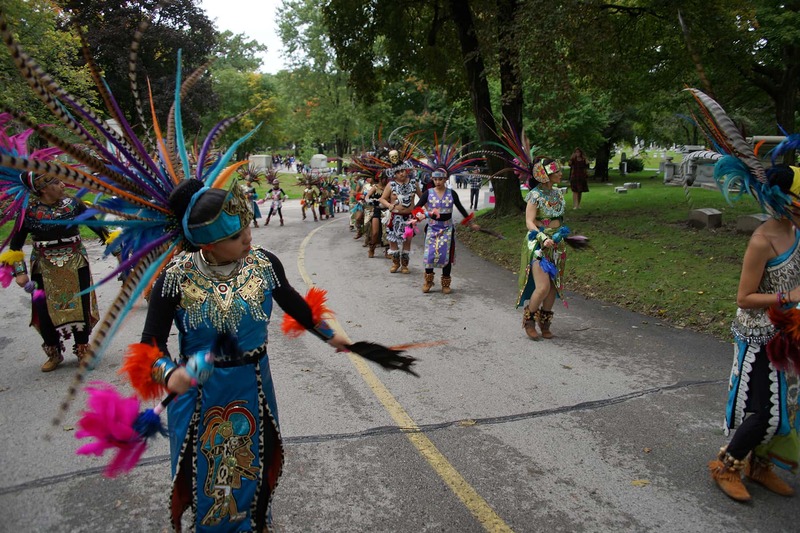 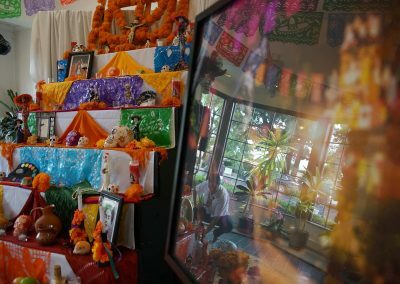 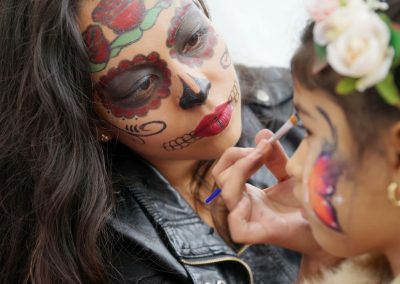 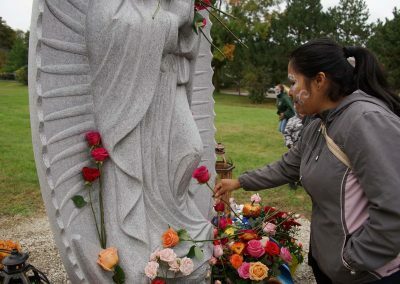 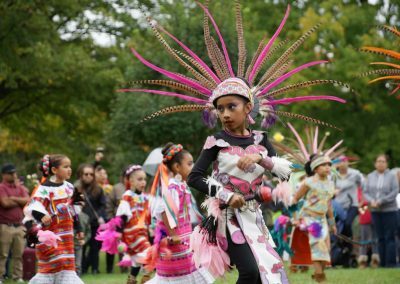 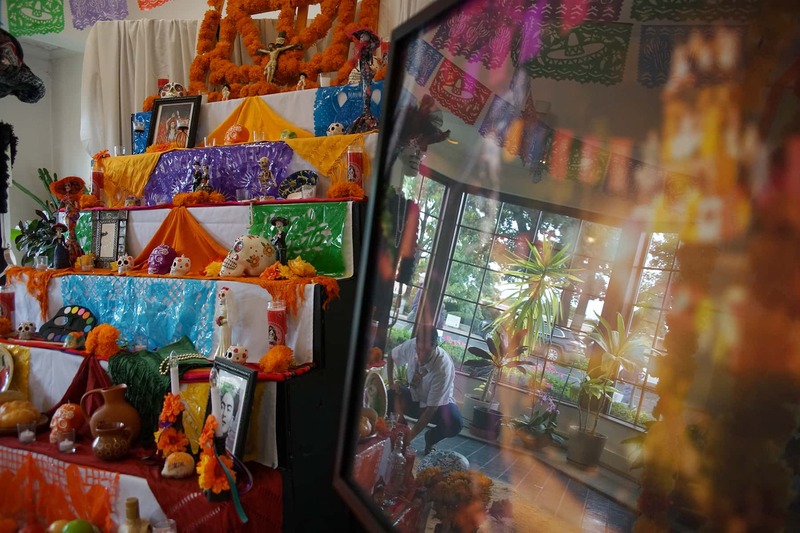 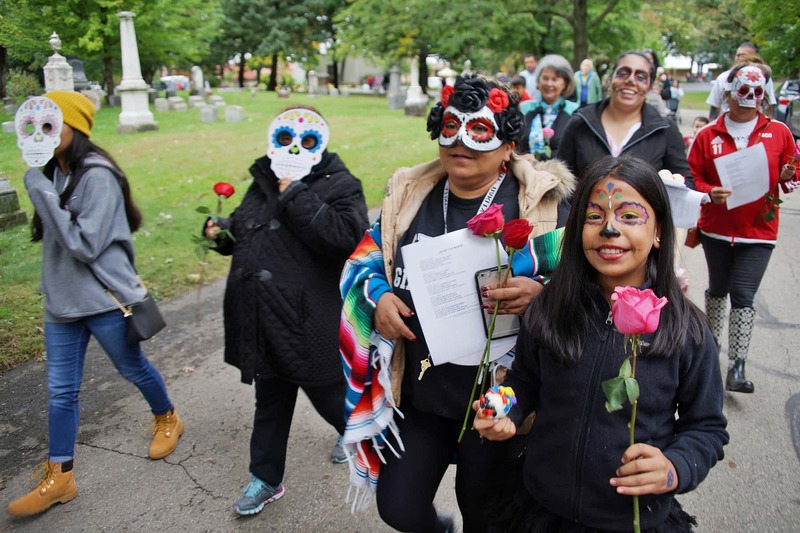 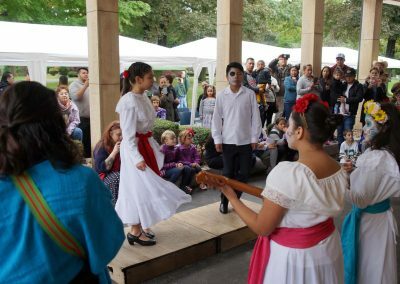 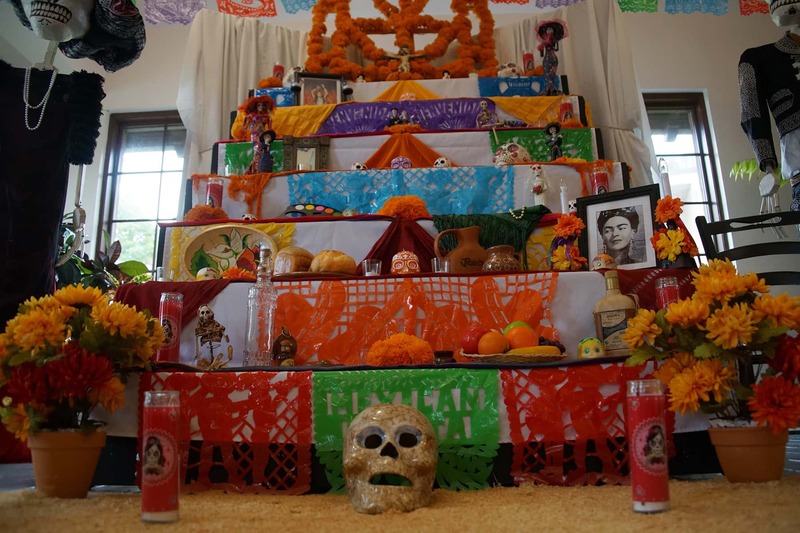 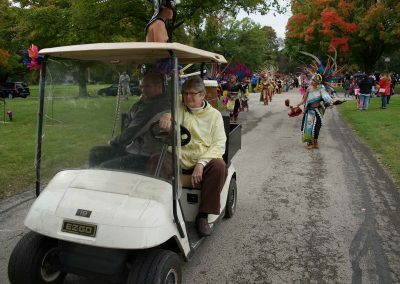 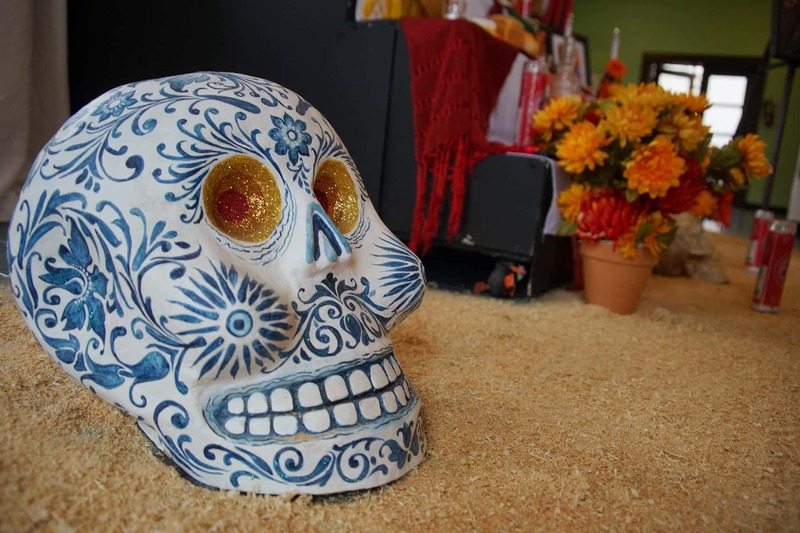 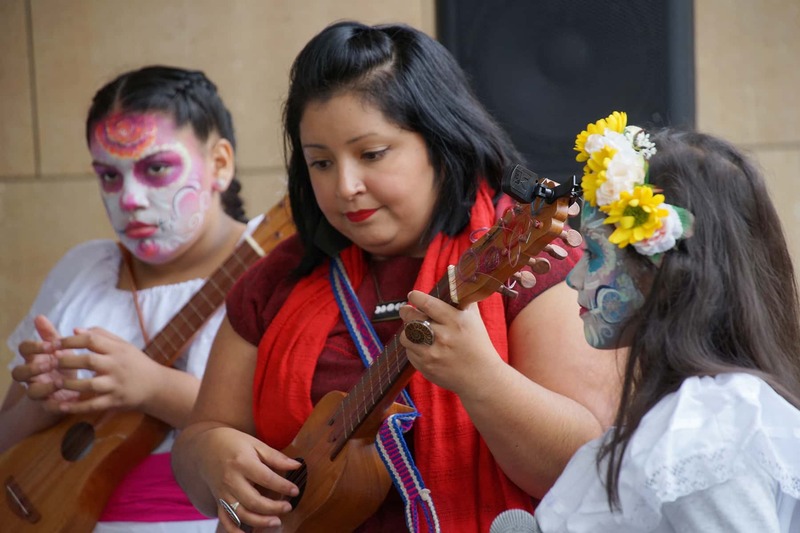 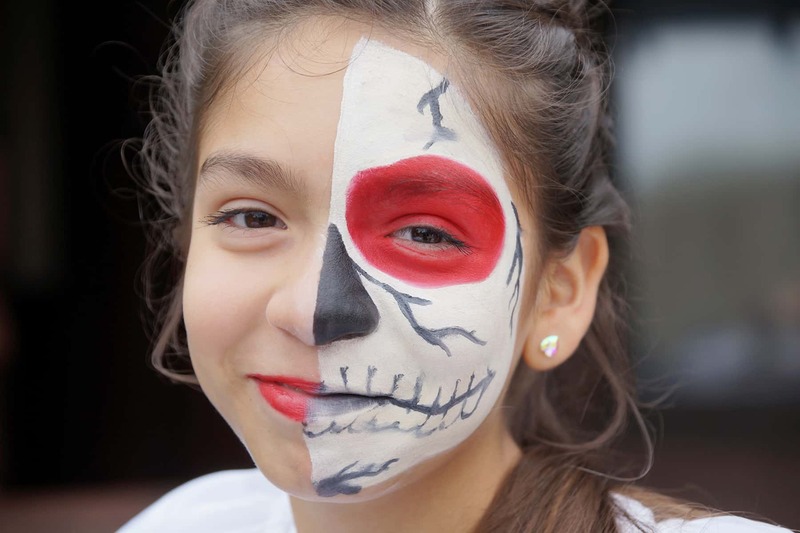 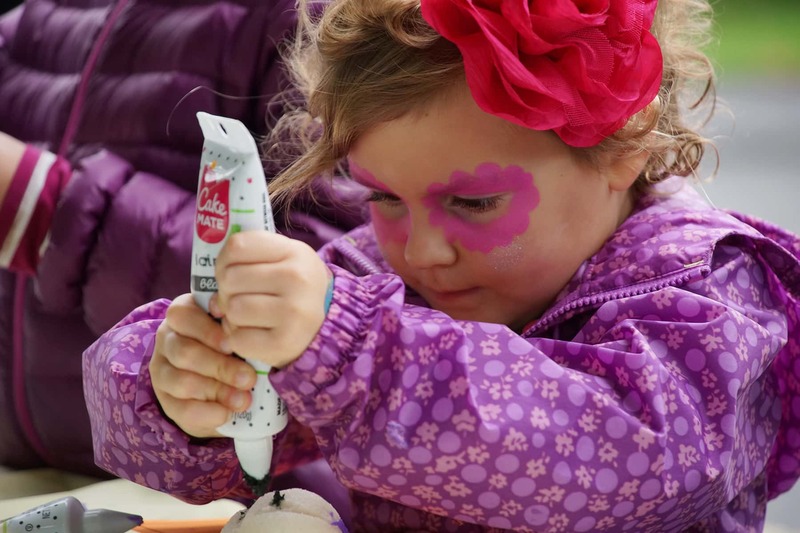 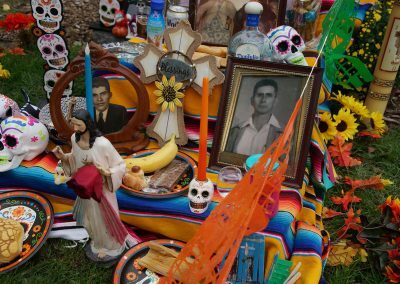 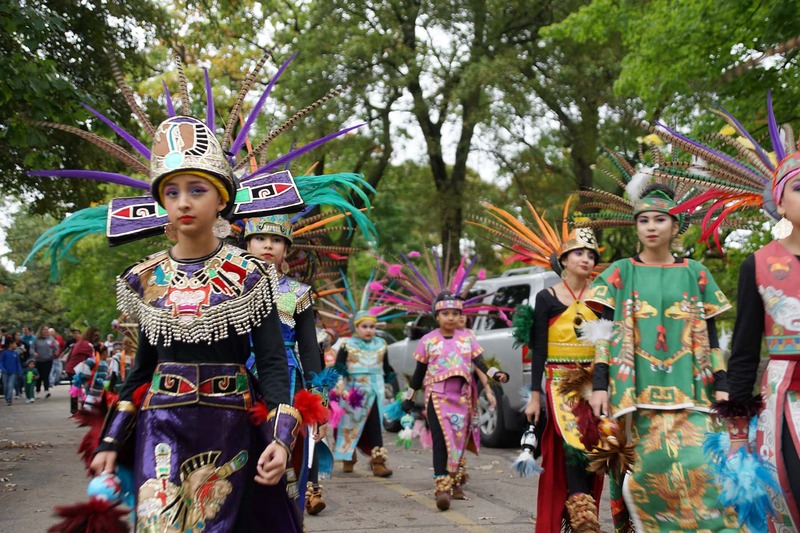 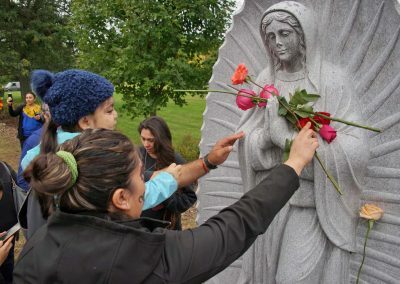 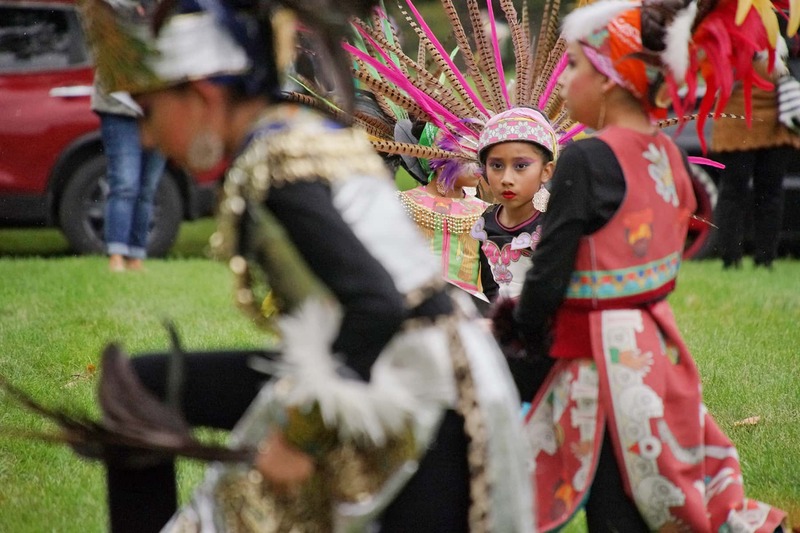 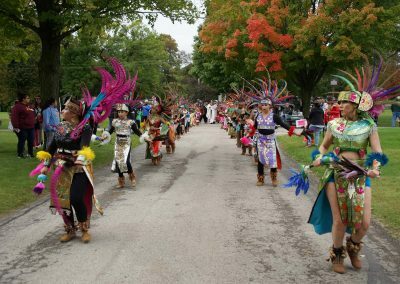 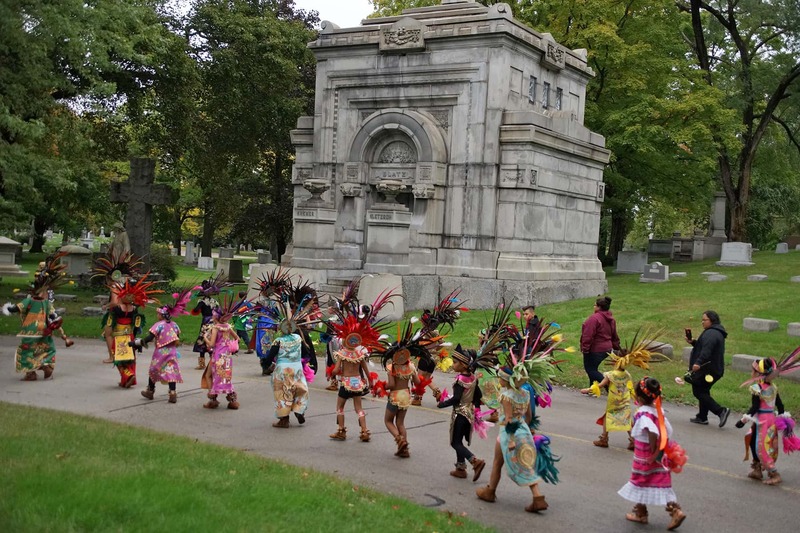 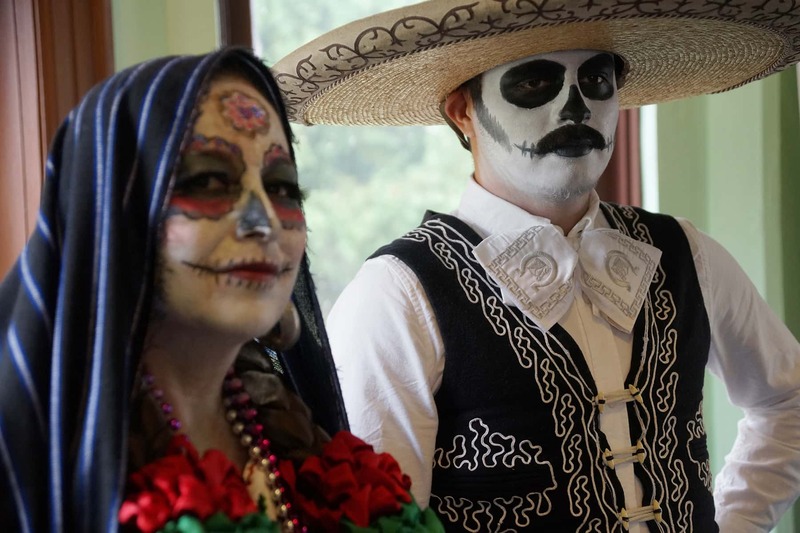 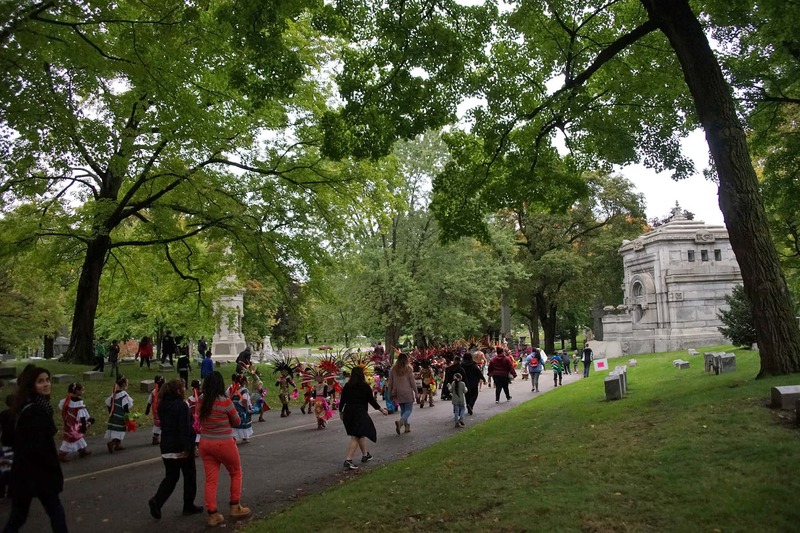 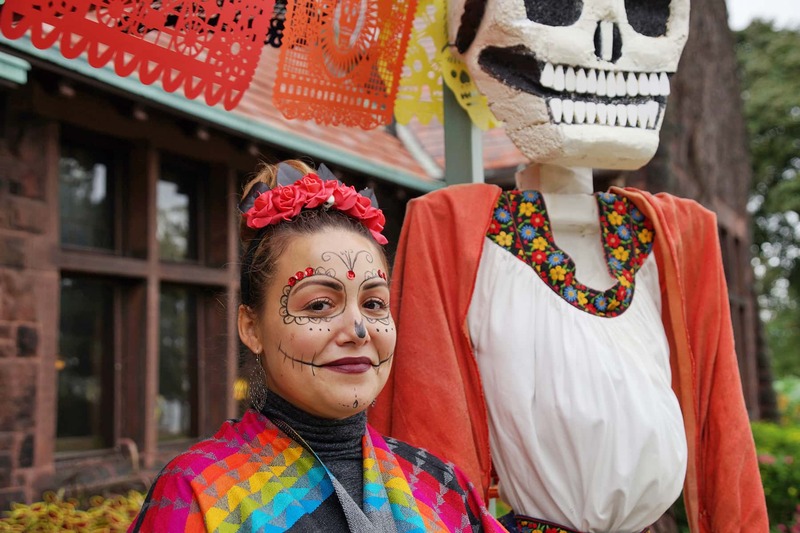 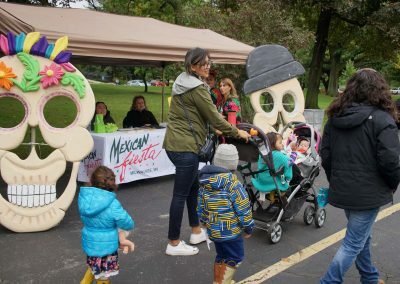 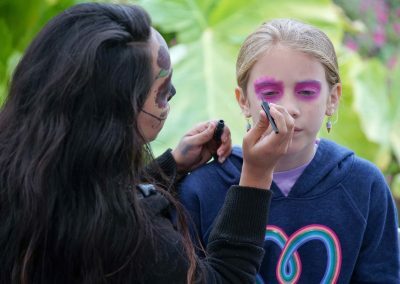 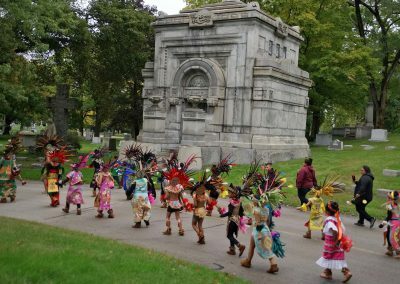 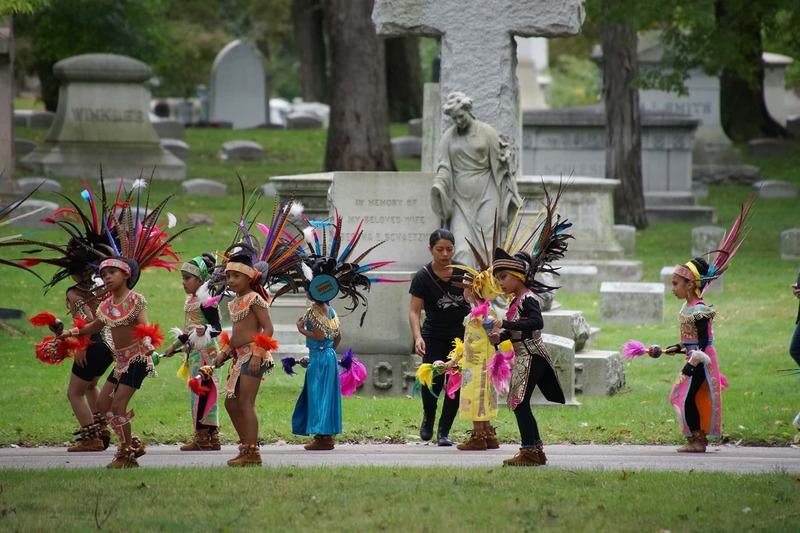 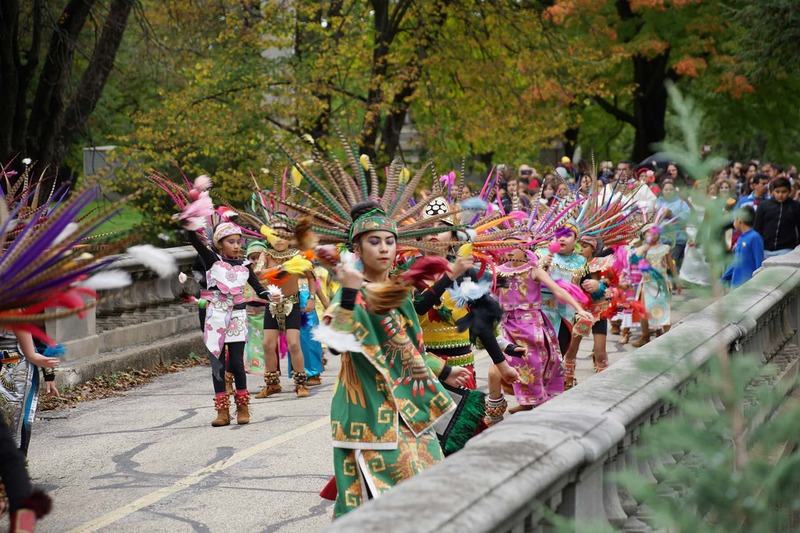 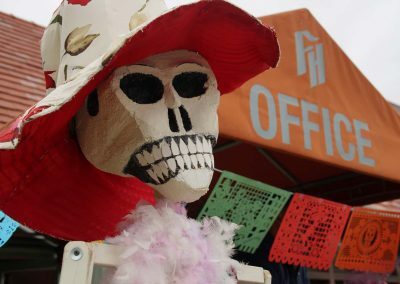 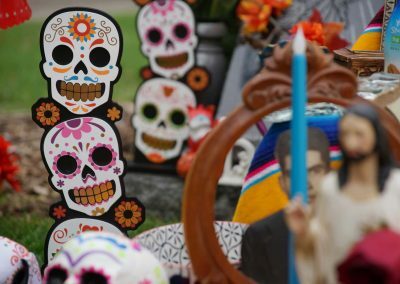 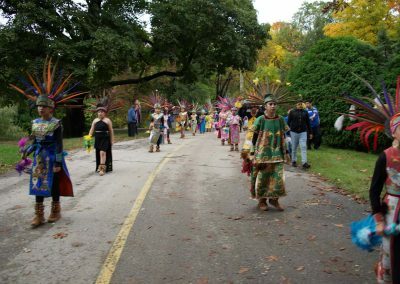 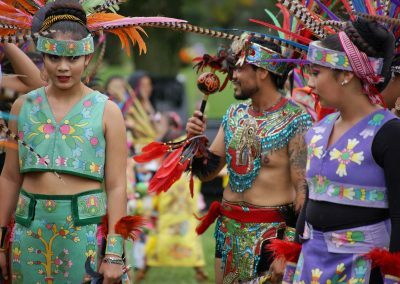 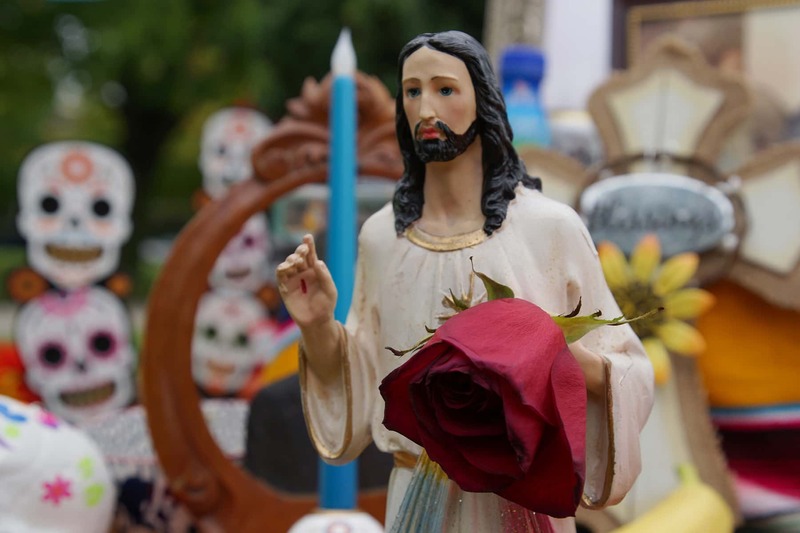 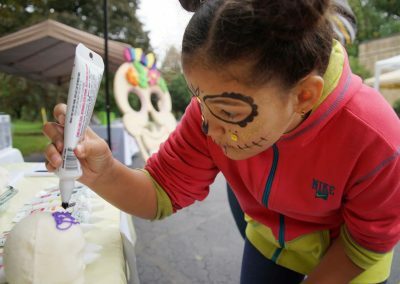 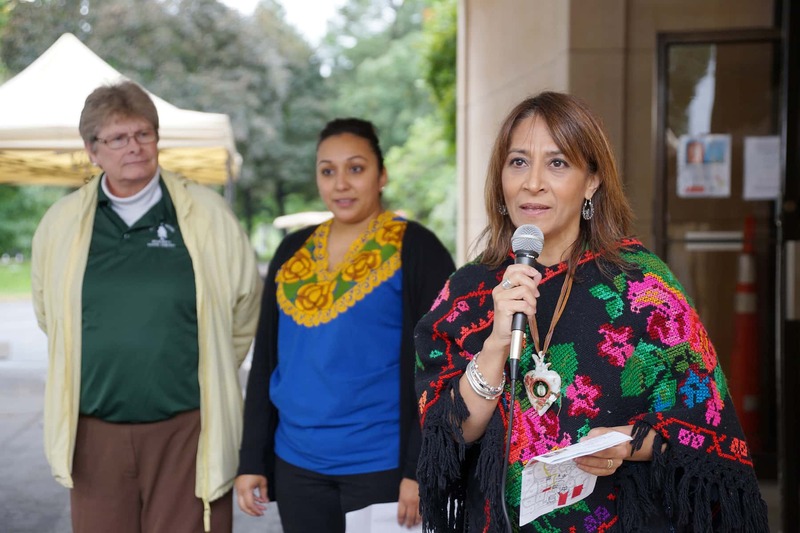 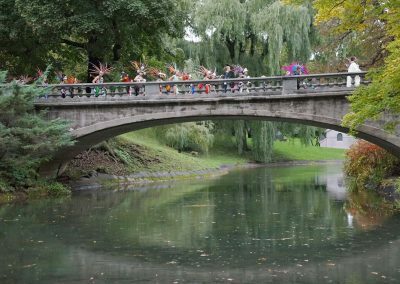 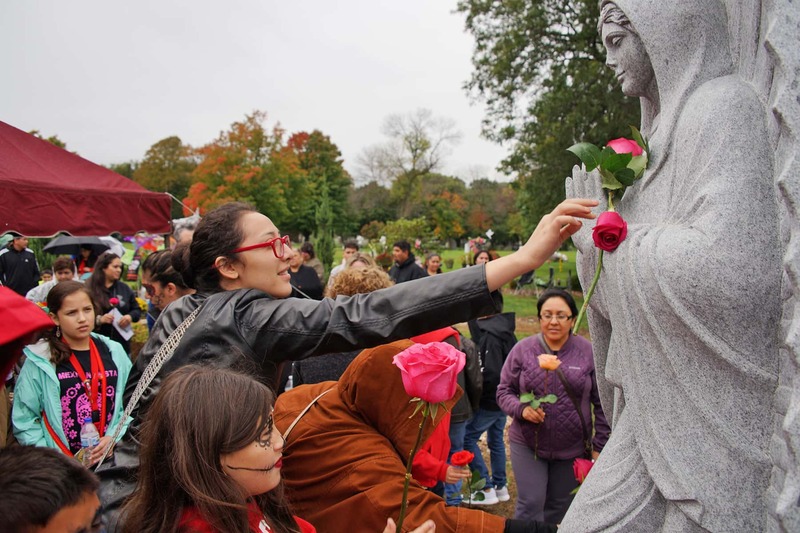 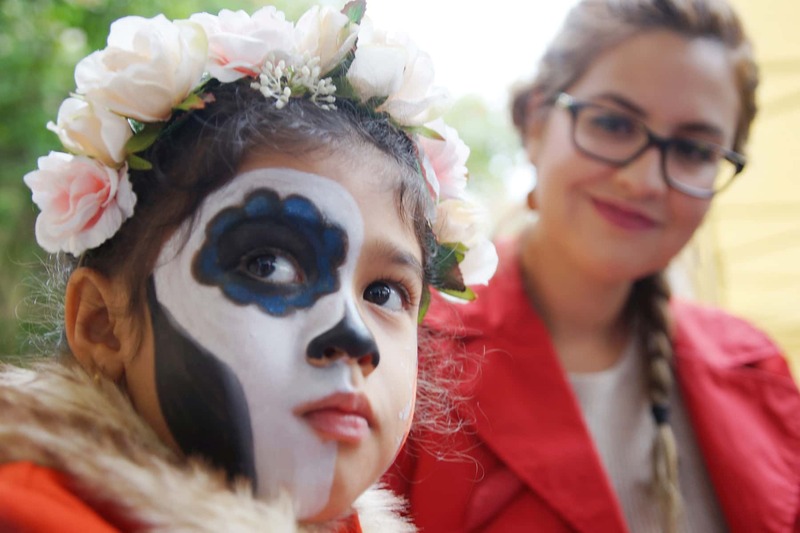 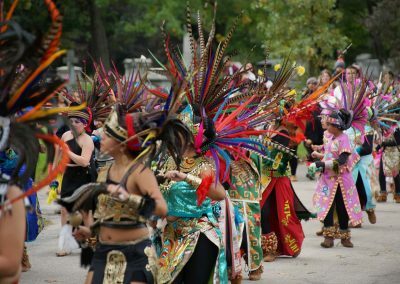 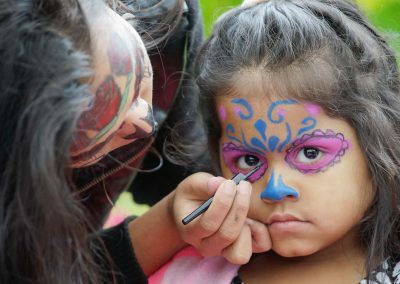 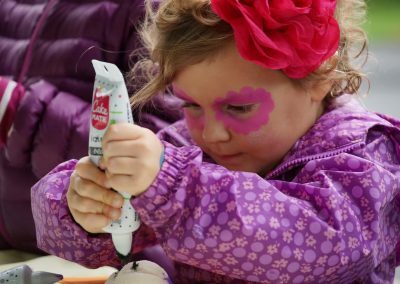 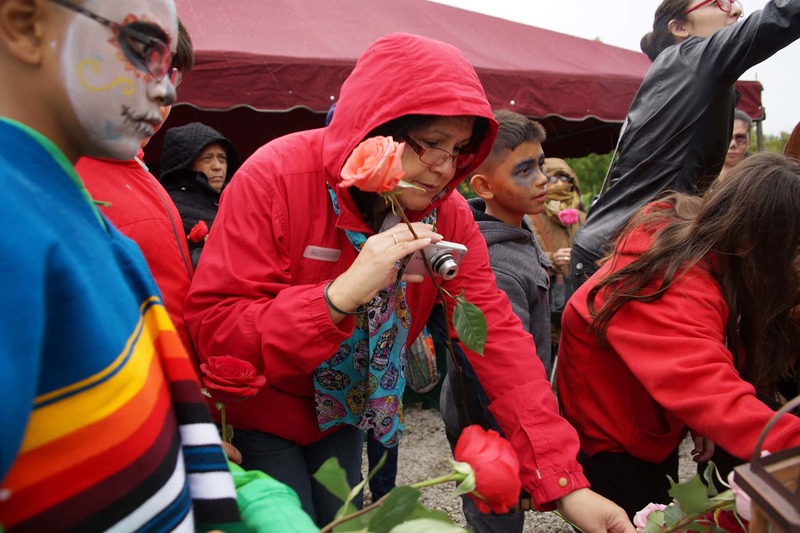 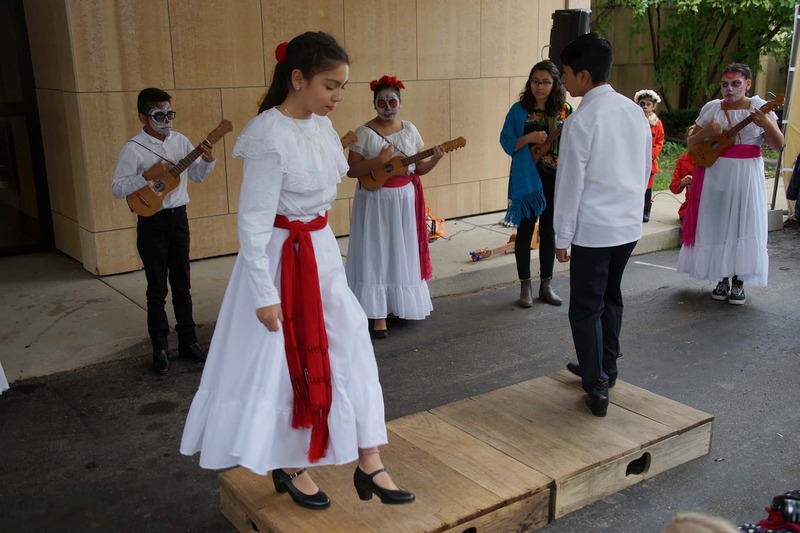 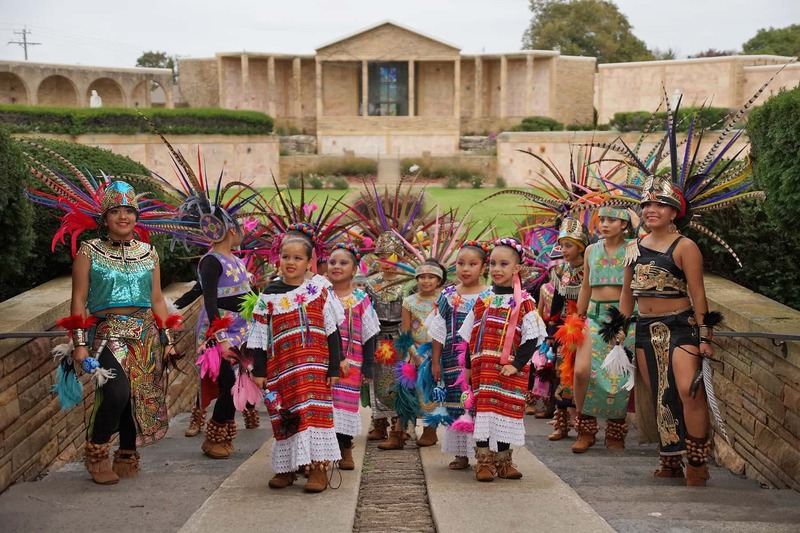 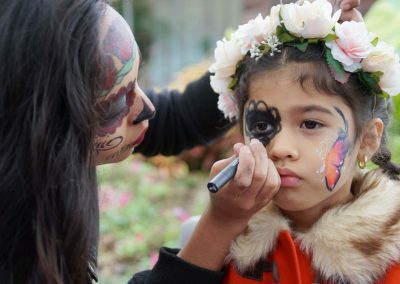 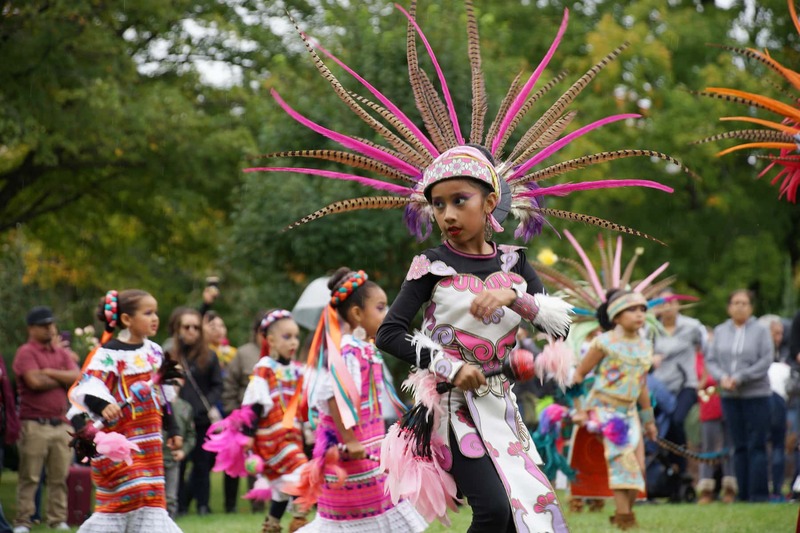 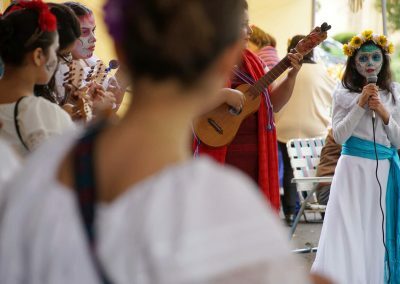 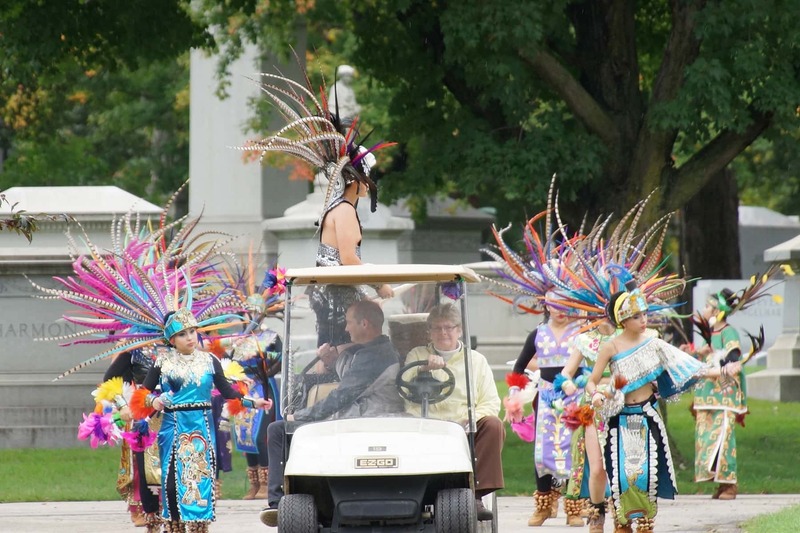 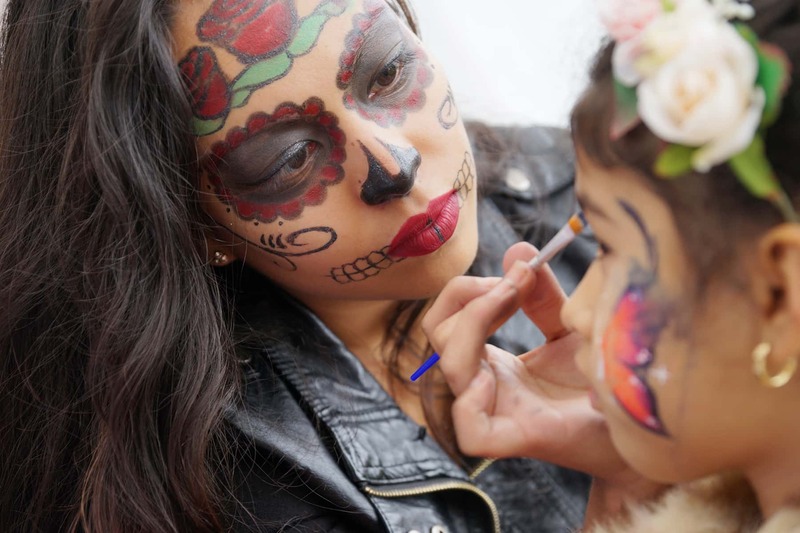 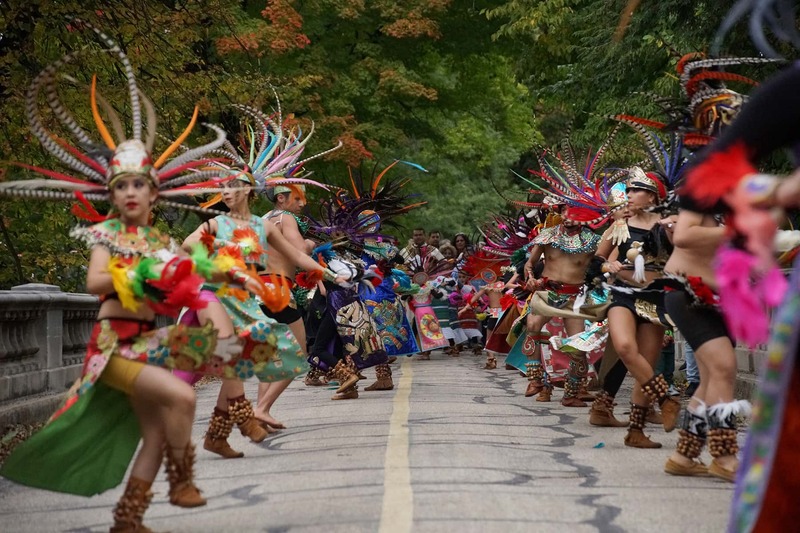 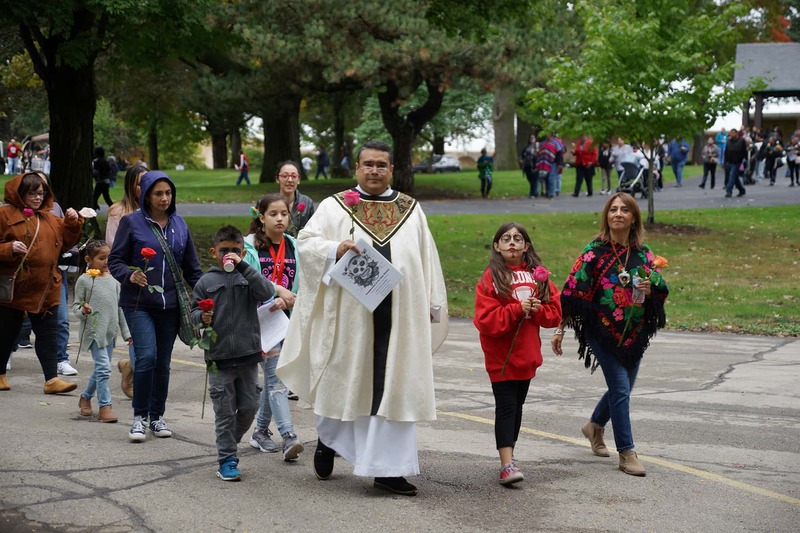 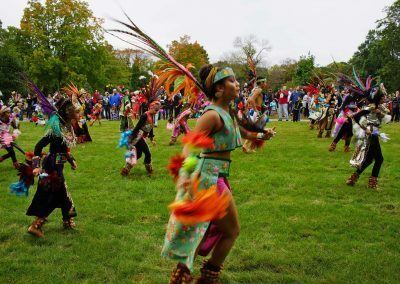 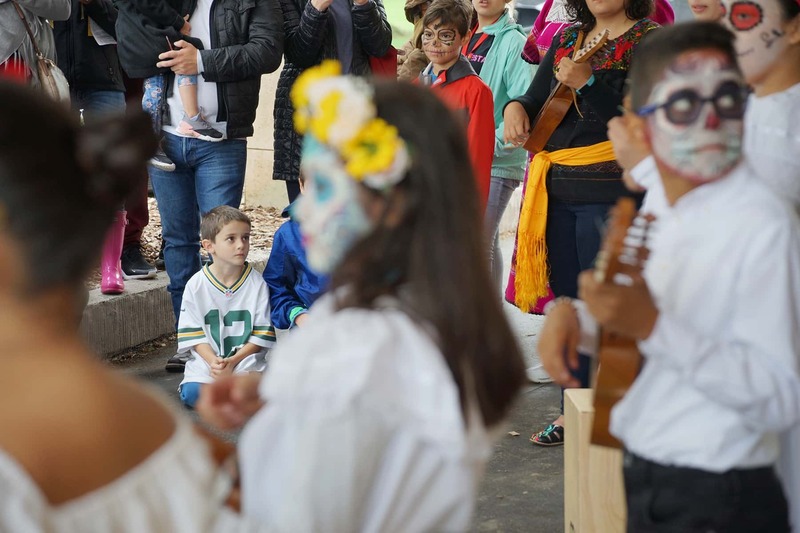 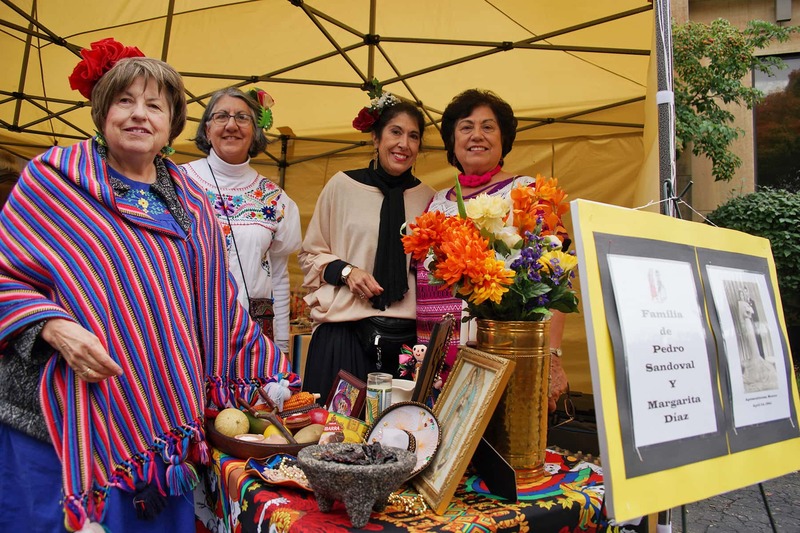 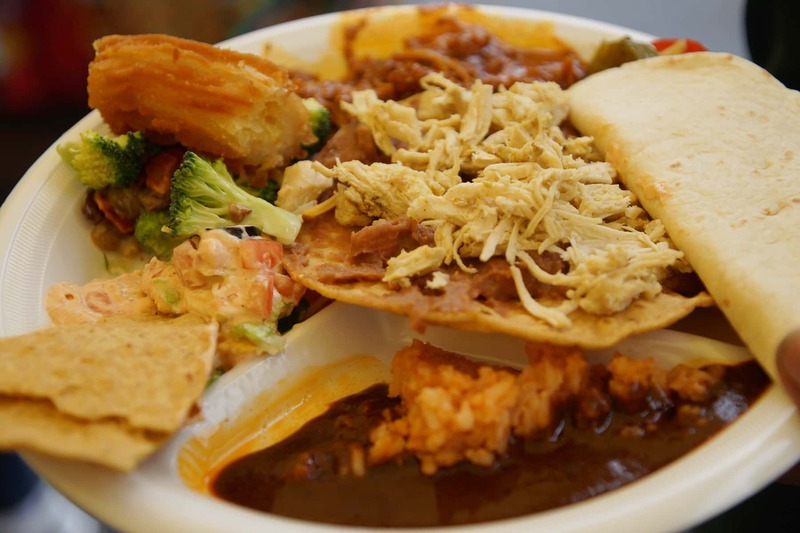 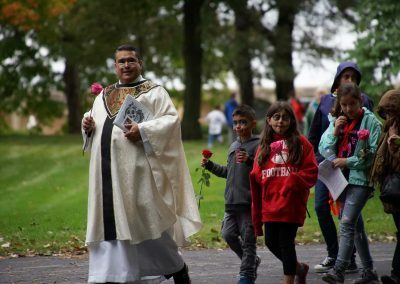 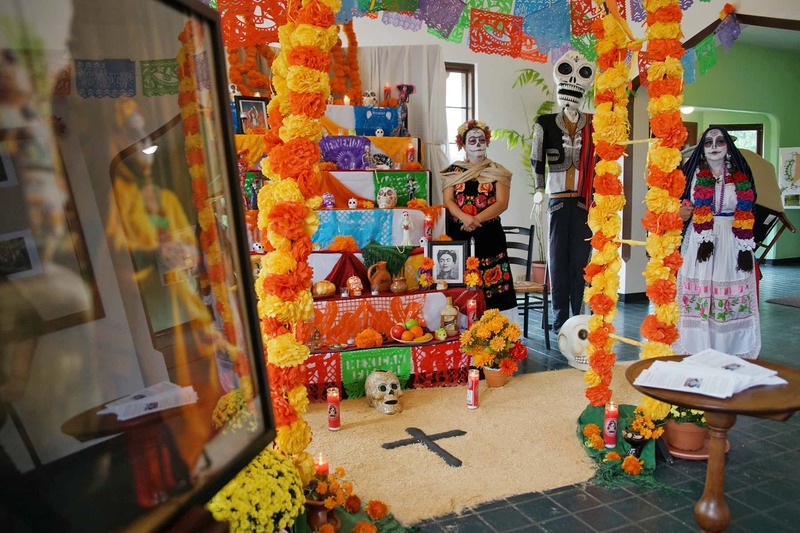 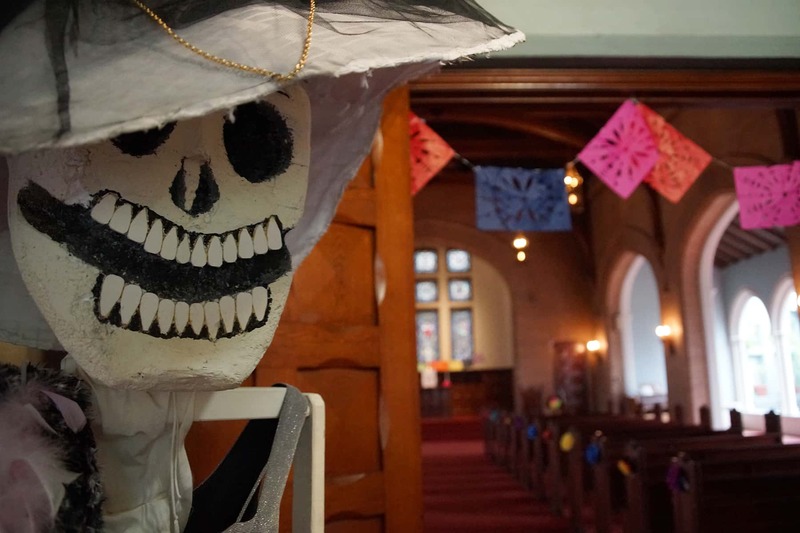 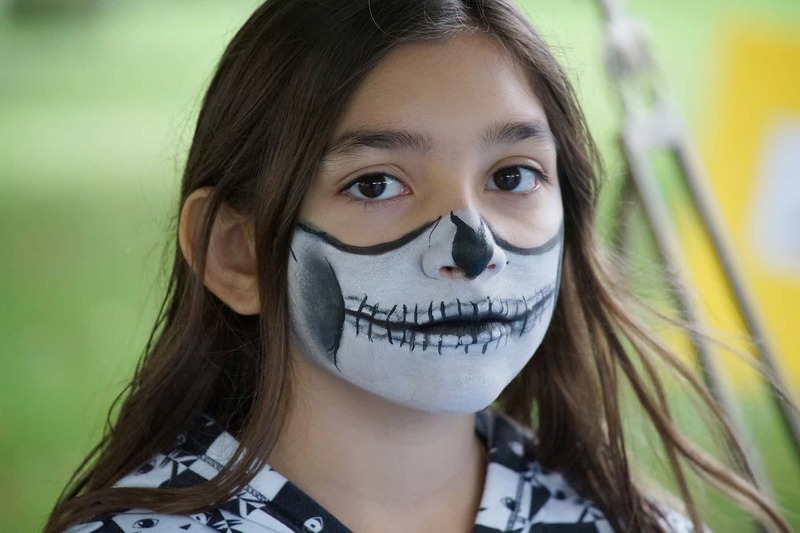 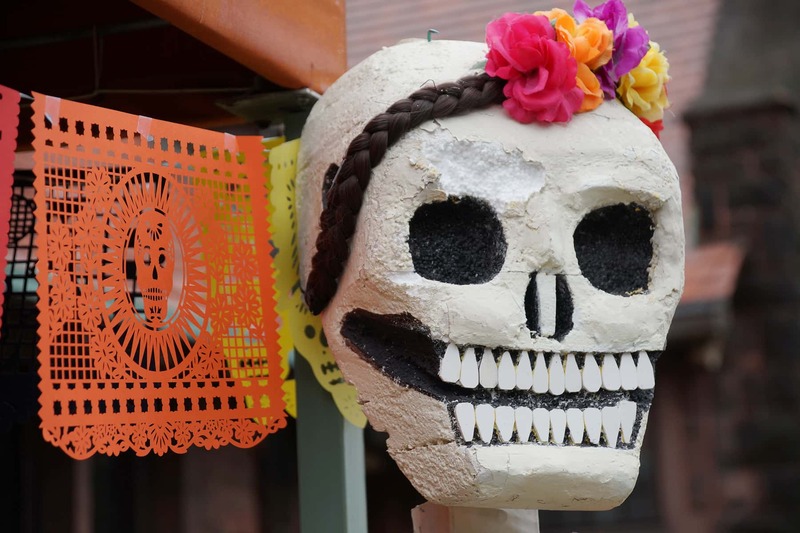 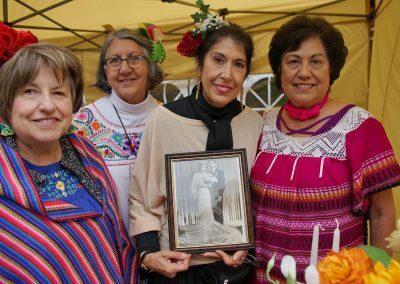 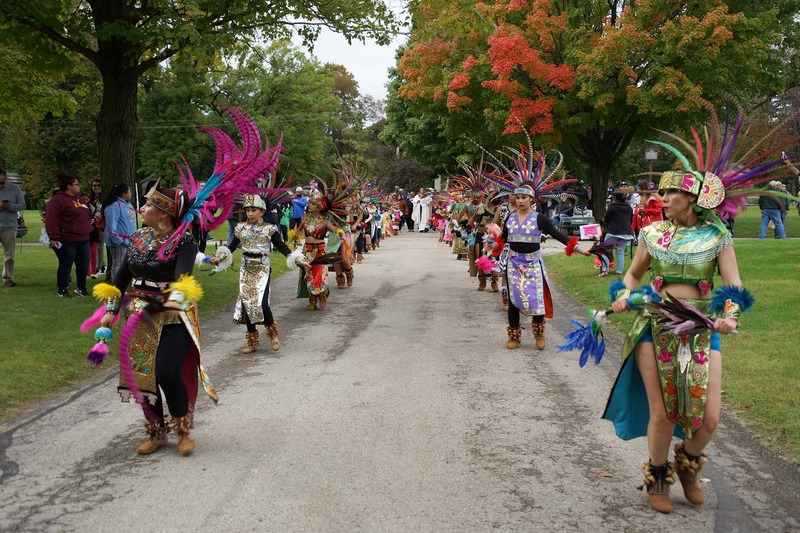 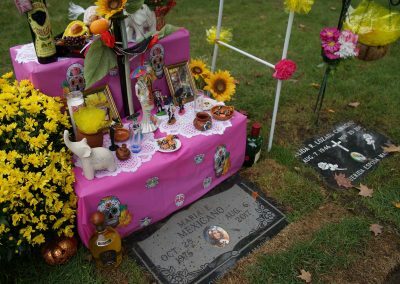 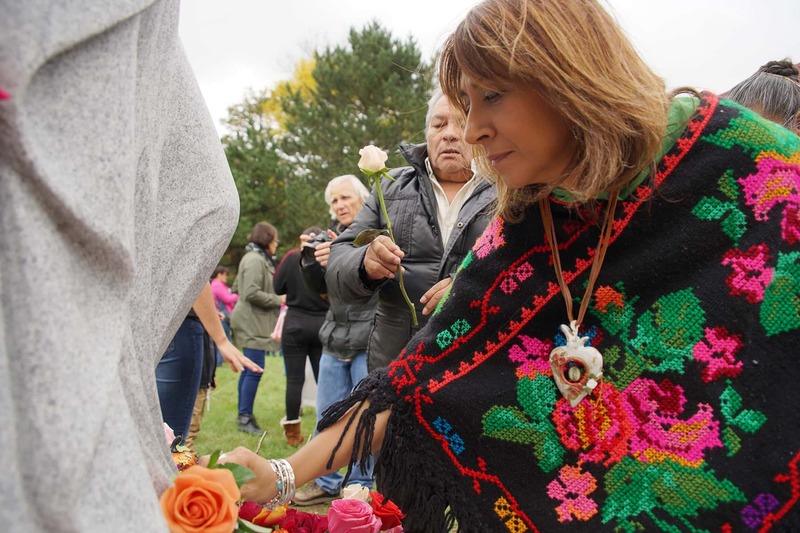 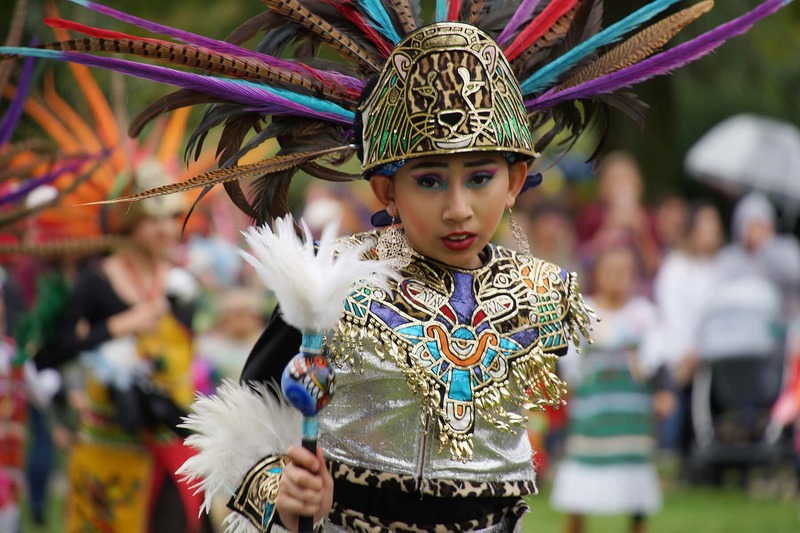 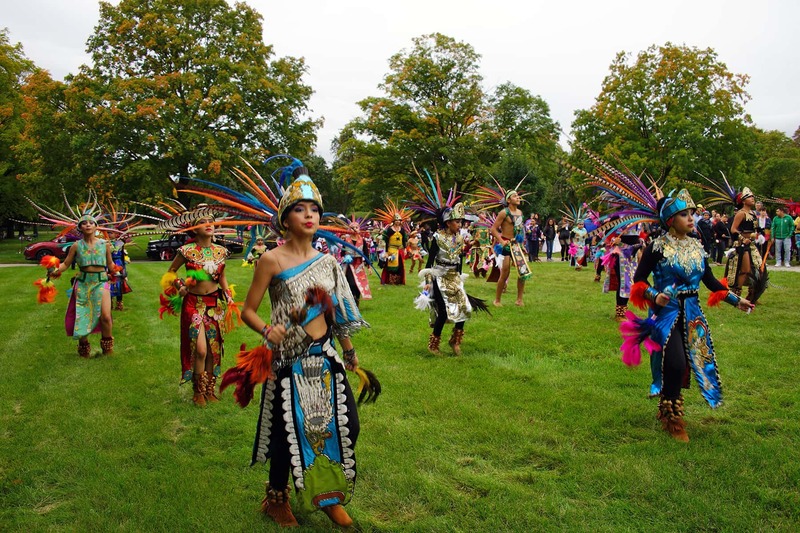 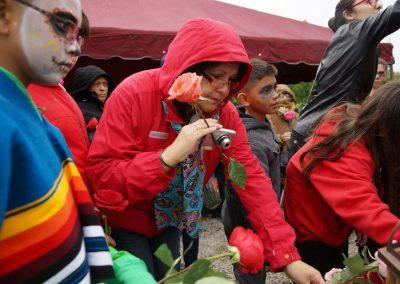 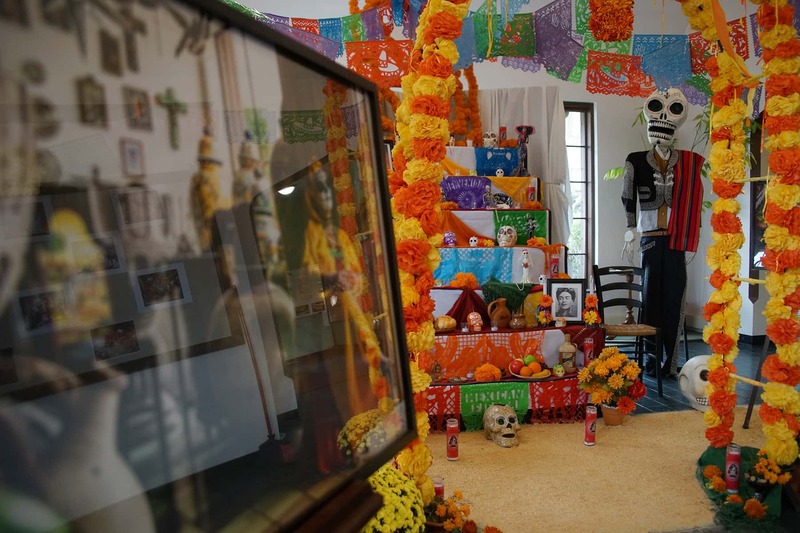 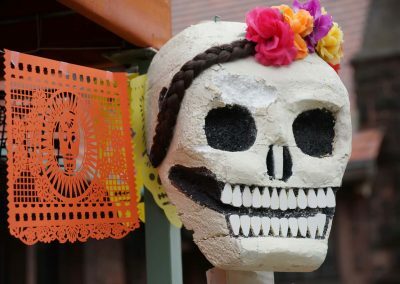 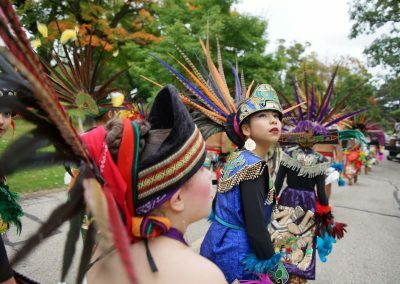 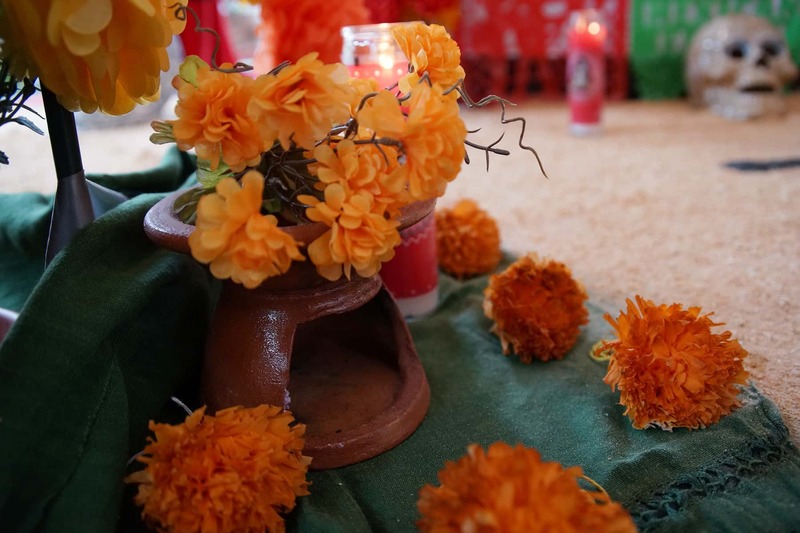 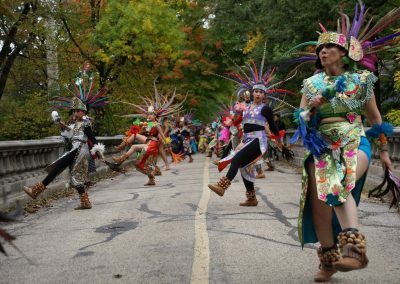 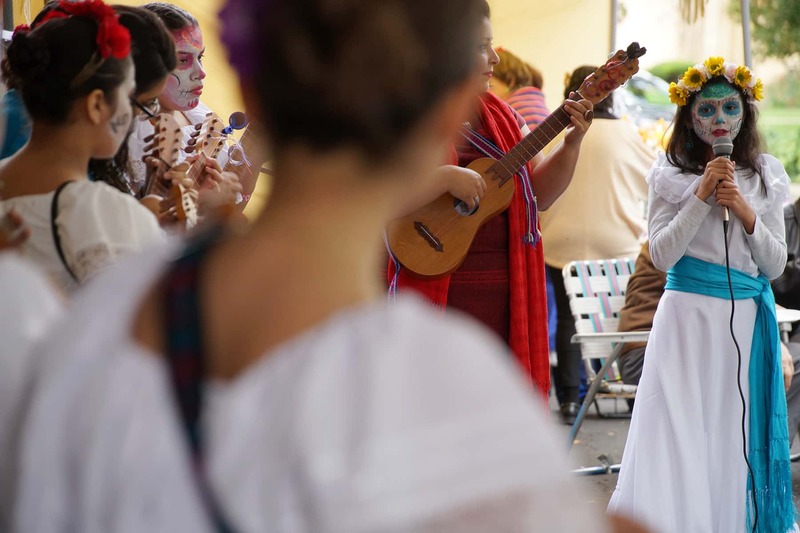 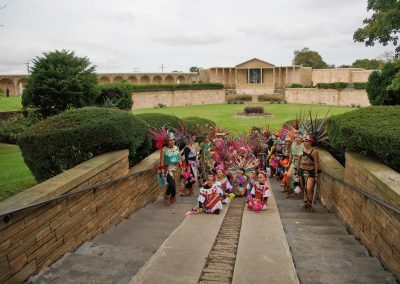 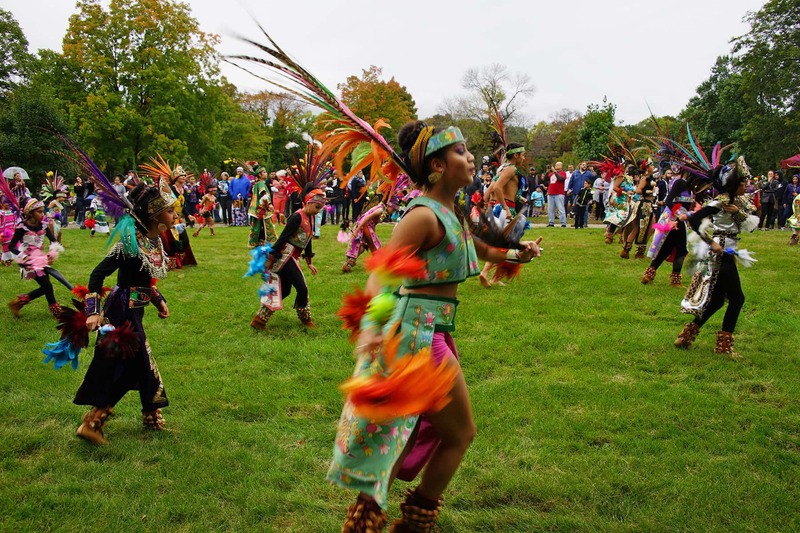 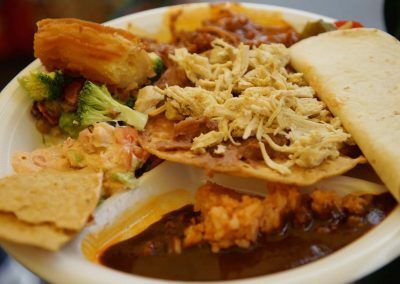 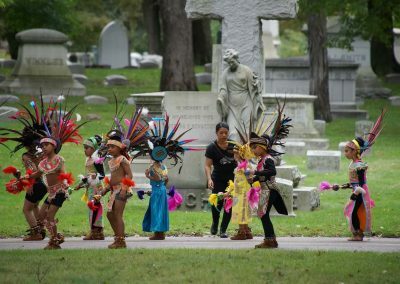 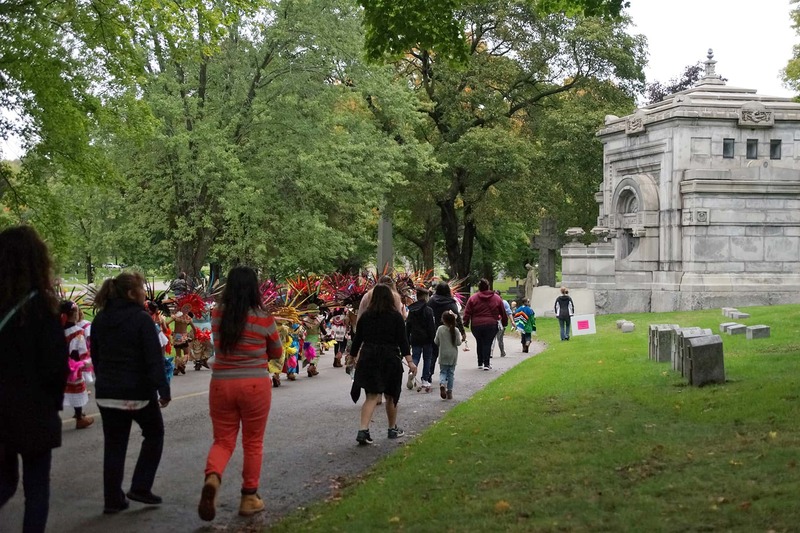 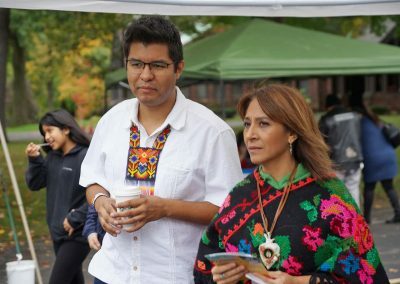 The oldest cemetery in the region hosted its first Día de los Muertos event on October 6, to honor the historic Mexican tradition and the heritage of the Hispanic population that has been a part of the surrounding South Side community. 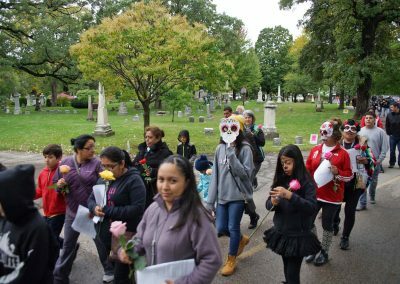 Organized along with Mexican Fiesta, families attended the free Day of the Dead Remembrance to commemorate loved ones who have departed. 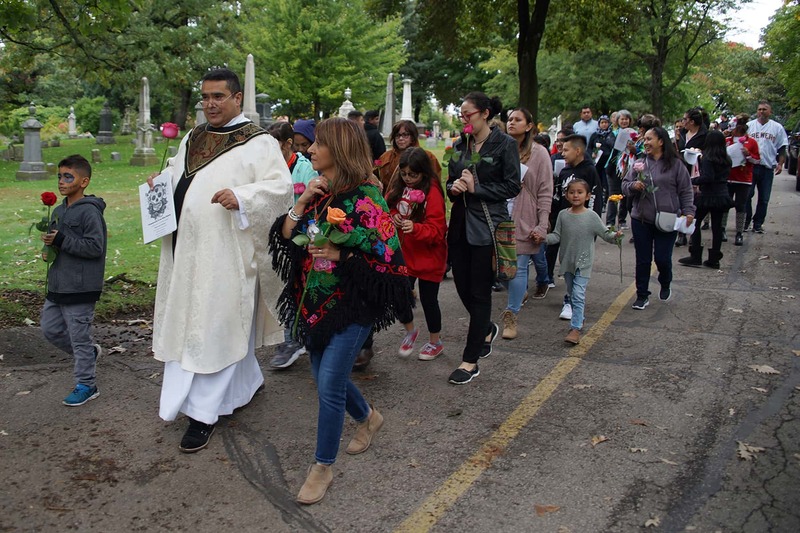 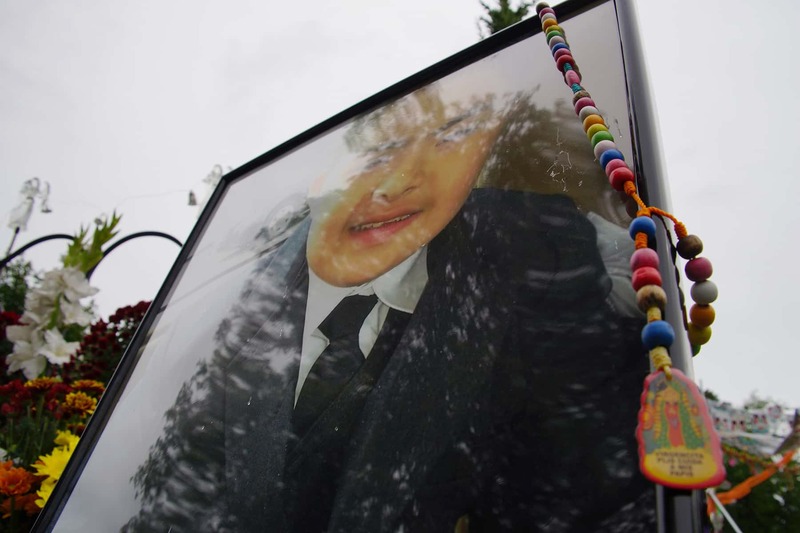 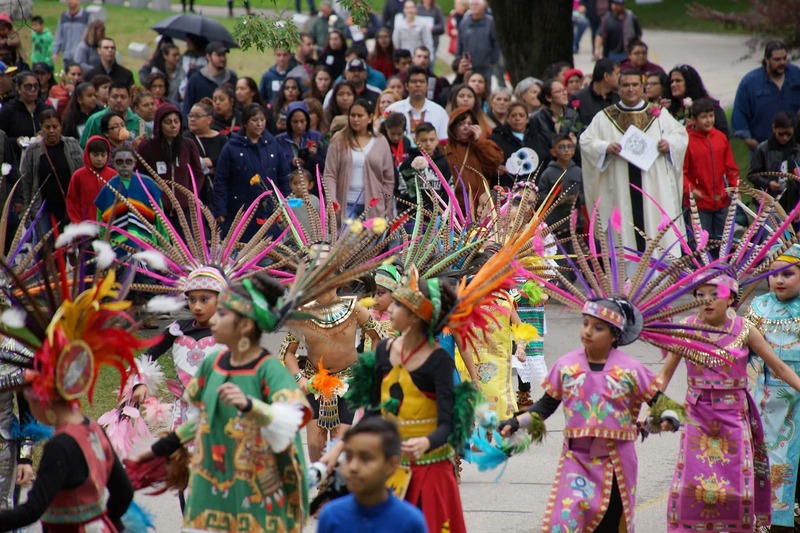 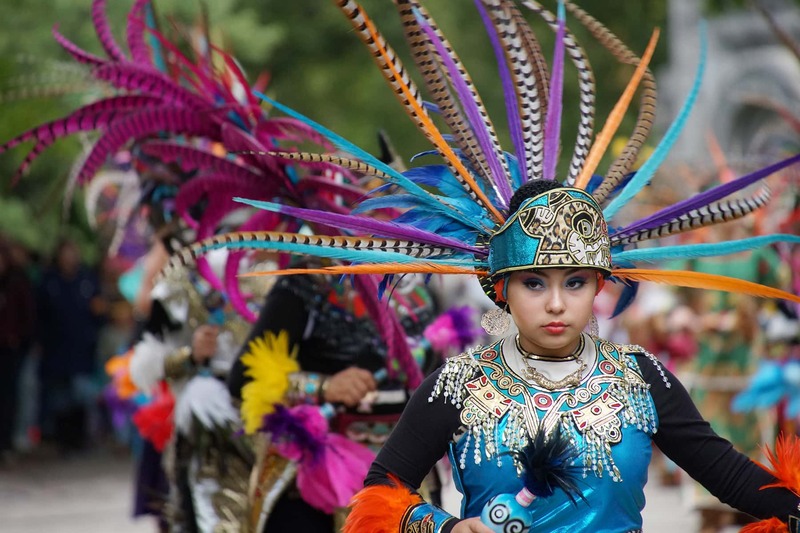 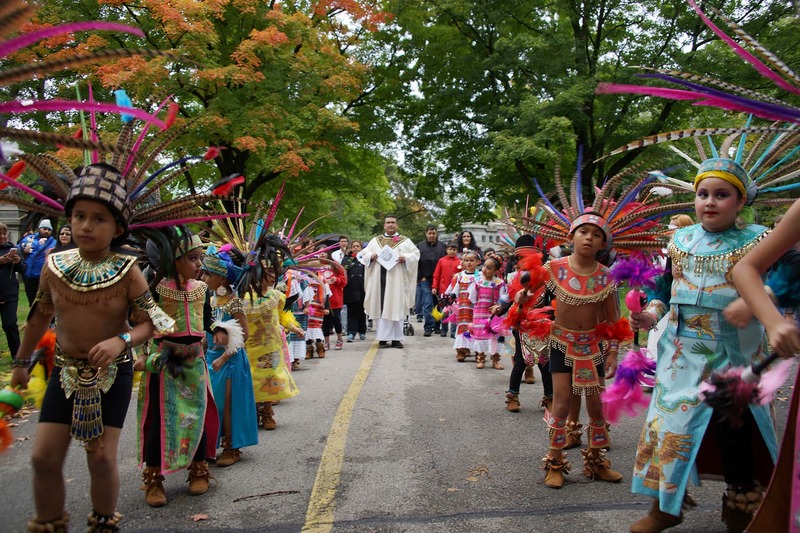 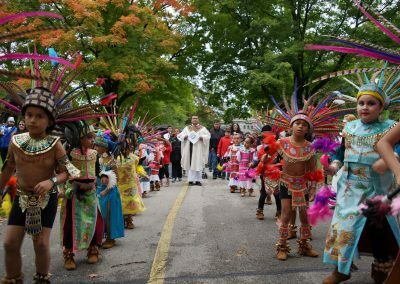 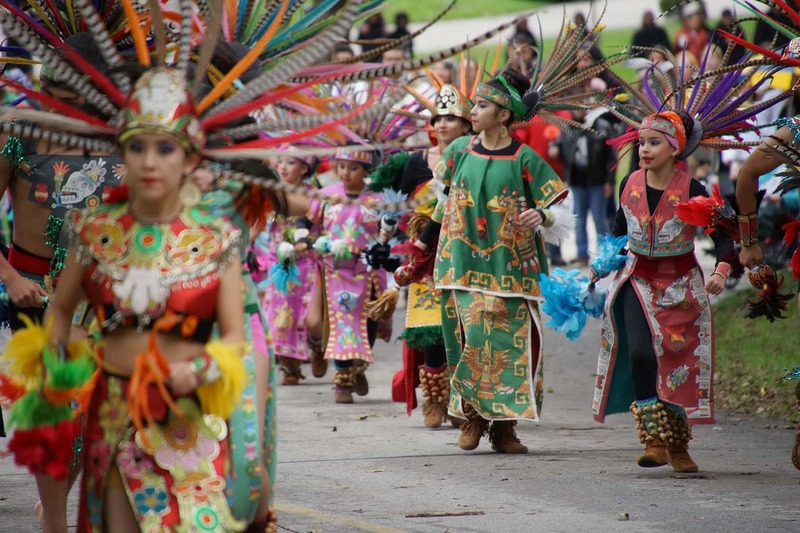 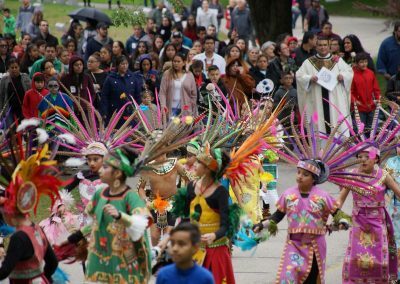 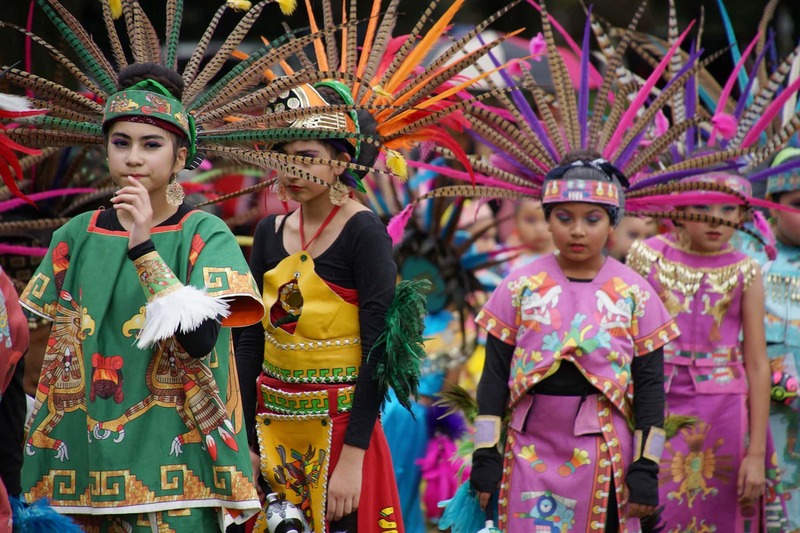 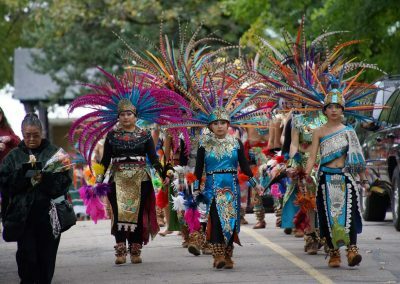 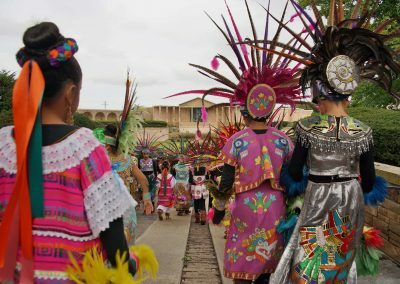 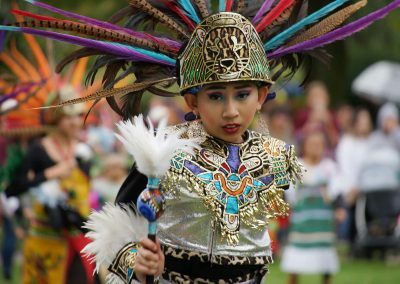 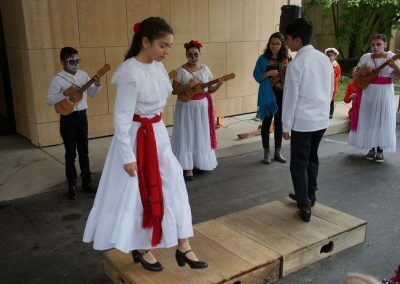 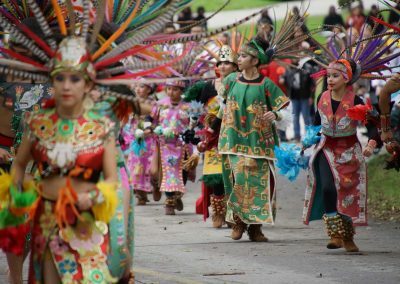 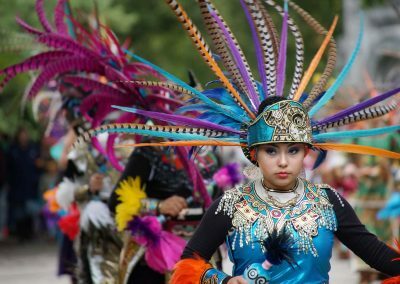 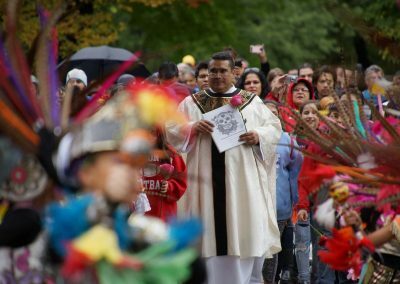 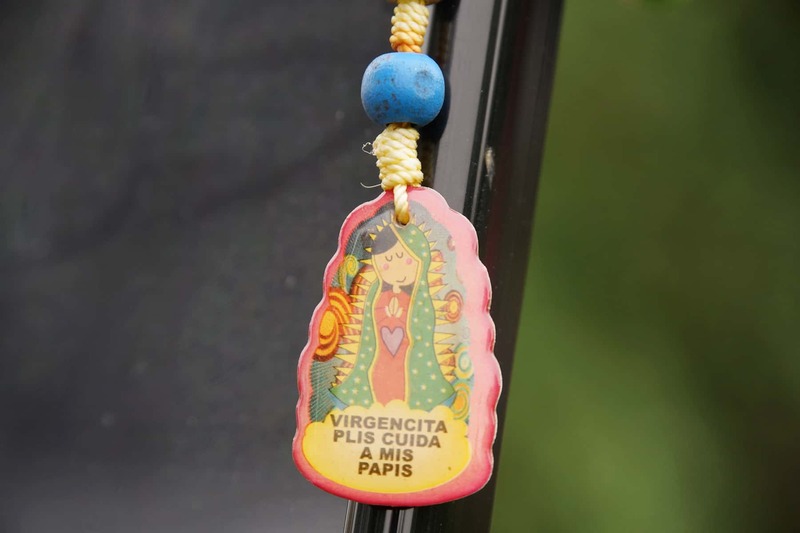 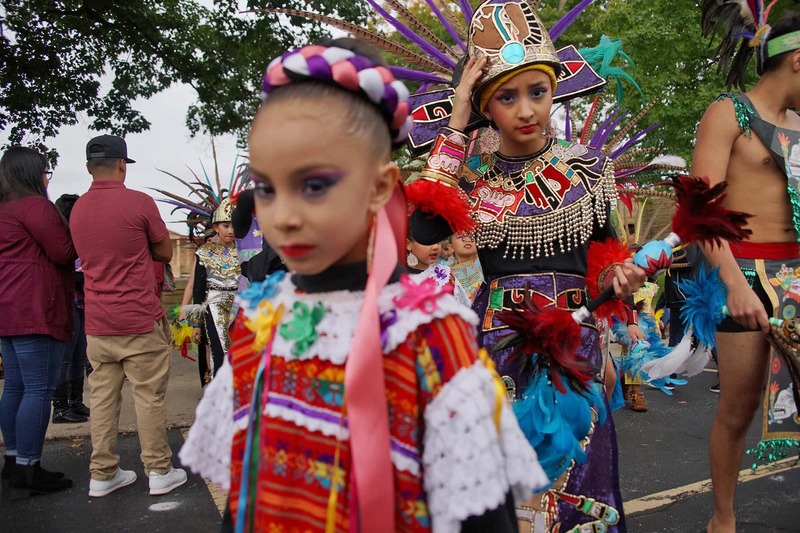 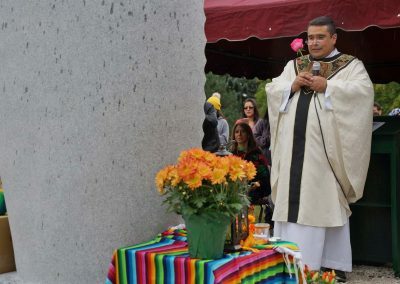 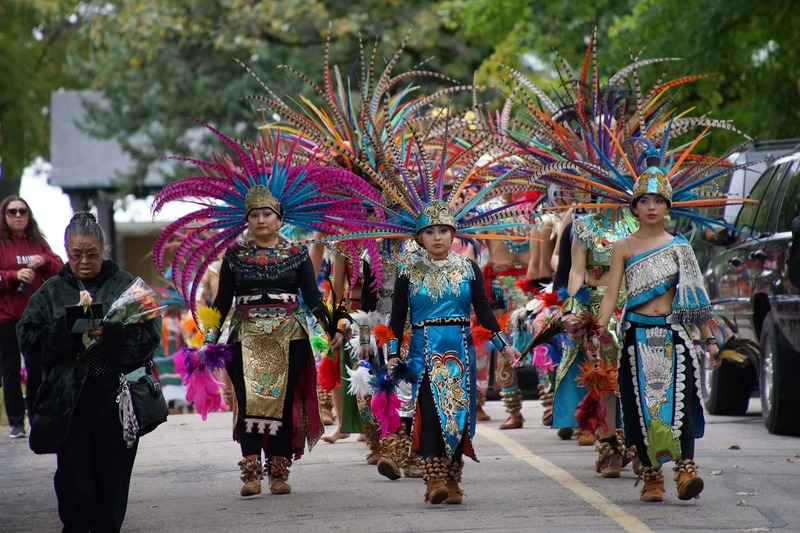 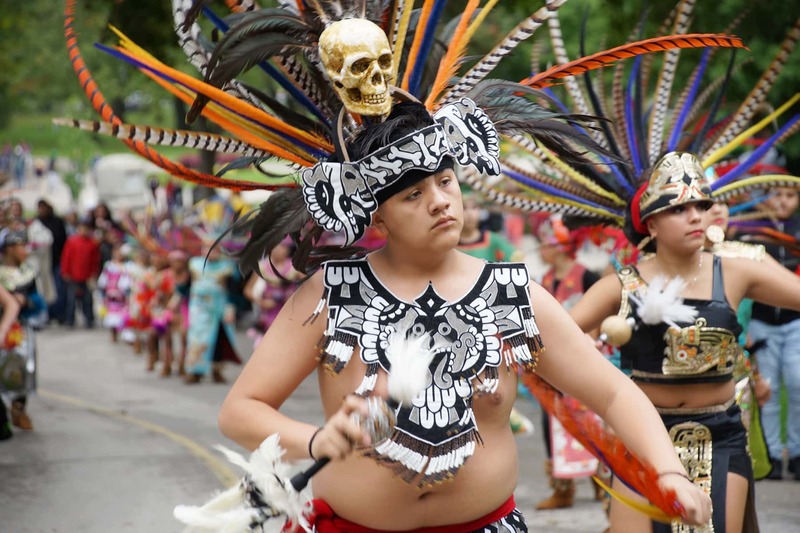 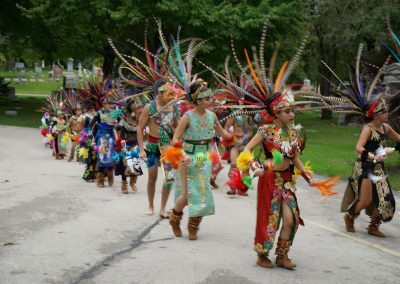 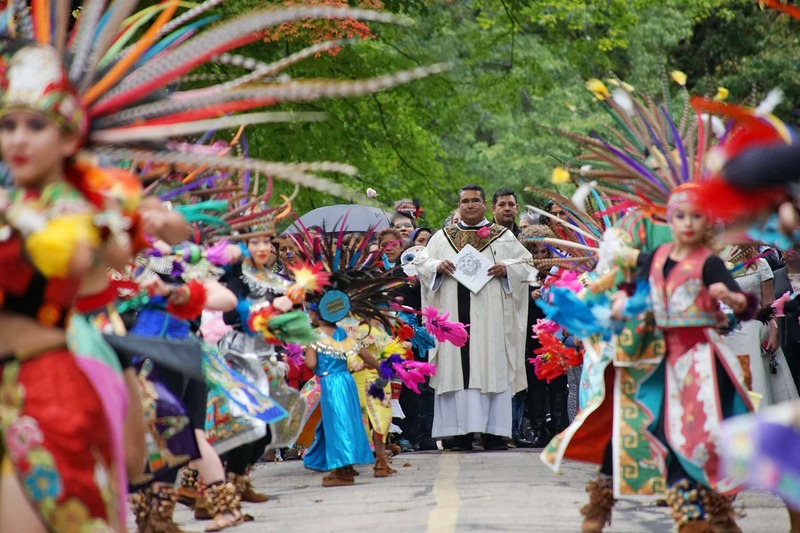 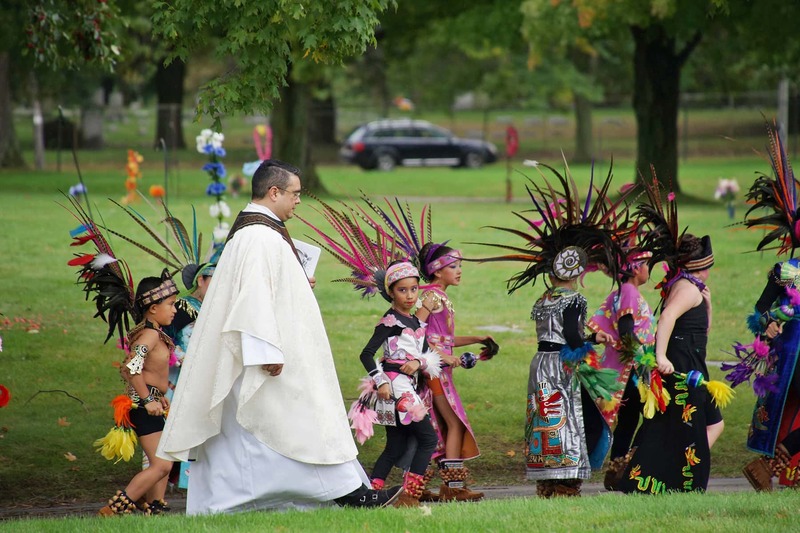 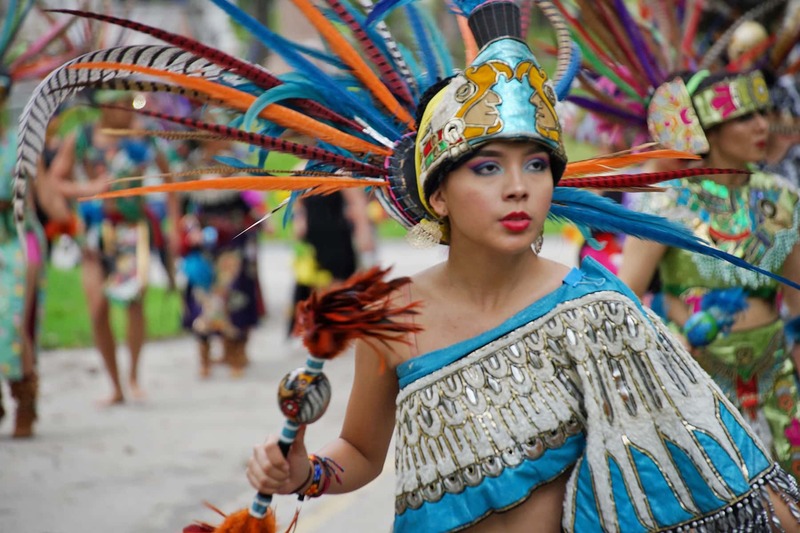 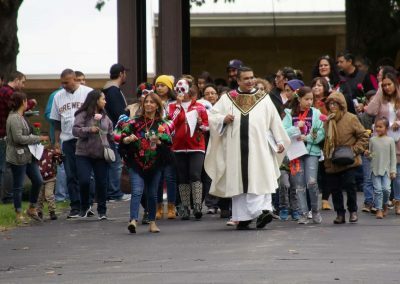 The Service of Remembrance was given by Father Norberto Sandoval of St Roman’s Parish, and the procession was led by the Dance Academy of Mexico. 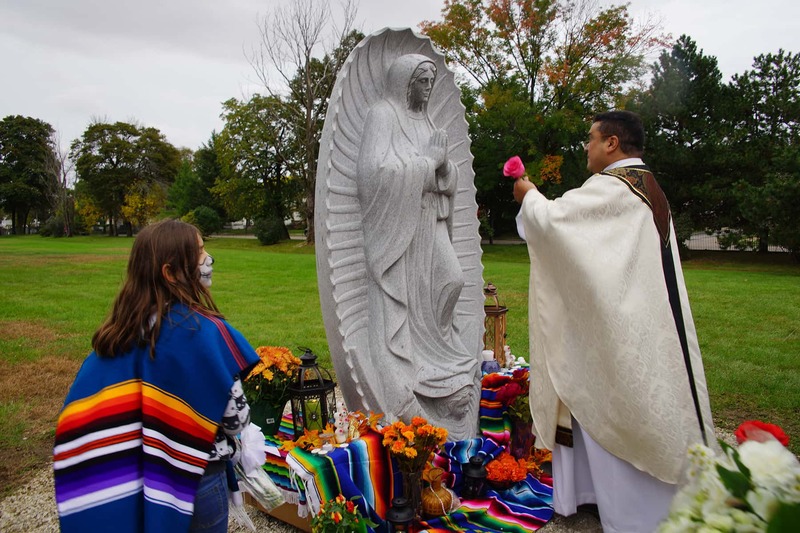 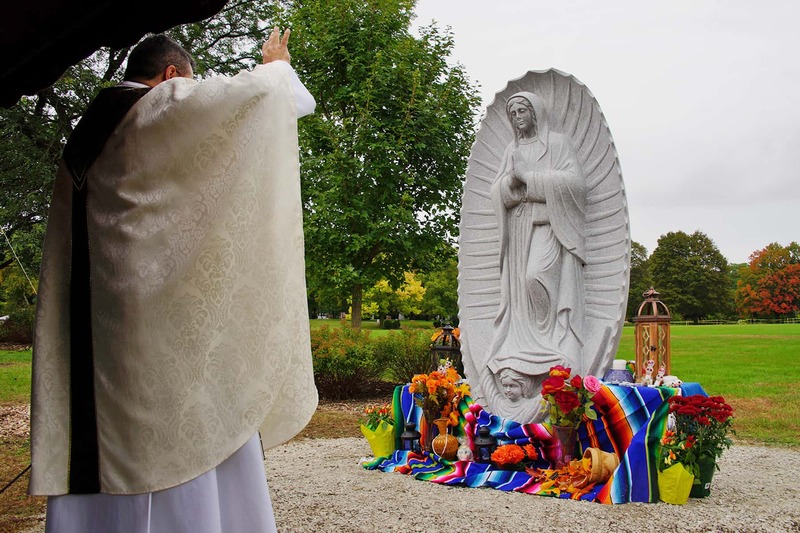 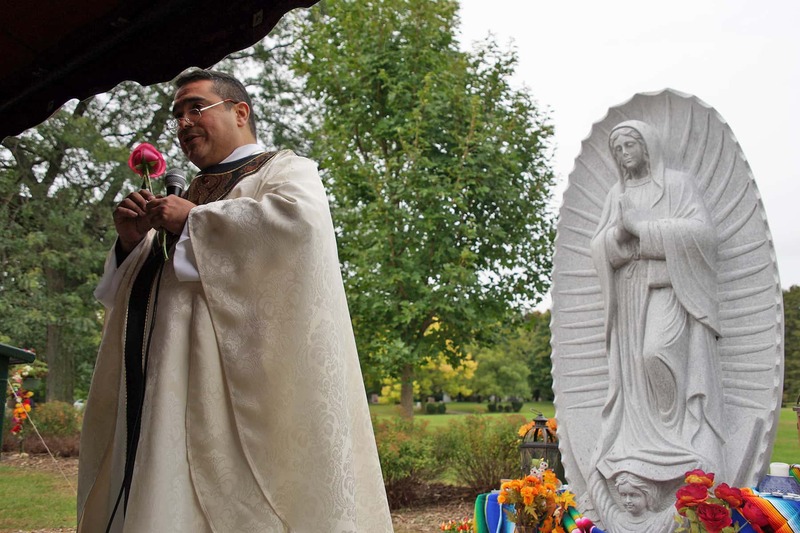 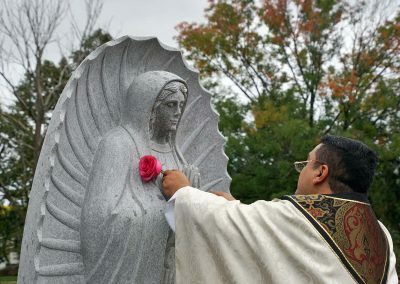 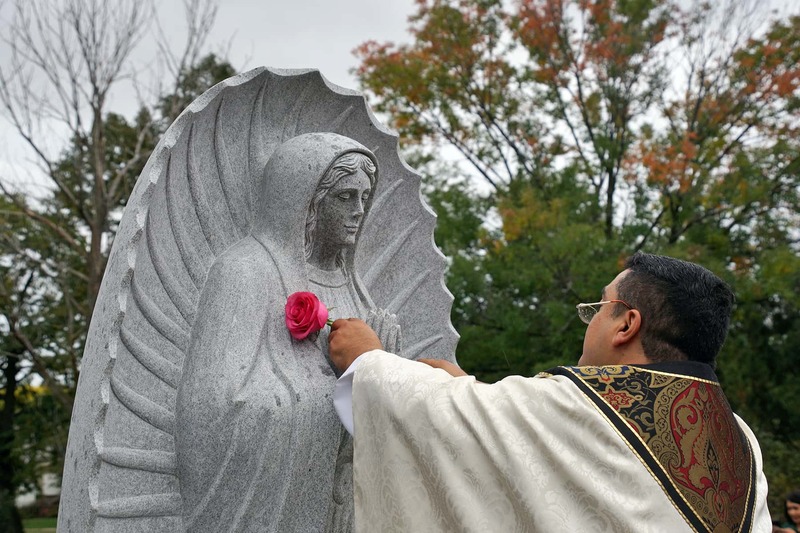 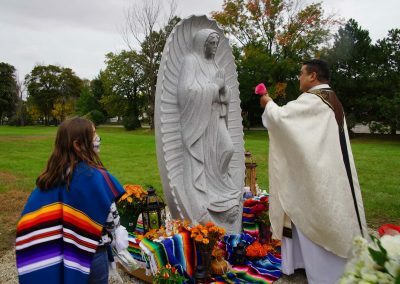 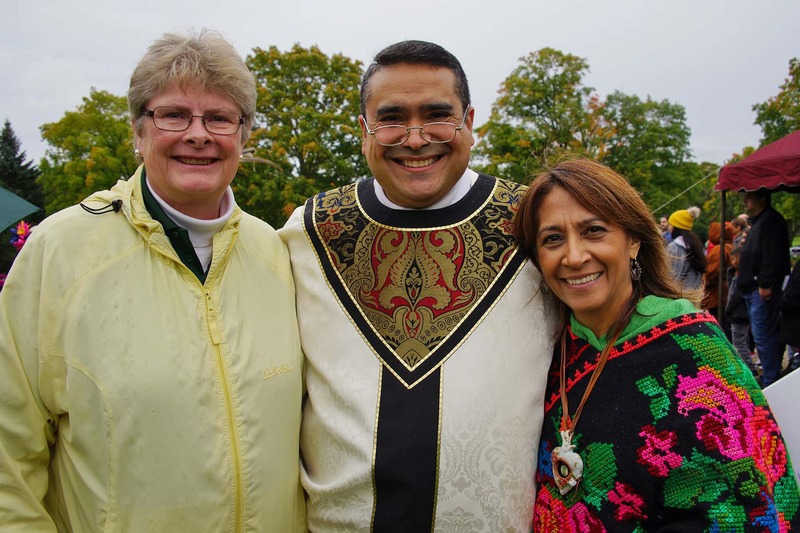 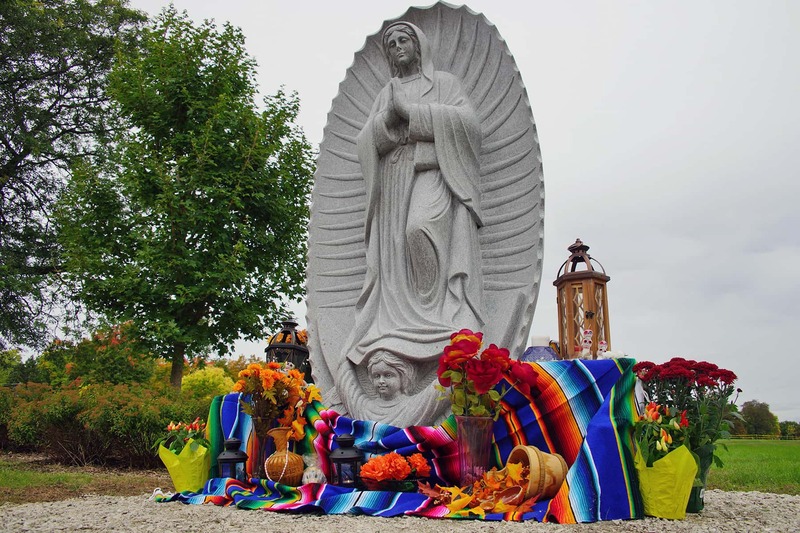 Father Sandoval blessed the statue of Our Lady of Guadalupe that was installed at Forest Home, to reflect the faith needs of the growing population. 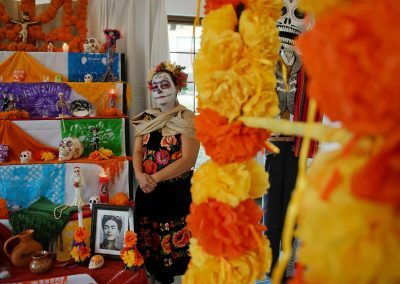 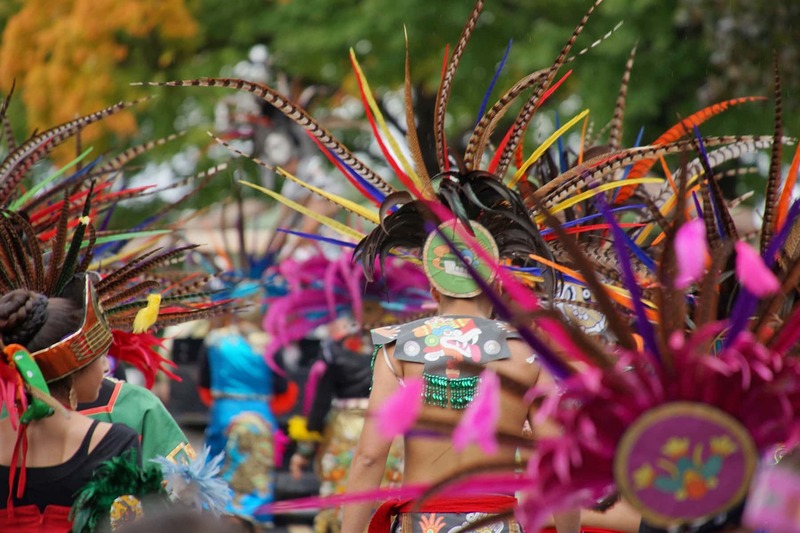 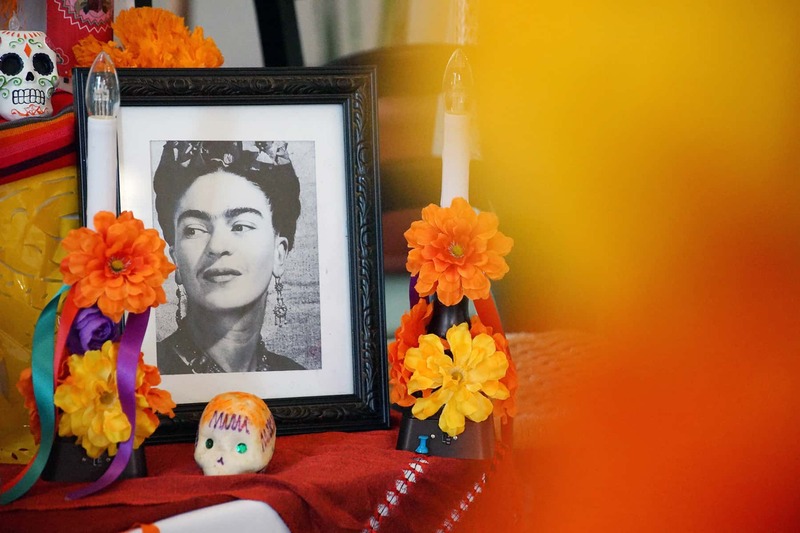 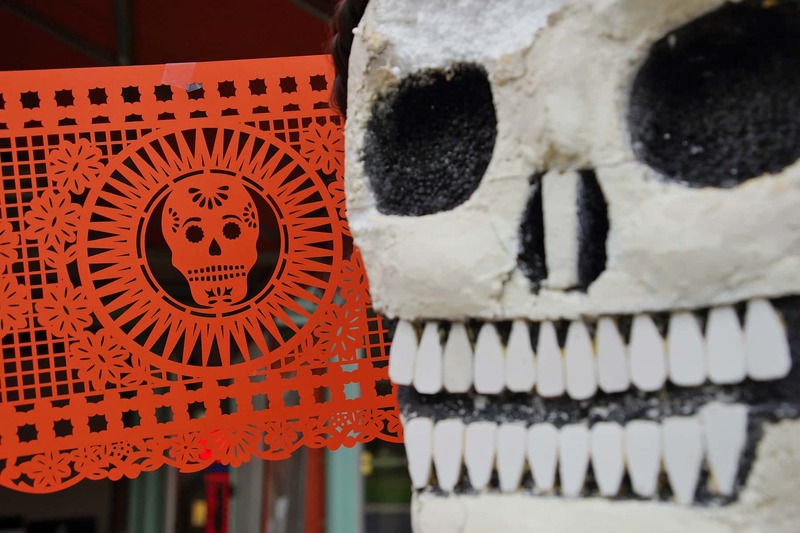 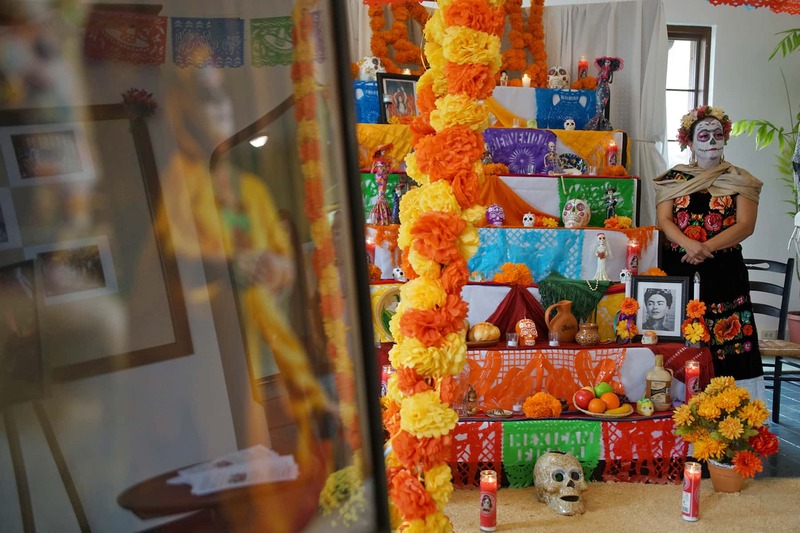 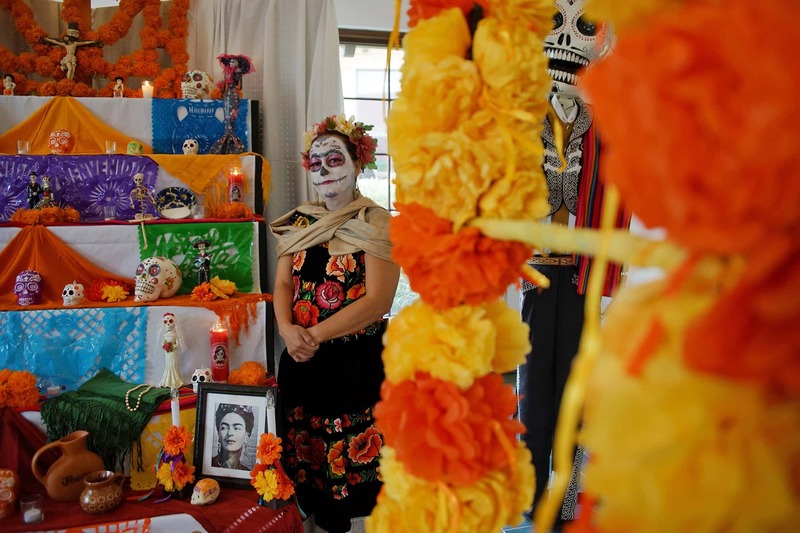 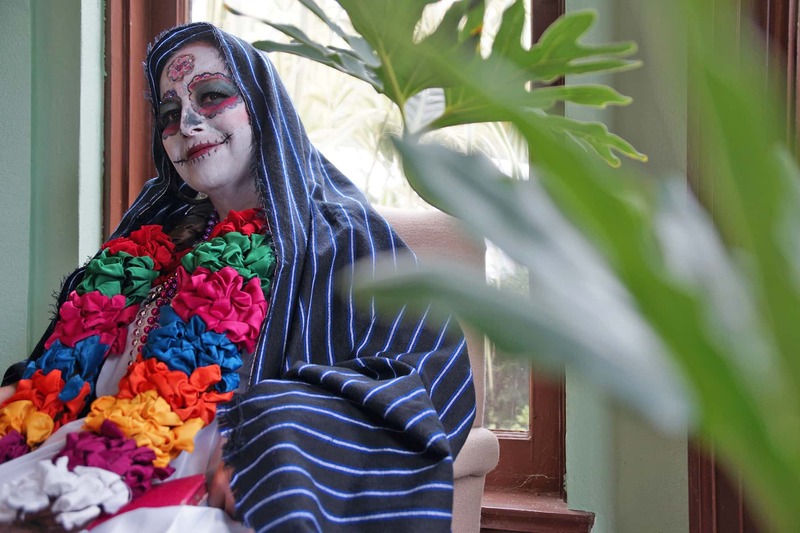 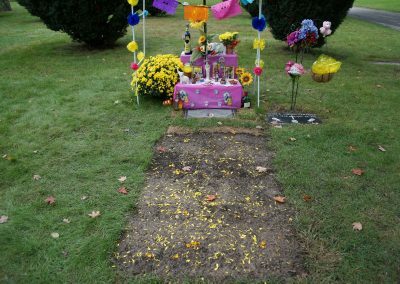 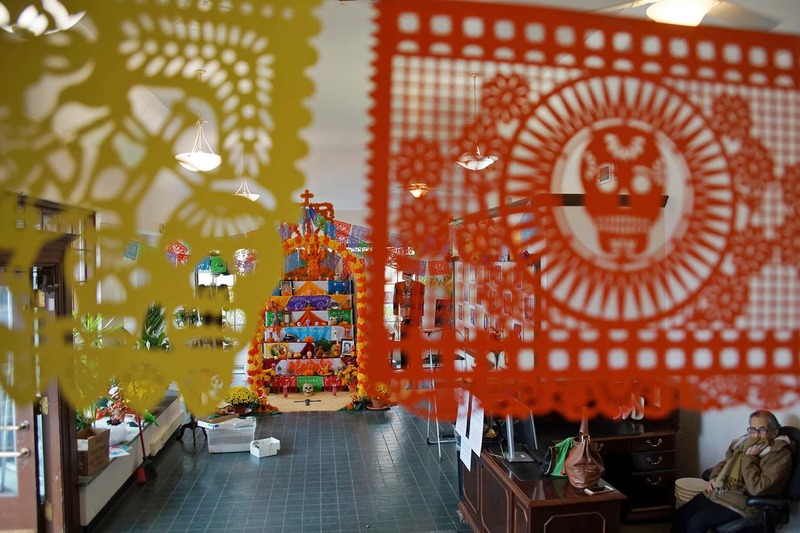 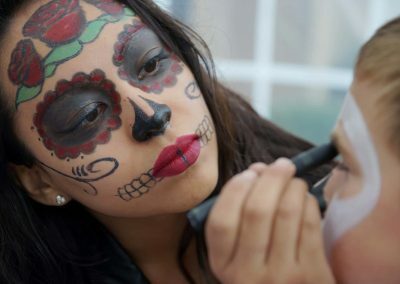 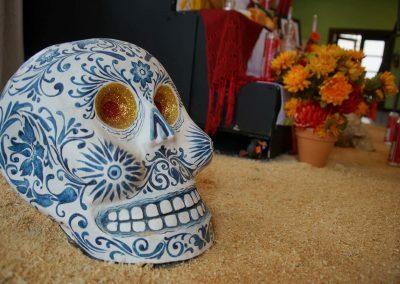 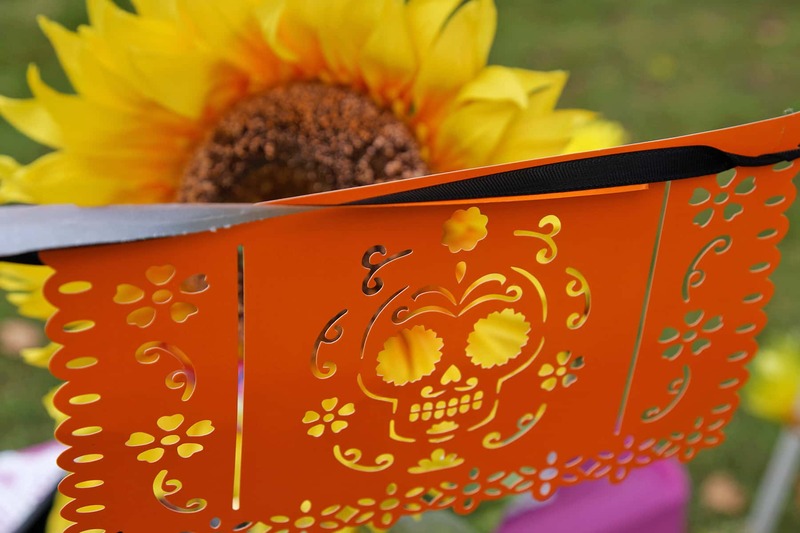 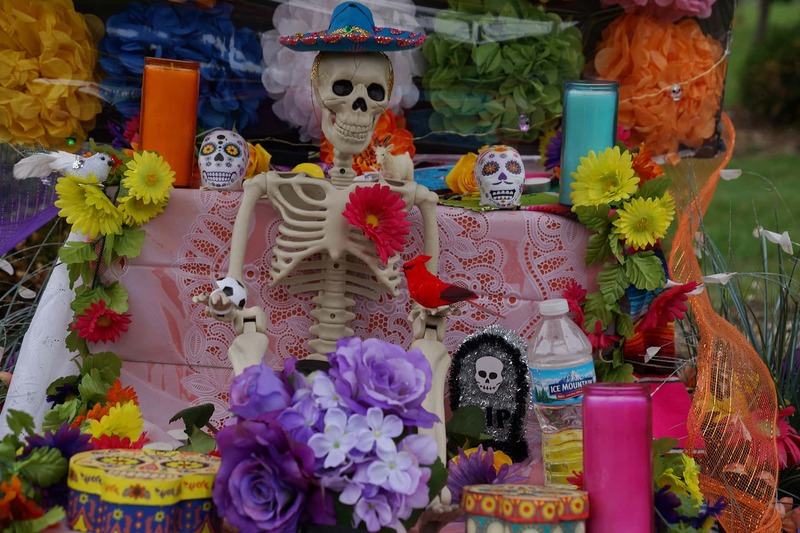 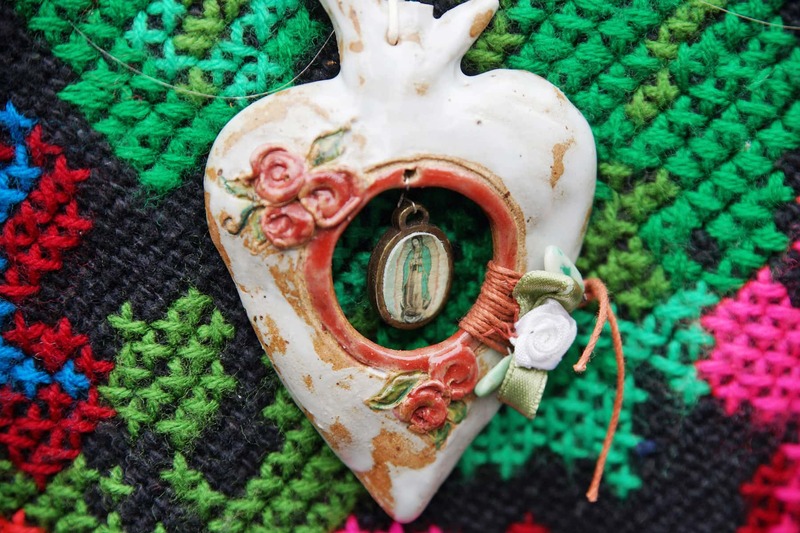 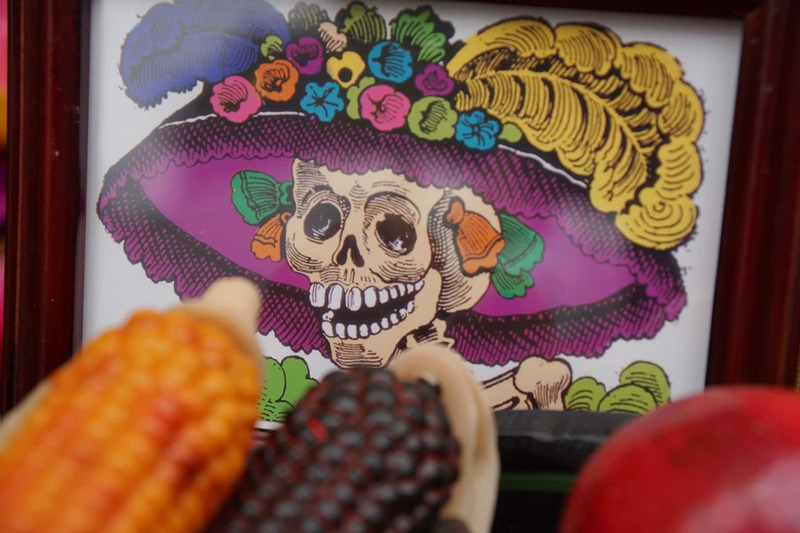 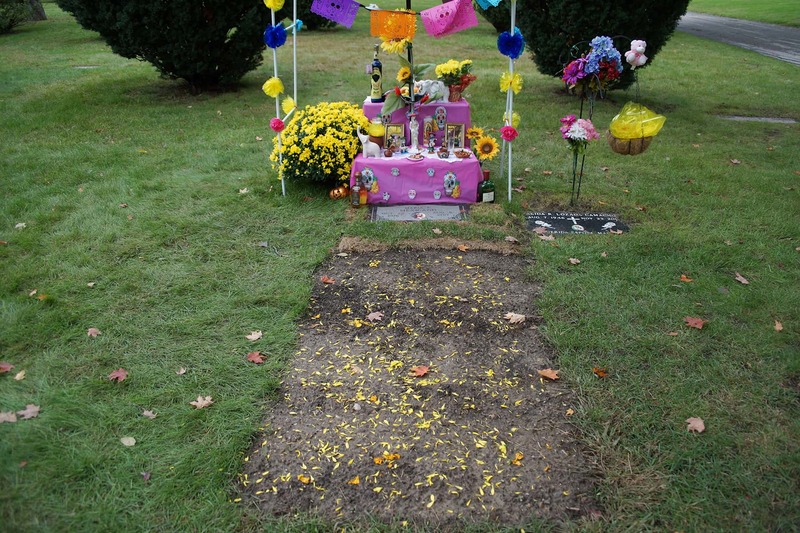 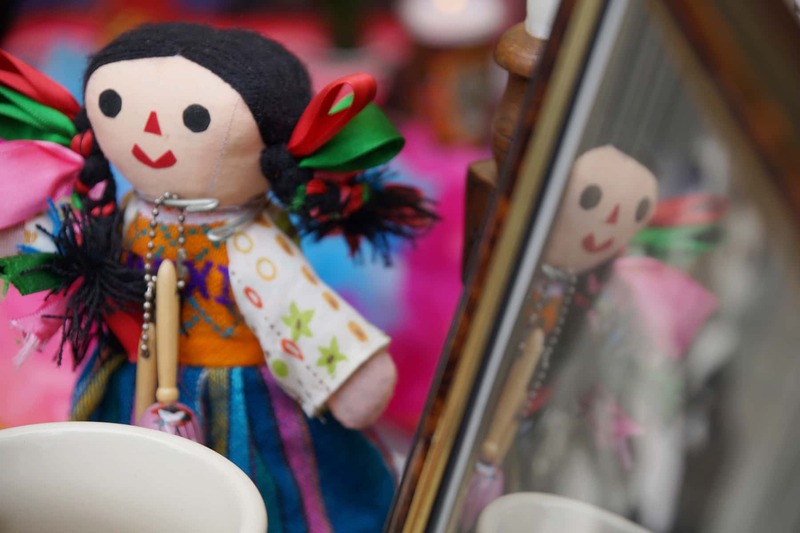 Día de los Muertos is a century-old Mexican holiday that honors loved ones who have passed away. 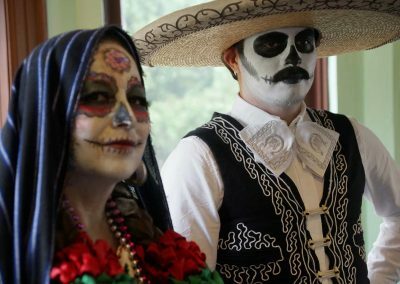 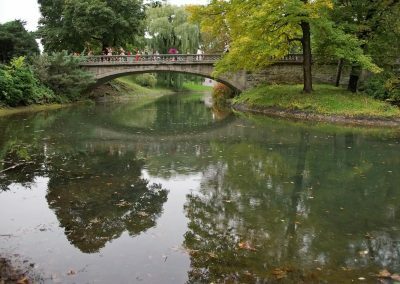 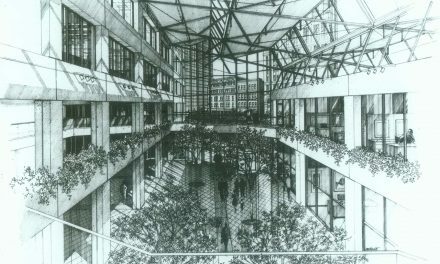 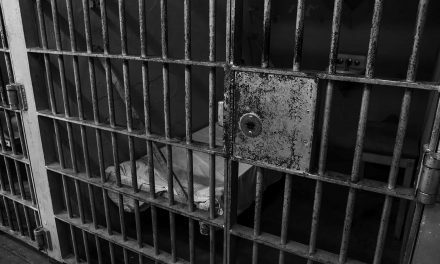 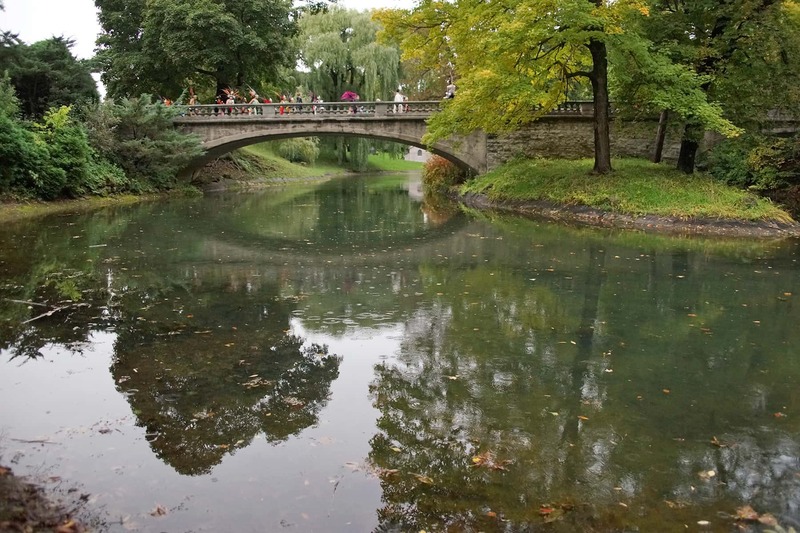 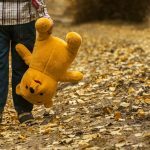 It loosely coincides with the American tradition of Halloween, but it is a cheerful celebration with no spooky connotations. 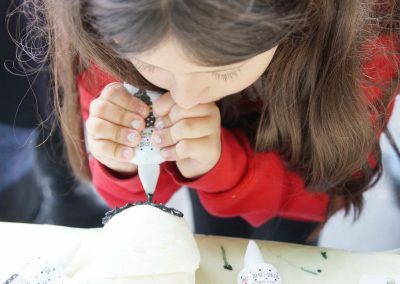 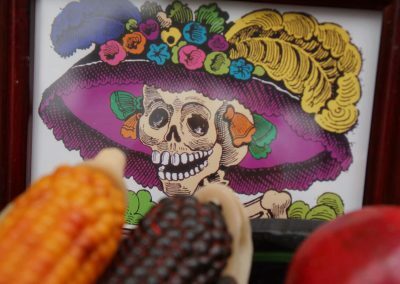 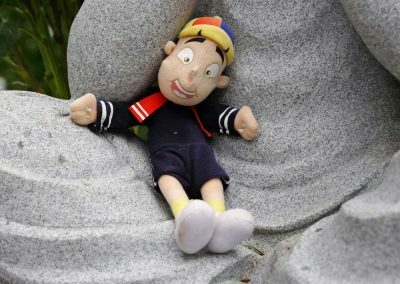 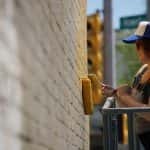 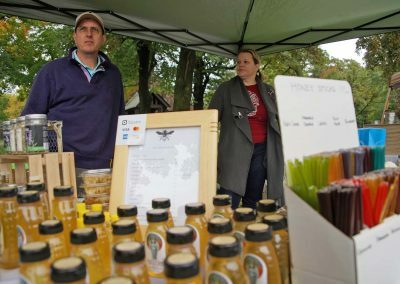 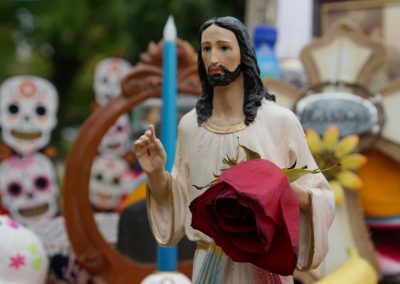 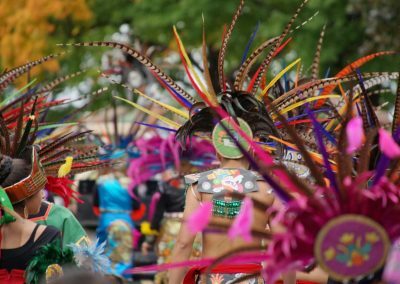 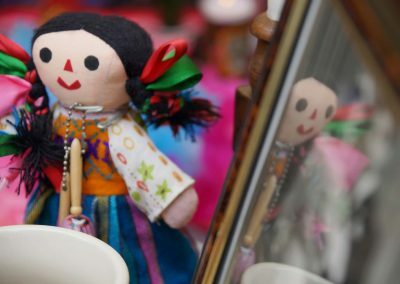 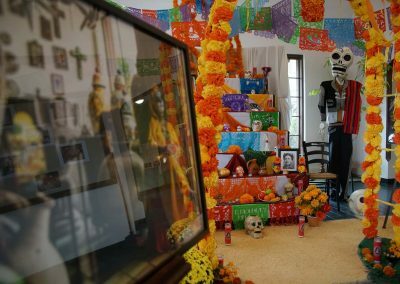 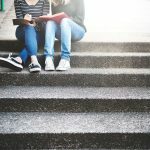 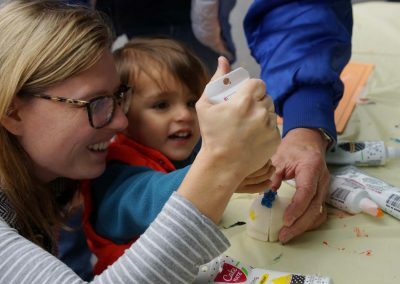 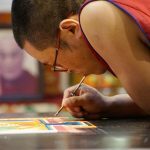 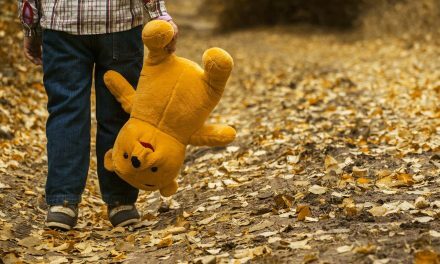 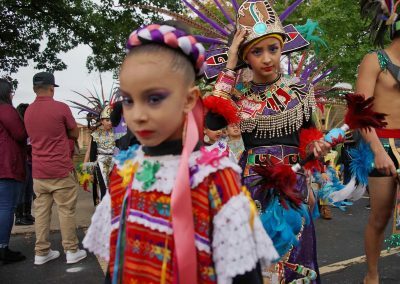 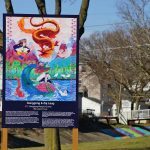 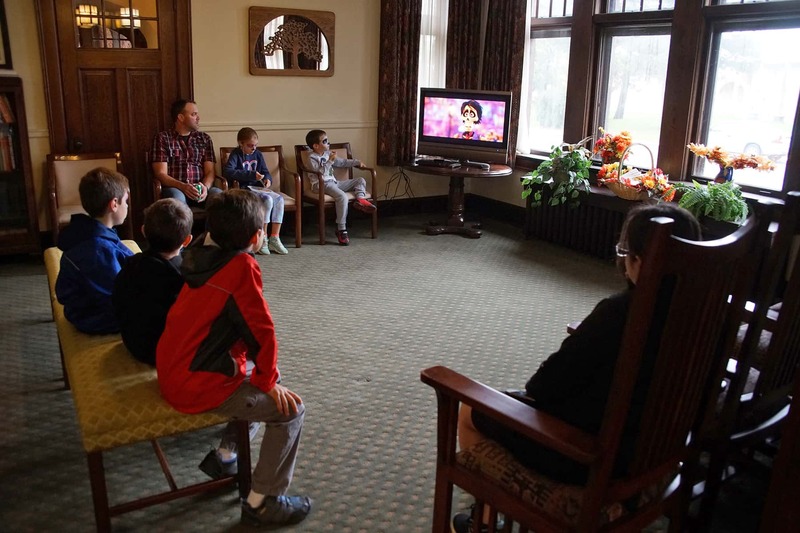 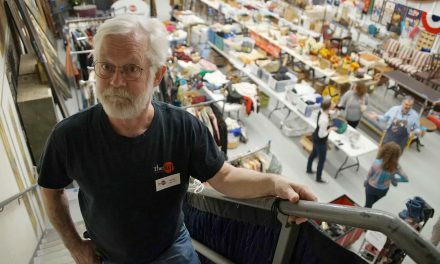 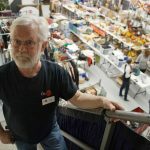 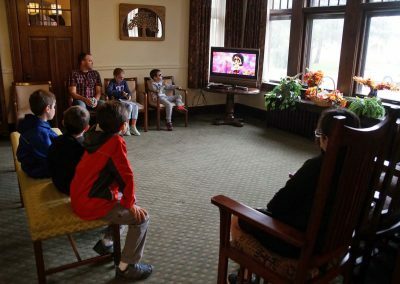 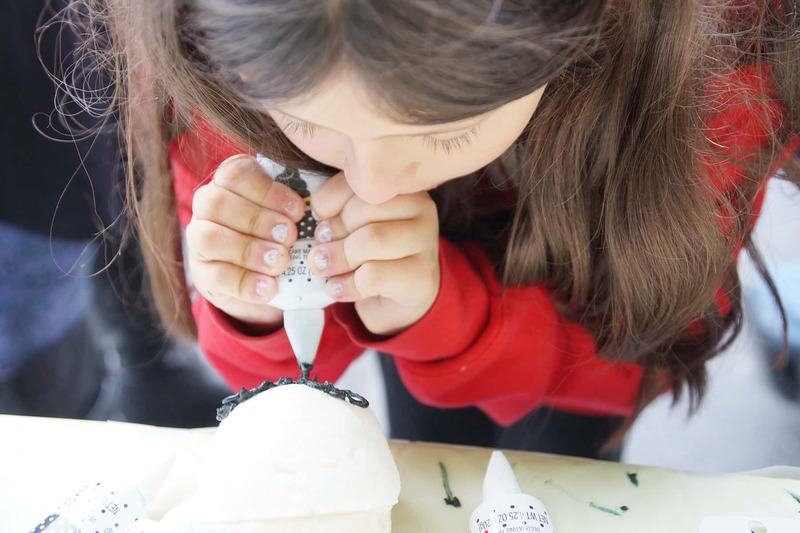 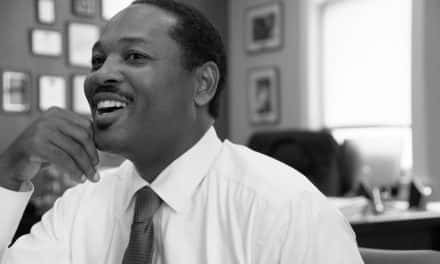 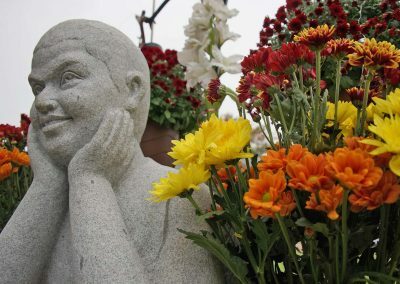 Thanks to the popular 3D computer-animated film “Coco” by Pixar and Walt Disney, the American public has become more familiar with the holiday tradition and its meaning. 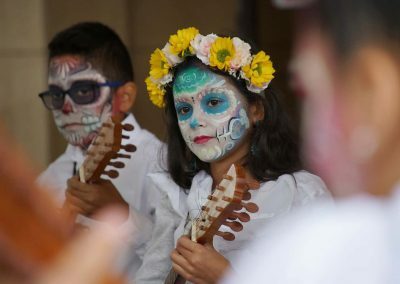 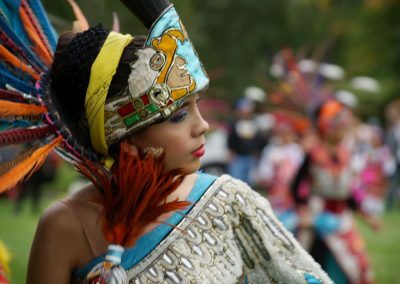 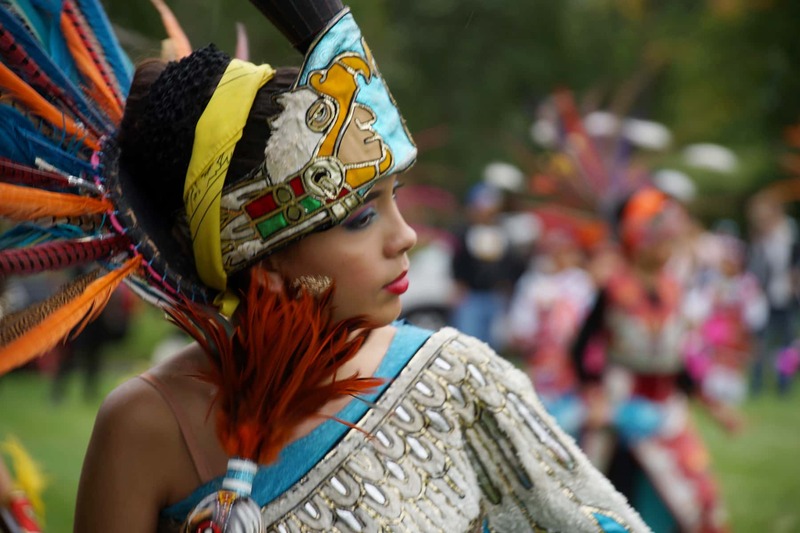 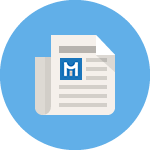 Originating from the Catholic All Souls’ Day, as well as Aztec and other indigenous beliefs, it is a vibrant day of observance that has little resemblance to the symbolism of Halloween. 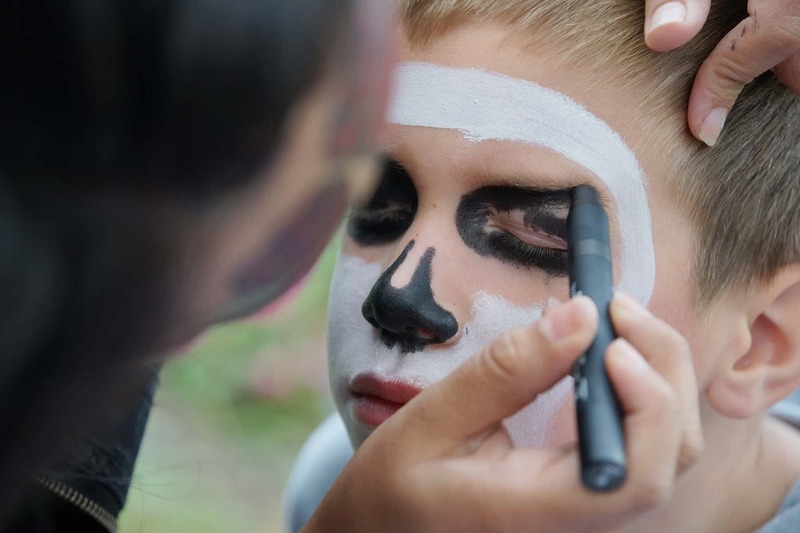 Masks were traditionally worn, but the practice evolved as people began painting their faces to look like skulls. 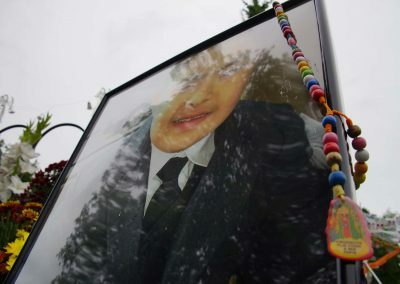 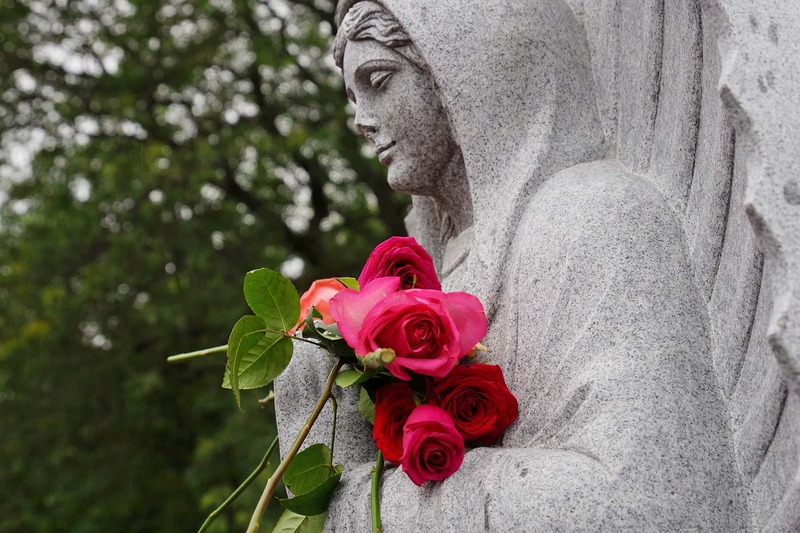 The expression is seen as a chance to overcome the fear of death. 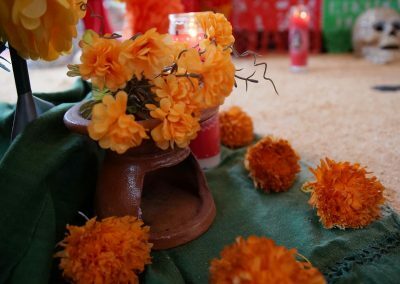 Marigolds are used in abundance due to the belief that they invite the spirits of the dеаd back to earth. 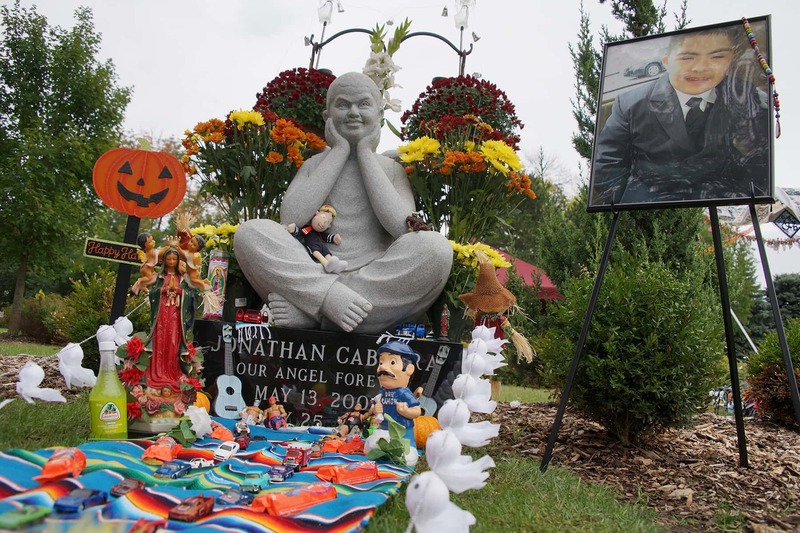 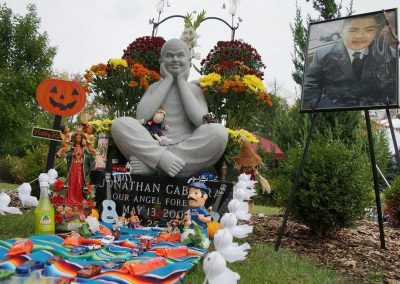 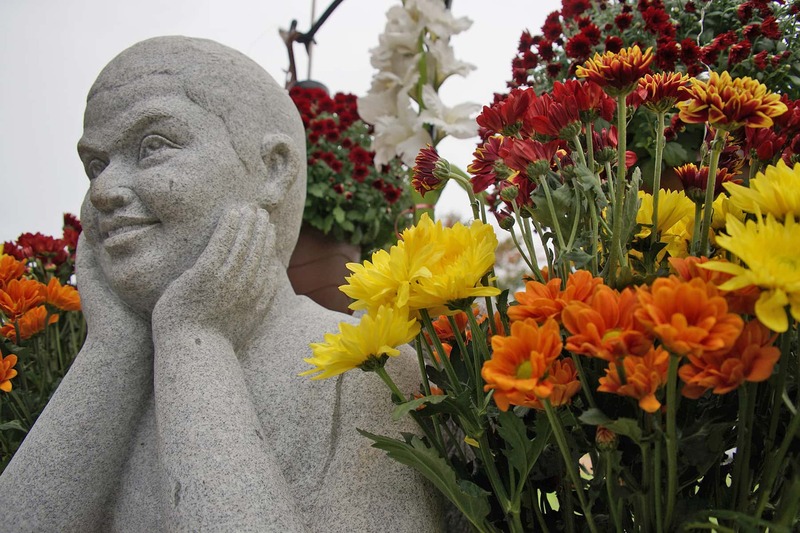 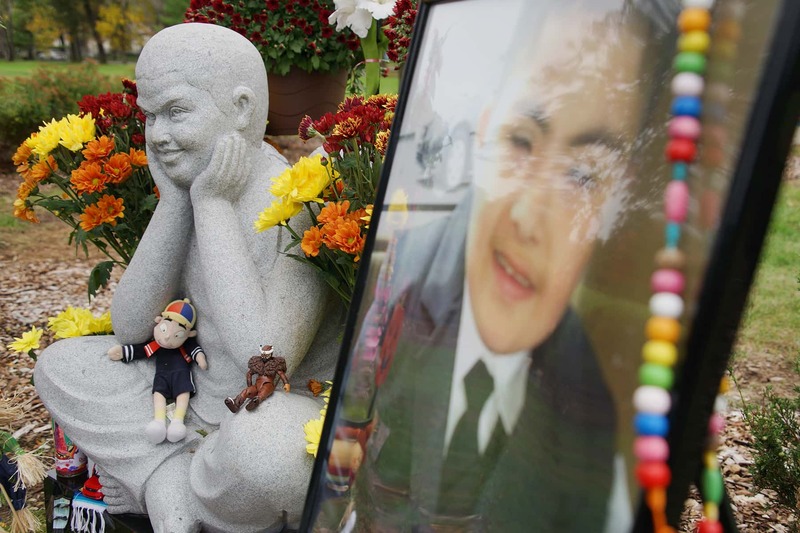 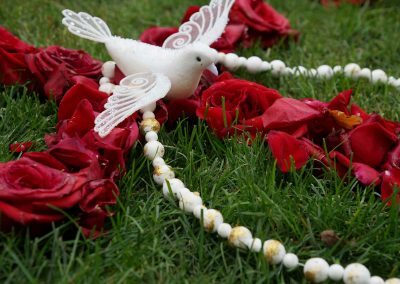 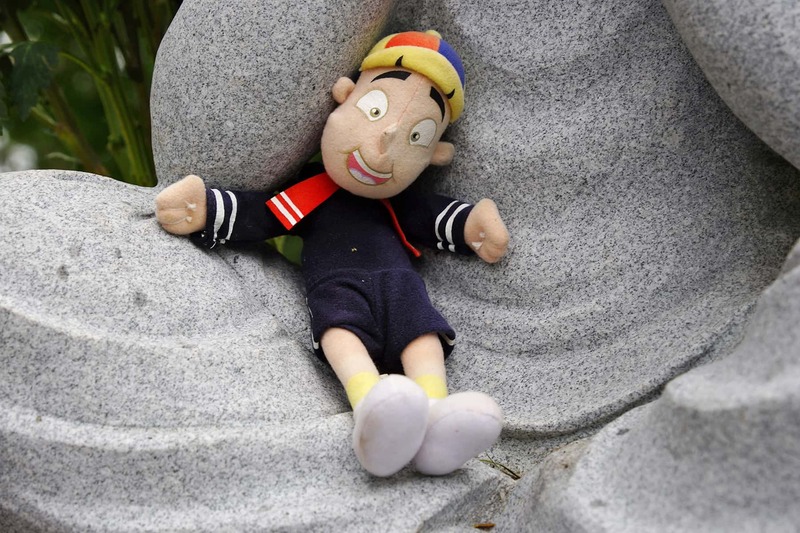 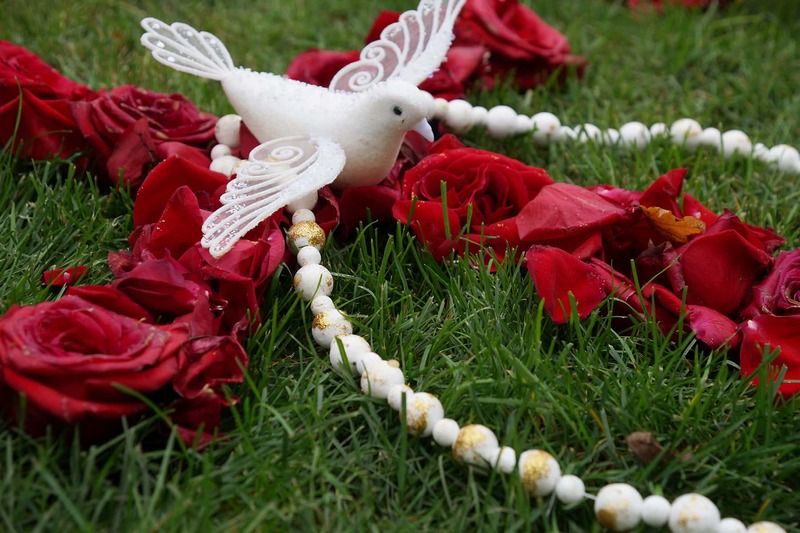 It is also the custom to build Ofrendas, small shrines with offerings, to the loved ones who have passed away. 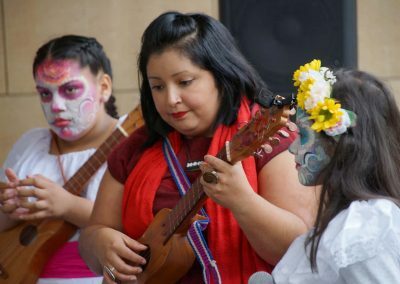 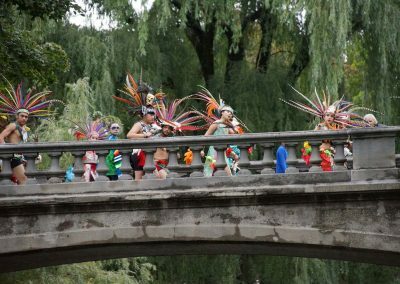 Other performances during Día de los Muertos included “música de son” by Milwaz Talleres/CoraSon y Madera and Grupo Renacer. 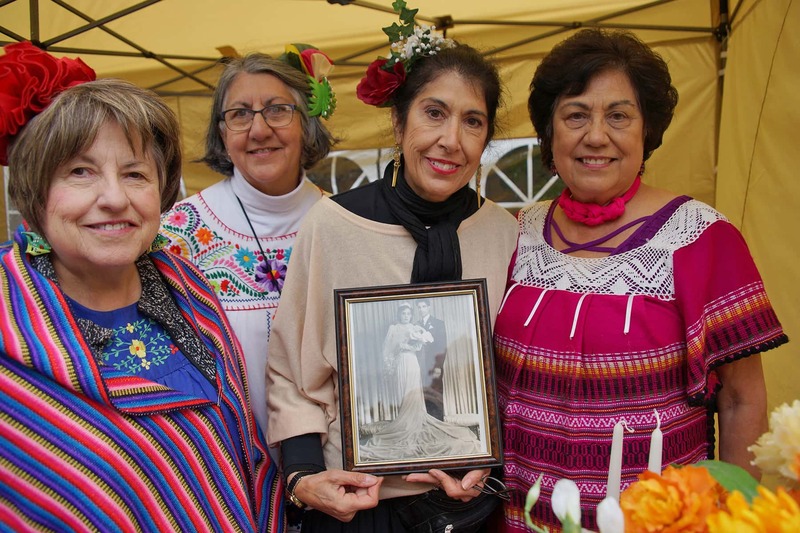 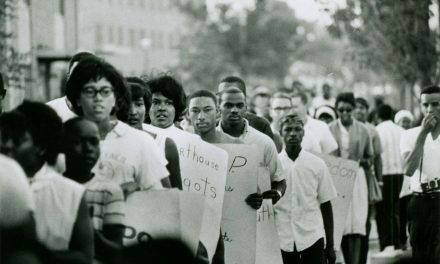 A genealogy booth helped those who attended trace their family history. 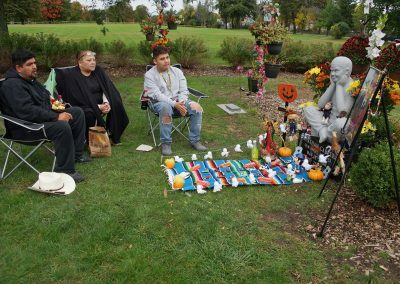 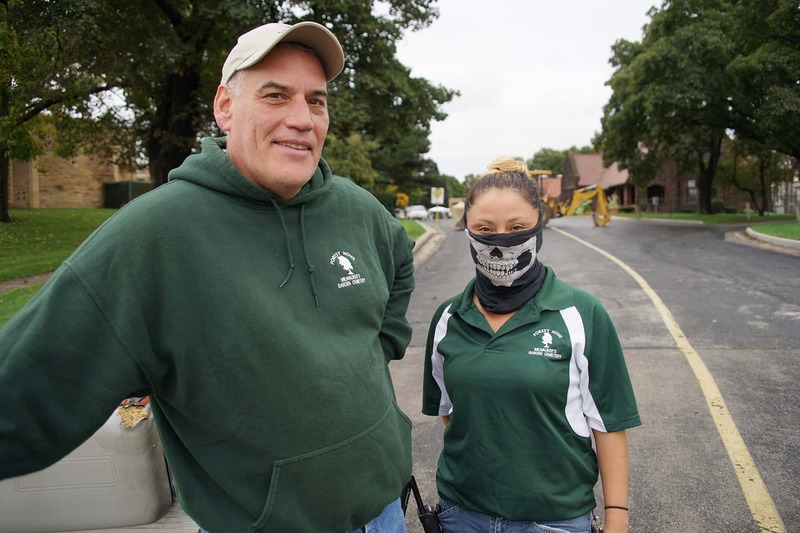 Forest Home has also given permission to families with loved ones resting there to decorate graves from October 3 through October 10. 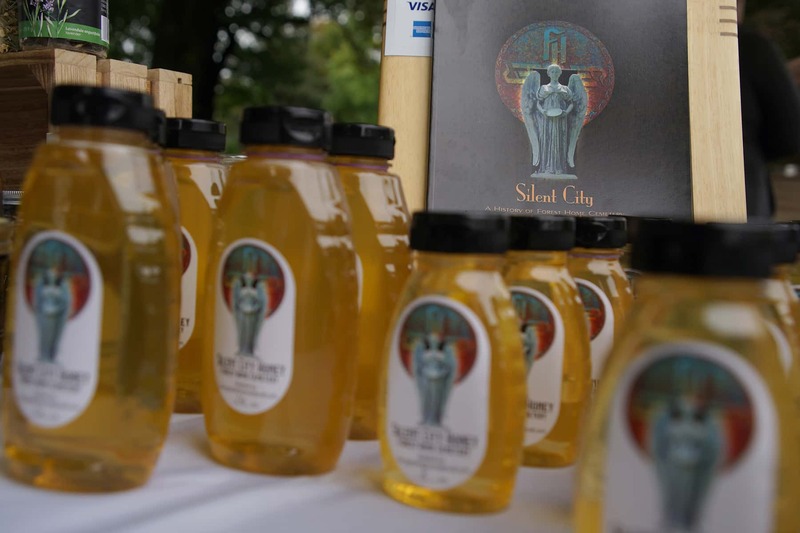 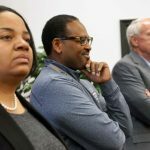 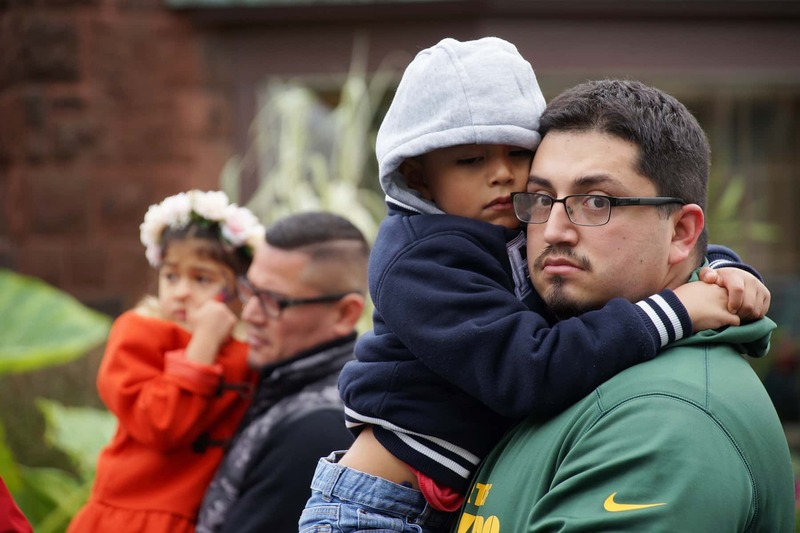 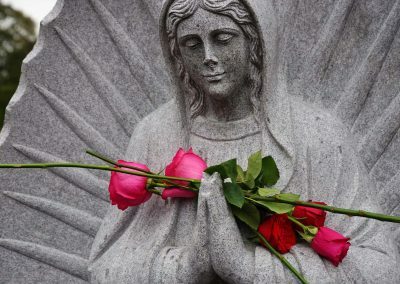 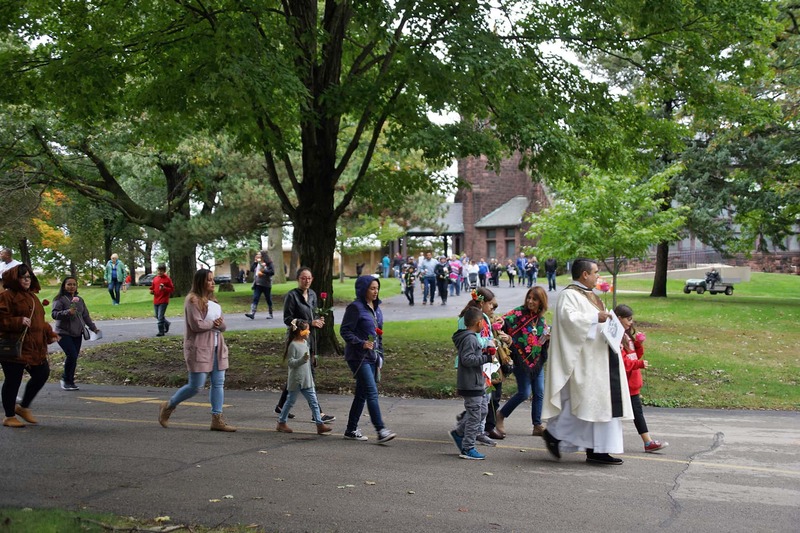 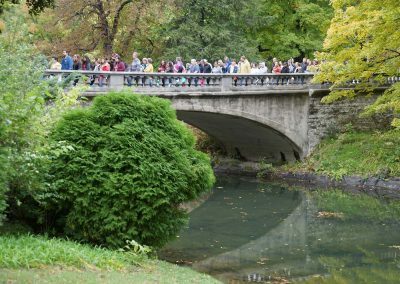 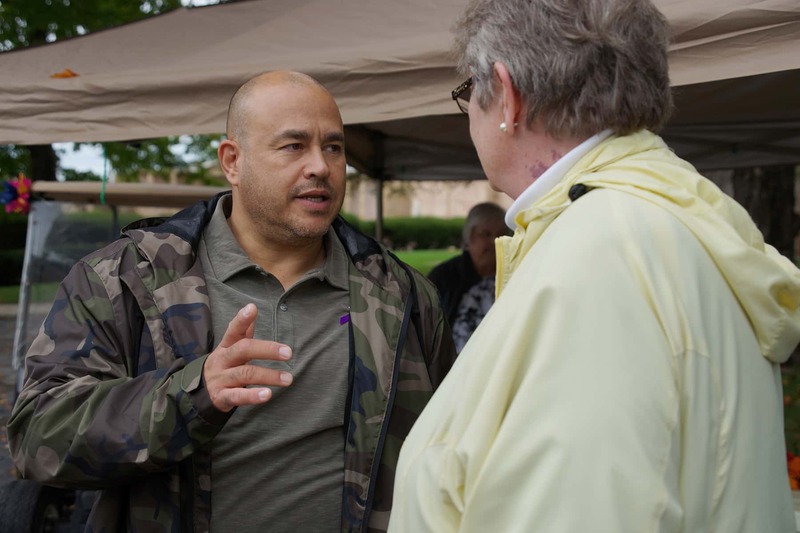 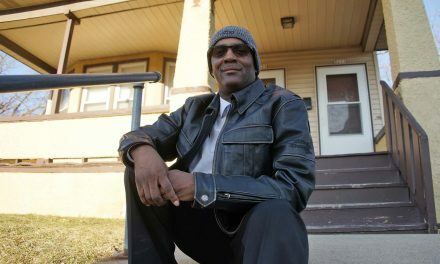 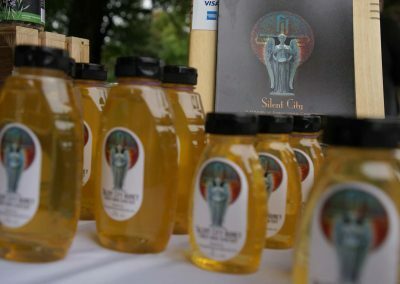 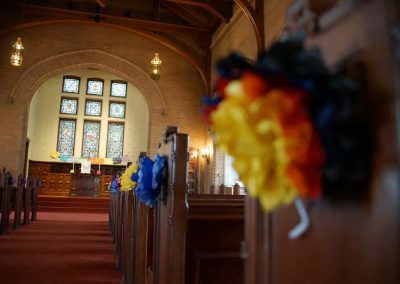 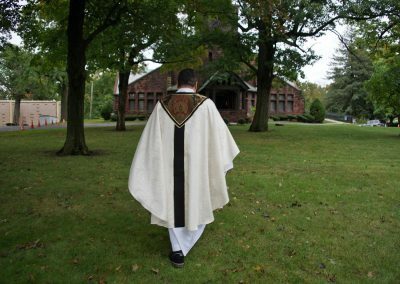 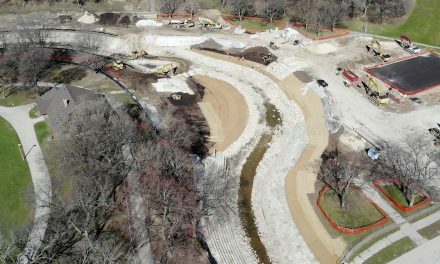 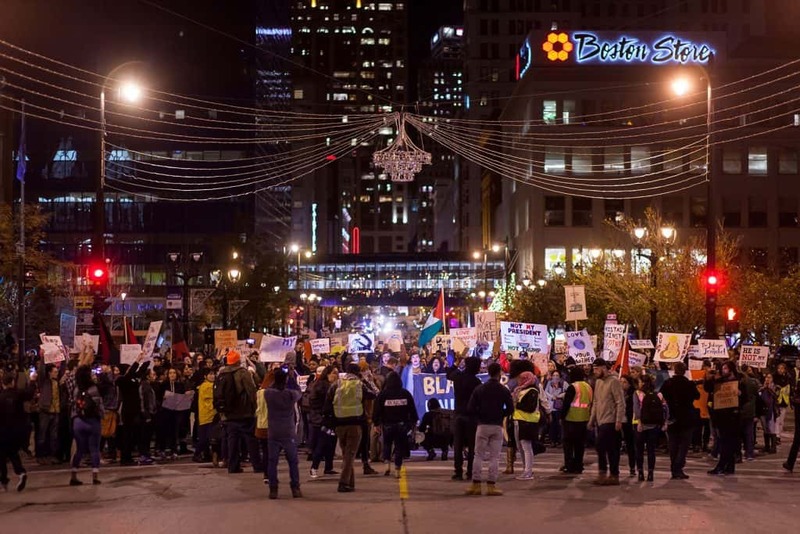 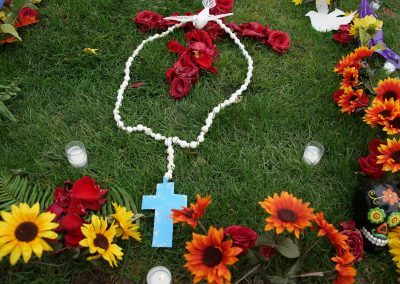 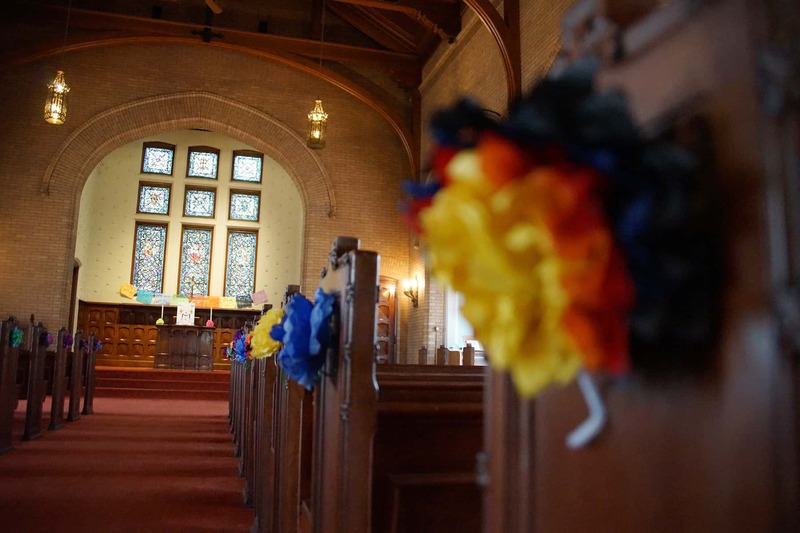 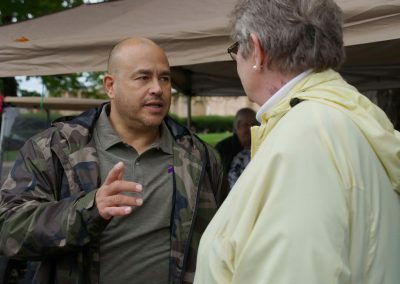 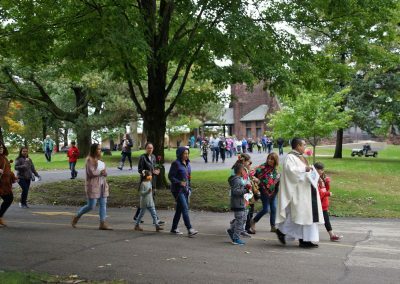 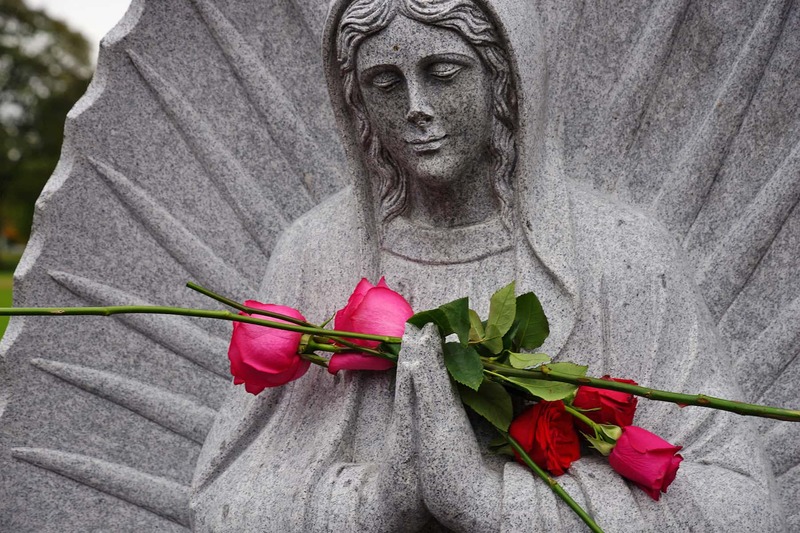 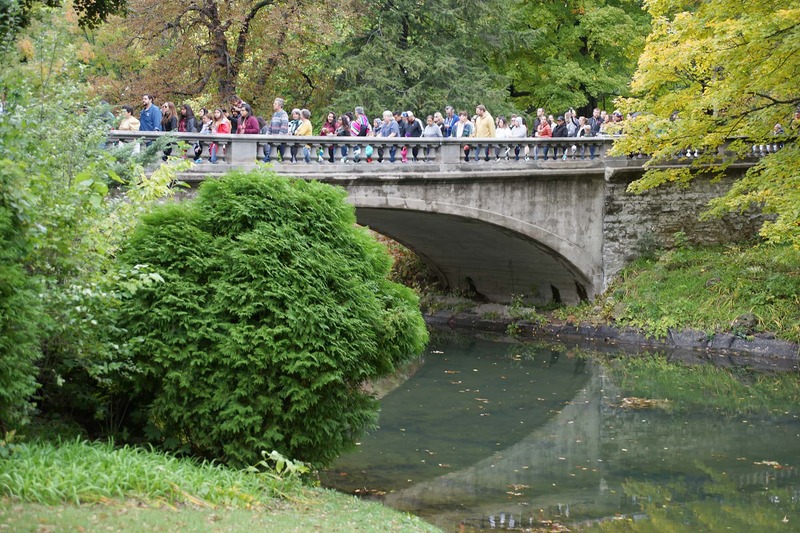 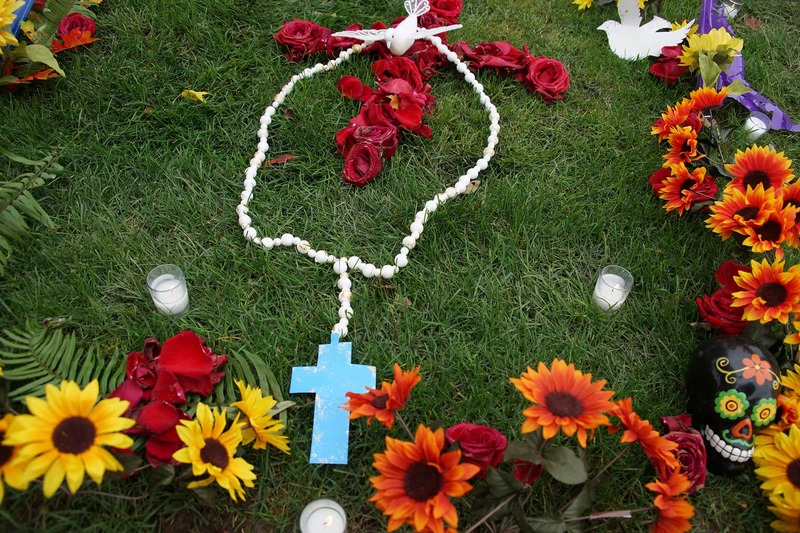 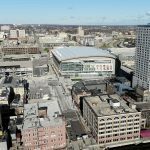 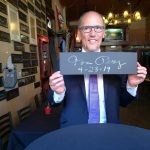 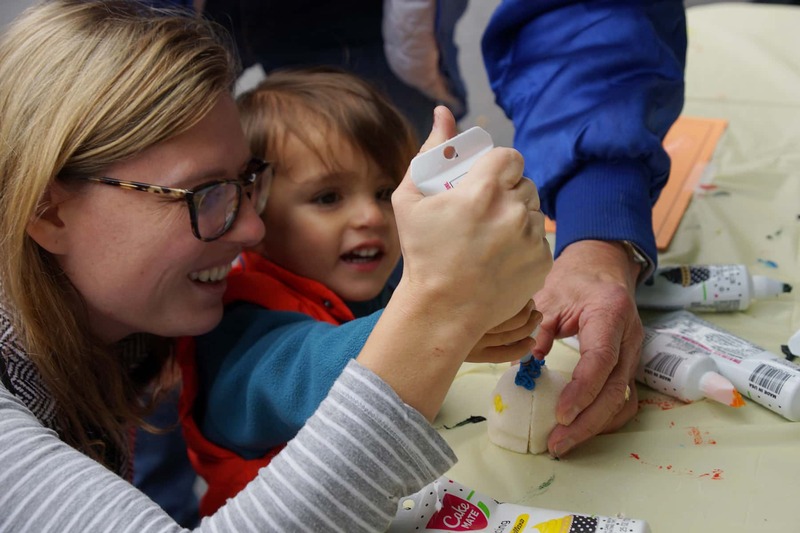 These images highlight scenes from the special day when members of the Milwaukee community gathered to pray for lost family, remember friends, and help support those who have died on their spiritual journey.